It’s exciting for me to write this October update – it was in October of 2012 that I wrote my original blog post as a Phipps Botany in Action Fellow. It’s been two great years and it’s fun to look back on all the different aspects of my research. And next month, I’ll have a brand new site for my blog too so I can continue posting updates long after I’m a BIA fellow! 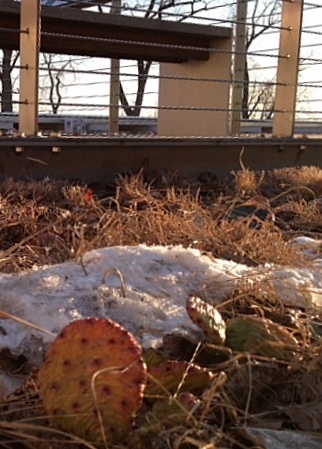 It’s beginning to look like fall on the green roofs – goodbye until the spring! The temperature probes are buried once again and ready to record temperatures throughout the winter. 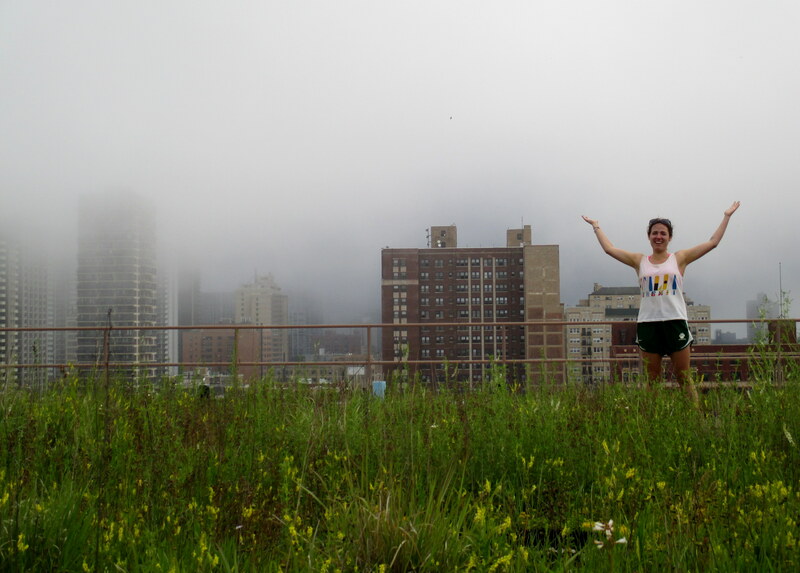 This past month, I finished up the last of my outdoor research on the green roofs. Most of the plants are still alive and well but you can tell that they’re getting ready for the winter. They are almost all finished flowering and have begun to lose their leaves or turn red: a sign that fall is officially here and winter is not far behind. I still need to visit two of my green roofs in early December to dig up my temperature probes and read the data one more time, but for most of my sites, the temperature data has been collected and the little probes are buried once again so they can continue recording data all winter long. I bet they’re going to get cold – I know I sure wouldn’t want to be on top of a roof in Chicago in the middle of winter! 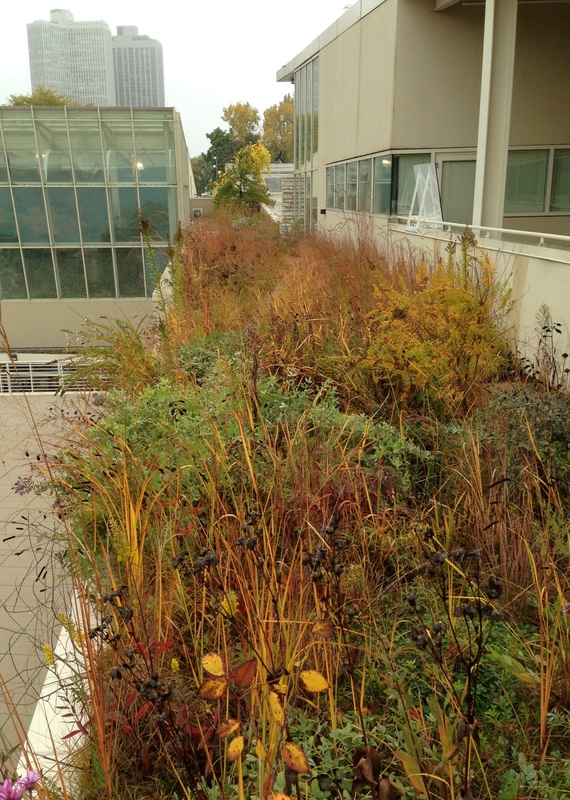 The prairie plants on this green roof are starting to show their “true colors.” It sure looks like fall to me! My potted plants are buried under mulch and are hopefully settled in for a cozy winter. Hopefully the other plants that I took down from the roofs and finally buried under mulch in their “over-winter station” won’t be too cold. I’ll have to wait until next spring to find out. 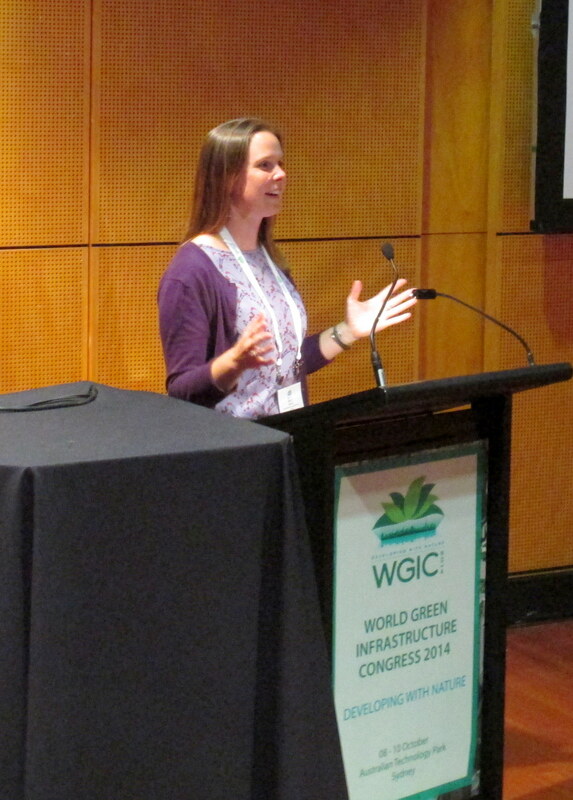 One of the most exciting parts of my research this past month was an opportunity to speak at the World Green Infrastructure Network’s annual conference in Sydney, Australia! I’ve never been so far away before and (despite the very long plane ride) it was really interesting to see how people on the other side of the world build green roofs and other types of “living” buildings that include plants all over the outside walls. 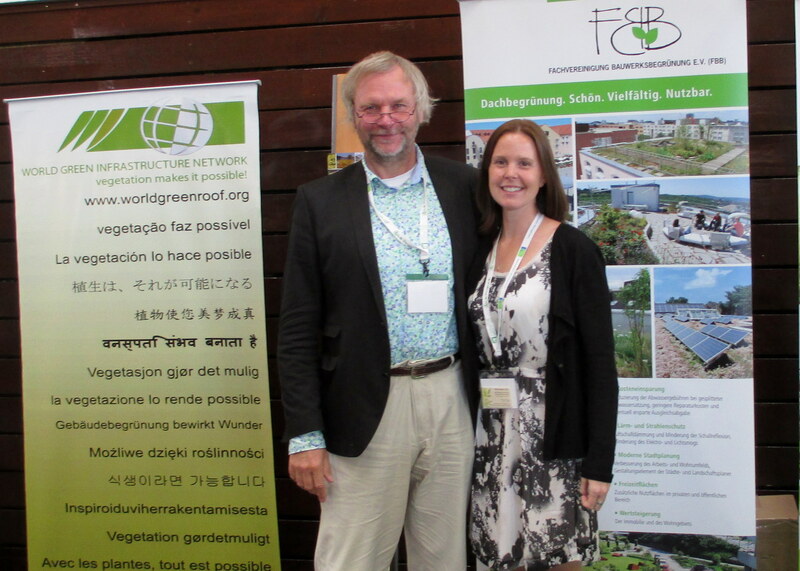 Sharing my research with the audience at the World Green Infrastructure Network’s conference. I think my presentation went well too and a lot of people asked me questions about how to design green roofs that support a larger variety of plants like the ones I’m using in my research. I didn’t have time to travel to any of the great national parks in Australia this time… I guess that just means I’ll have to go back to see all the amazing plant diversity “down under” at another time. Laboratory research is underway. 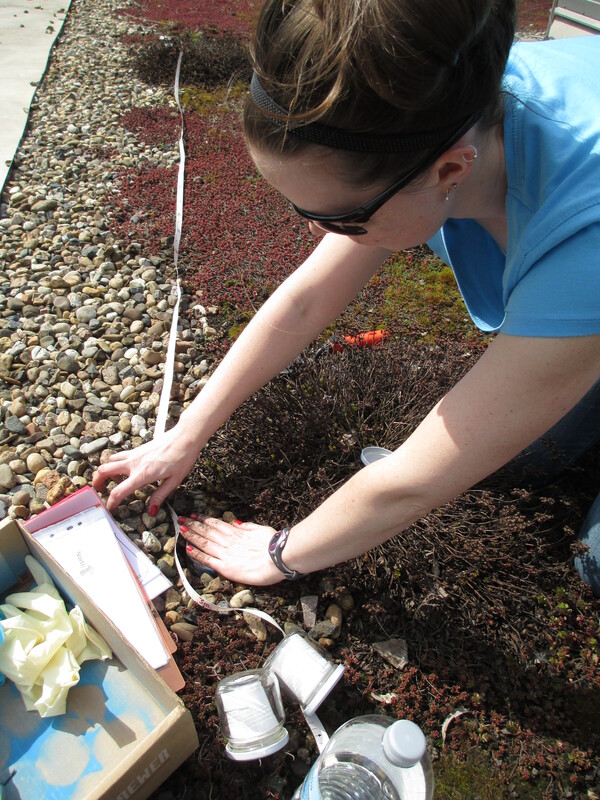 y research team and I determine the best procedure for measuring the amount of water in the green roof soils. Once I returned from the conference, it was time to get back to work. At this time of year, that now means either writing or working in the laboratory. With my research team at Loyola University, we ran a few experiments on the green roof soil we collected to try and learn how much water the soil could hold. We just started taking some measurements and beginning to learn if there are differences in the soils as a result of the plants and tiny microorganisms that we put there earlier in the year. 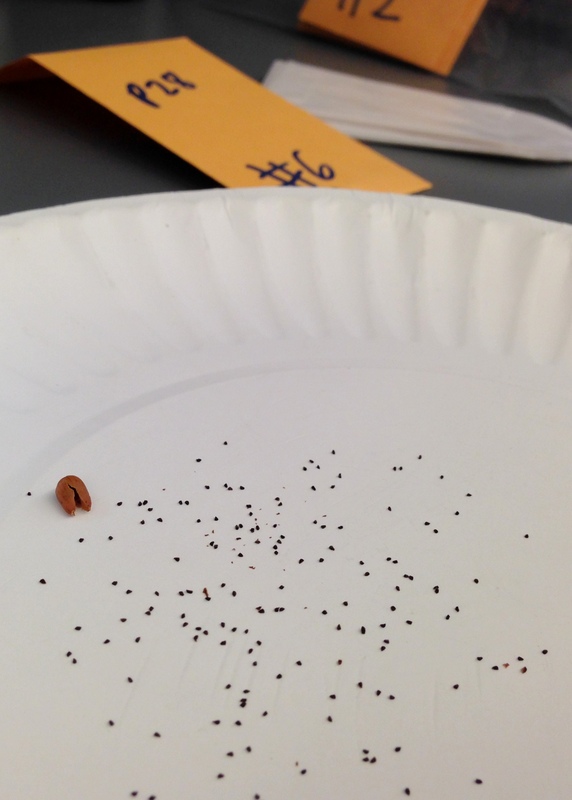 Counting tiny seeds can be tedious work. I also started working with the more than 300 fruits that I collected from my experimental plants back in August. I’m now carefully weighing each one and then cracking them open to count all the seeds to learn which plants were better at reproducing. 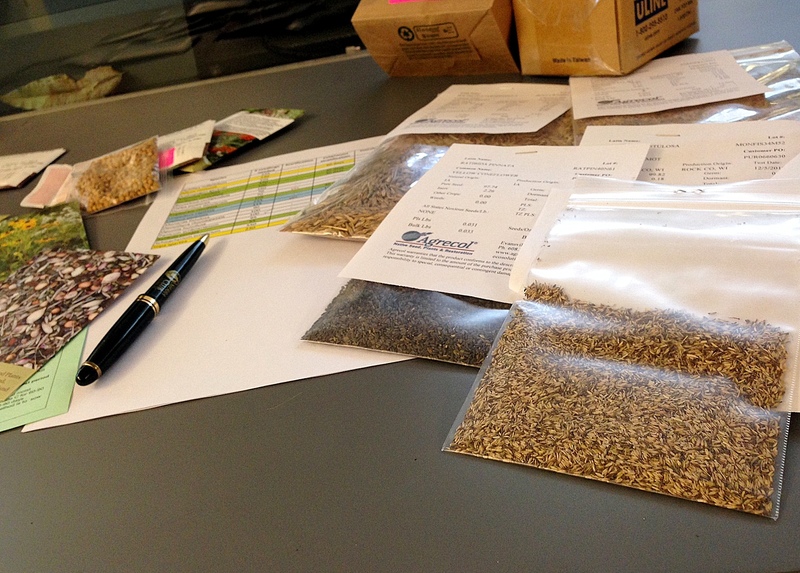 I then save all the seeds for the next part of my experiment… to be continued! Each one of my dried fruits can contain hundreds of tiny seeds. I have to use a microscope to find and count them all. The prairie grasses that I planted in the spring are flowering now. The green roofs are starting to look a little more like prairies! Is it fall already? It’s sure starting to look like it on the green roofs. The plants are starting to turn brown and become dormant or inactive for the winter. Some of the plants have been pollinated and now have seeds that fall off, get buried, and maybe grow into new plants next year. It’s exciting to see how the changing seasons affect the plants. 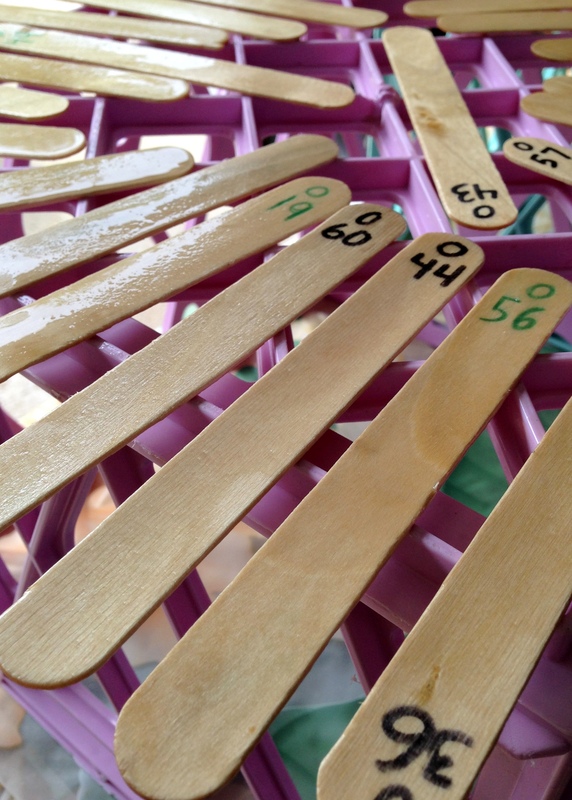 New labeling sticks coated with water-resistant sealant air dry. They should be tough enough to last through the tough winter weather. My research outside is just finishing up. In September, I collected samples of the soil on green roofs so I can see if there have been any changes since I last checked in April. I also collected data about the temperatures on the green roofs. Over the summer, I had buried these little electronic probes that record the temperature in my green roof trays every hour. In total, I put 48 probes in the trays and 4 outside the trays to see if there were differences in the temperature between the different experimental treatments that I set up earlier in the season. I don’t know what the results are yet because there are THOUSANDS of temperature readings to go through, but when I have some more information, I’ll update the blog. For now, I’ve buried the probes yet again so they can keep recording data all winter long. I have to dig them up again in December to read the data and reset them for another round. Hopefully they won’t get frozen! 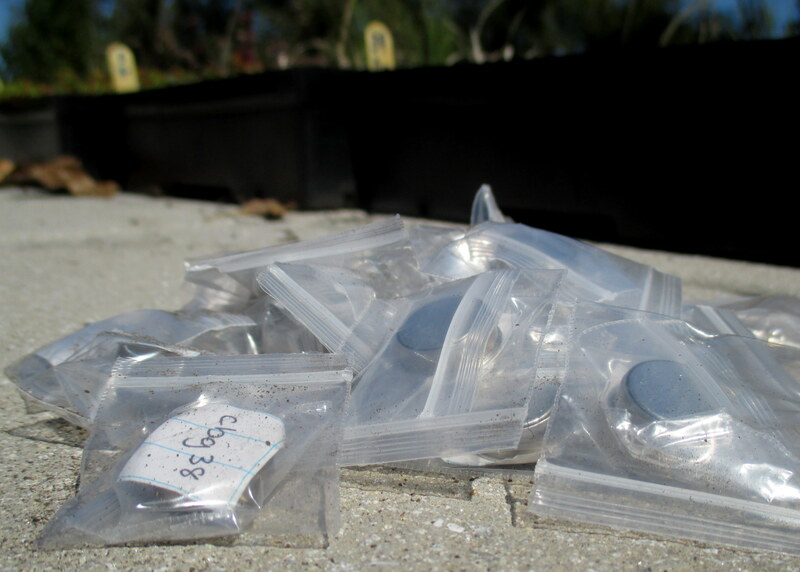 My little temperature probes are cleaned, repacked, and ready to get buried for another couple months on the green roof. 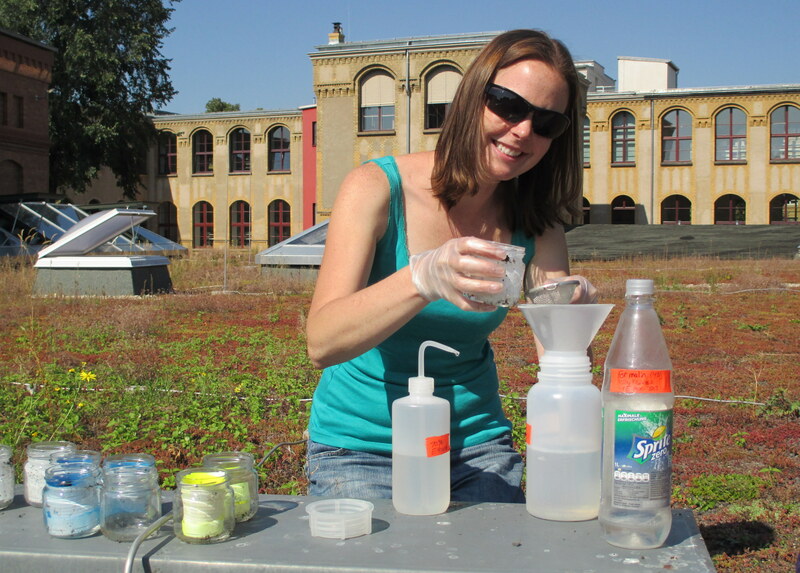 I collect soil samples from the green roof in the fall to compare to soil that I collected in the spring. Hopefully my “over-winter” station will insulate the plants’ roots enough so they don’t die in the cold Chicago winter. Speaking of frozen, I also set up an “over-winter” station for some of the plants that I’m hoping to keep alive over the winter so I can use them in another experiment next summer. These plants are in pots and if I leave the pots out during the entire Chicago winter, the soil will probably get really cold and the plants’ roots will freeze. 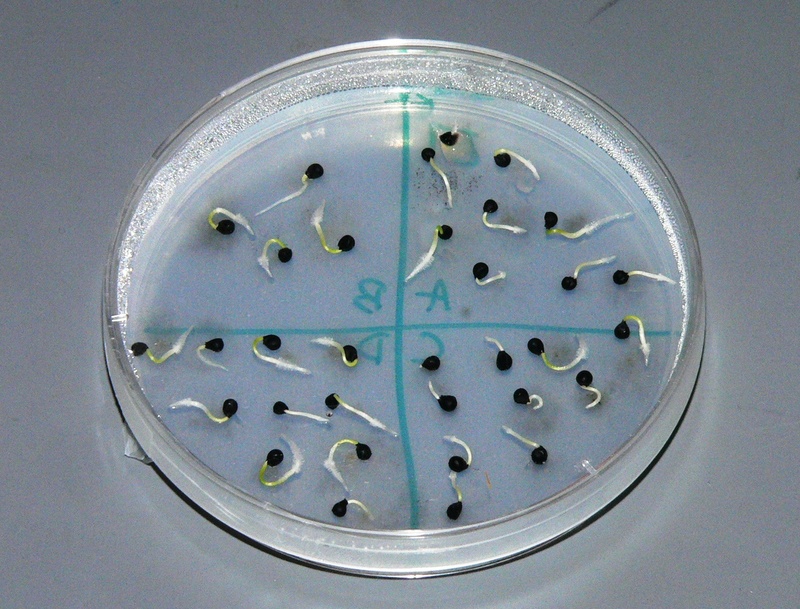 This would kill the plants and be very bad news for my experiment. 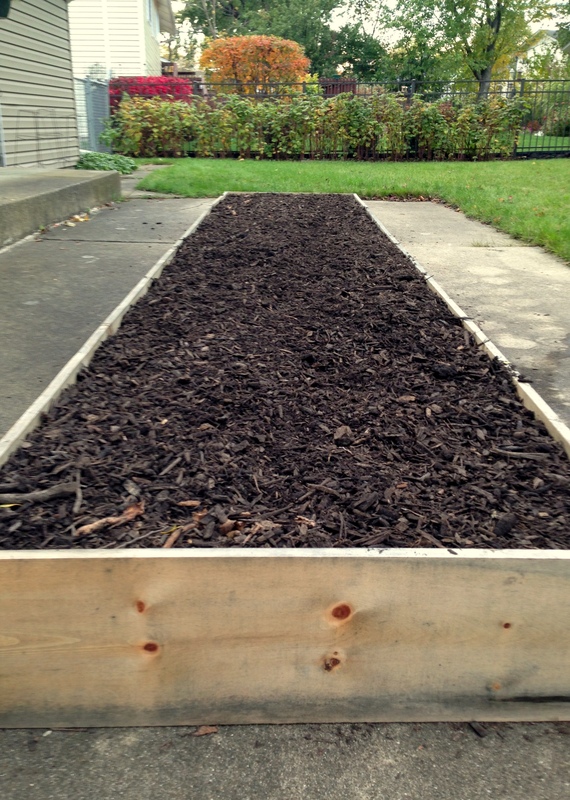 I’m hoping that my over-winter station, which will be filled with cloth, sand, and wood mulch, will help provide insulation so the plants don’t get quite so cold during the winter. It’s a little scary to put a lot of work into this project and not know for sure if the plants will survive. I’ve got my fingers crossed! 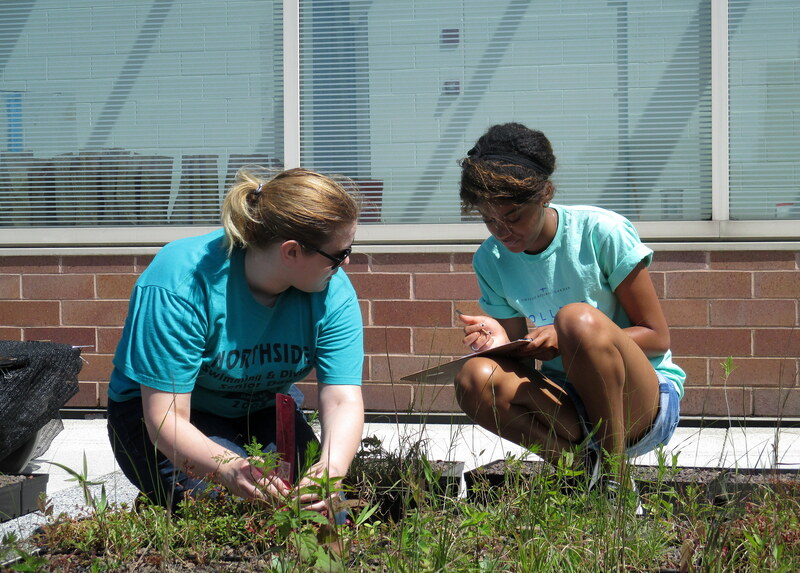 Undergraduate interns at Loyola University help with soil and temperature data collection on the green roofs. Also this past month, a new report that I wrote with some colleagues was published in a scientific journal called The Great Lakes Entomologists. In the report, we identified some of the different types of bees that are found on green roofs in Chicago. We didn’t collect bees from very many roofs but we found that there were 26 different kinds, or species of bees. I think if people planted a larger variety of the plants that bees like to use for food, there would be even more species of bees! But that would involve some more research and I can’t say for sure. If you’d like to read the report, you can click the link HERE. It might be a challenging read if you’re not used to the style of scientific journals but maybe you’d like to see it anyway. As September comes to a close, I’m getting ready to talk about some of my research at a big conference for the World Green Infrastructure Network (WGIN) in Sydney, Australia. Check out my blog updates next month to read about what will probably be a great experience in October! August was filled with more data and some new beginnings. The weather got a bit hotter and drier – it actually felt like the real Chicago summers that I’m used to! This was good and bad news for data collection. The experiment that I was conducting using the green roof trays dried out very quickly from the lack of rain. By the first week in August, just about all the plants had dried up and turned brown. But I’m not too worried just yet. It’s possible that some didn’t get enough water and died but I’m pretty sure that other perennial plants (ones that will come back again next year) might just be dried out for the year. I’m crossing my fingers that many of the plants from this experiment will grow and flower again next summer. Many of the seedlings that I planted back in the spring are still doing very well – some even have fruits! The seedlings that I’d planted in the other green roofs were not as affected by the hotter and drier weather and are actually doing quite well! Some of the plant species were doing better than others, but overall they looked pretty good. My research team and I took the last of our measurements for this experiment. I’ll go back every few months throughout the year to collect data from our temperature probes, but it’s just about time for most of the plants to stop growing and become dormant for the winter. 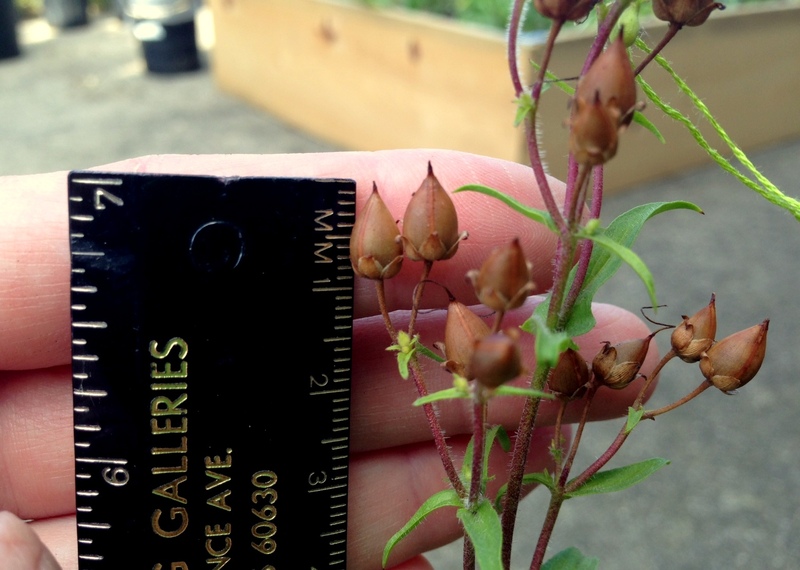 I have been monitoring the plants that used to be on the green roofs to see when they develop fruits with seeds inside. My third experiment of the summer is just about to wrap up too – well, the outdoor part anyway. After moving all my potted plants off the green roofs and to a new secure winter location (my parents’ backyard – thanks Mom and Dad! ), I counted the number of flowers and fruits and started collecting seeds from these plants too. After the last few remaining plants have ripe fruits to collect, I will begin my work in the laboratory, where I will clean the seeds and grow them into baby seedlings for future DNA collection. I measure all the fruits I collect. Will the bigger fruits have more seeds? I’ll be finding out as I clean and count all the seeds this fall. Two summer interns that were working with me over the past few months had to finish up their research projects and present their work to a large audience. They are now both seniors – one undergraduate and one high school – and are back in school. I’m very proud of the work that they did and their final presentations were both excellent! I will miss their hard work, positive attitudes and smiling faces but I’m sure that they will be doing well in their future studies – hopefully studies that also involve botany! Monica and I celebrate her last day of data collection as an intern for the REU program. It was a great summer! 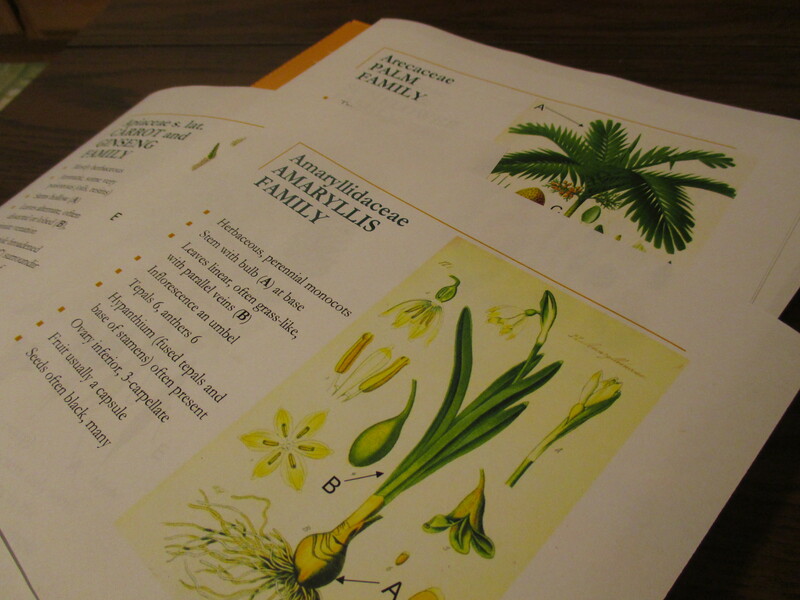 I am getting handouts ready to teach a class about plants and their importance to people for the Fall 2014 semester. And it was back to school time for me too, but this time as both a teacher AND a student! 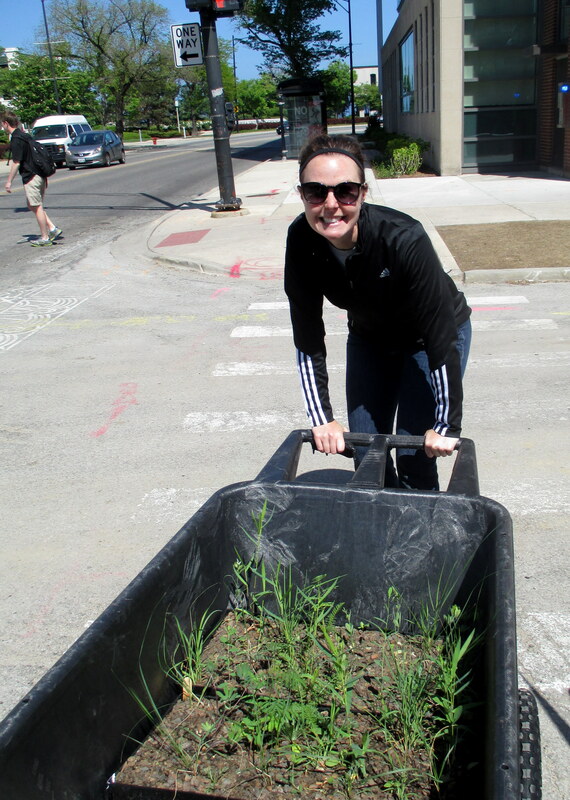 In August, I started a new job as an instructor for Loyola University’s Institute for Environmental Sustainability. I’m helping students learn about plants, their structure, their importance, and the ways that plants and people affect each other. I couldn’t think of too many other classes that I’d enjoying teaching more than this one and I feel very fortunate that I am able to share some of my knowledge, passion, and research with interested undergraduate students. Many of my seedlings are still alive on the green roofs! I collected more plant survival data this past month. July has surprisingly been a great month for working on the green roofs. I am so thankful that summer has been pretty cool in Chicago this year. Because we had good weather and because I’ve had a great team of interns to work with, I’ve been able to finish a lot of data collection this past month. There is still a lot more to be done out on the roofs, but I can see the light at the end of the tunnel. 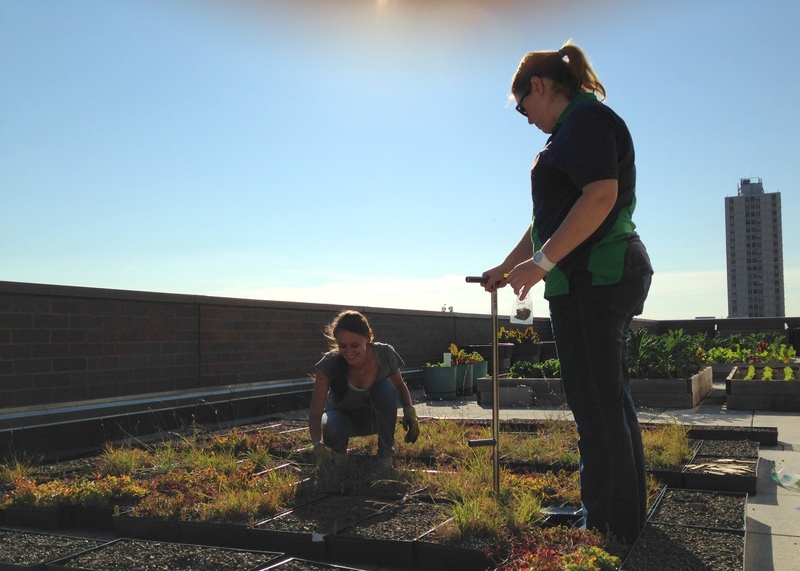 My intern team and I recorded plant measurements on the green roofs this past month. 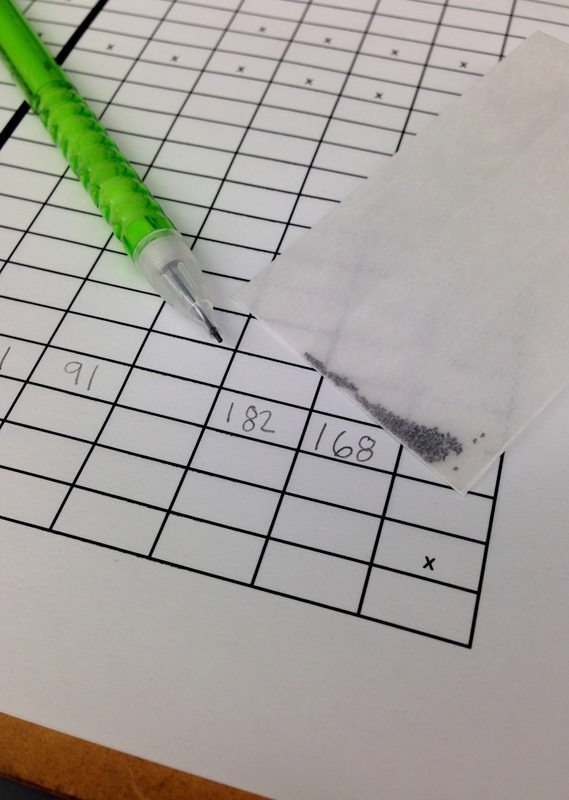 We will compare these measurements to those that we collected last month and the month before. 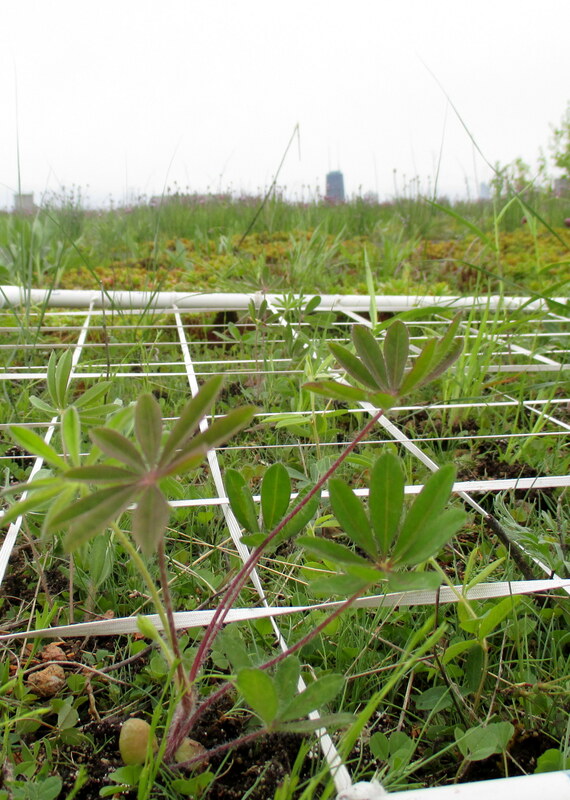 This past month, I continued collecting data about the plants growing in my experimental trays and in my green roof plots. I’m happy to report that a lot of them are still living and growing – some of them are even flowering and are making the green roofs look a little bit more like prairies than gardens, which I find really beautiful. 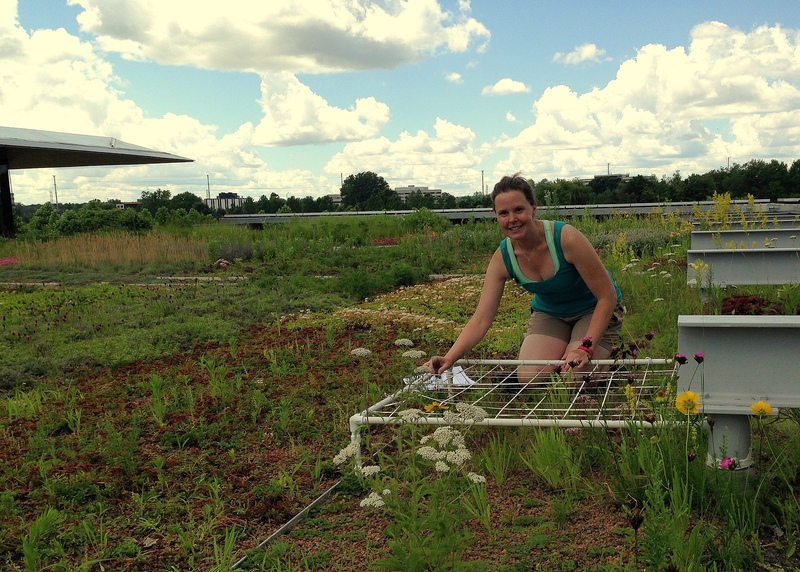 My intern team and I set up and buried temperature sensors in our experimental trays and plots on the green roofs. We are hoping to collect temperature data all year round. To start collecting a different type of data, my team and I organized and buried temperature probes on the green roofs in July. These probes can measure the temperature of the soil every hour and tell us if some of the plants on the green roofs are helping to cool the buildings during the hot summer months. 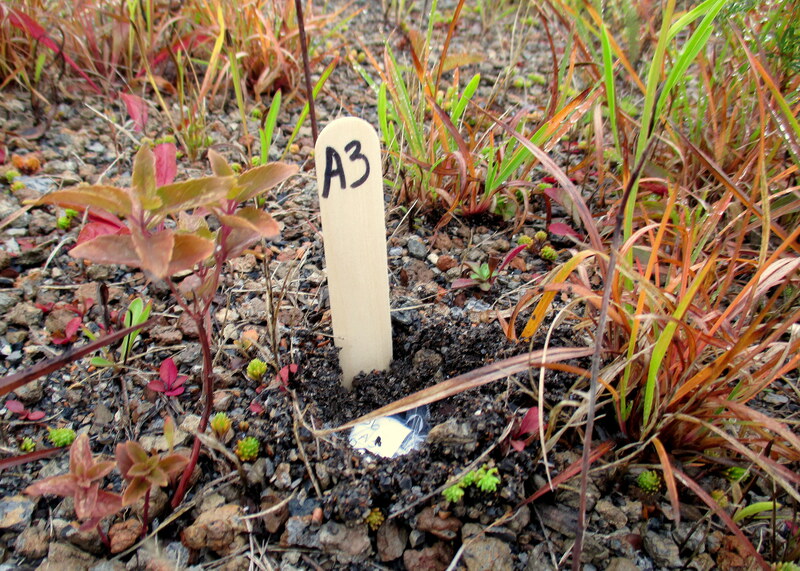 Next month, I’ll go back to the green roofs to collect the temperature probes and record the data from them. Then I’ll burry them again and keep collecting data about every 2 months to find out how the temperature of the green roofs changes in the winter. Aside from measuring the relative amount of rocks to fine grainy soil, my team of interns and I are measuring the amount of certain important nutrients that are in the green roof soils. 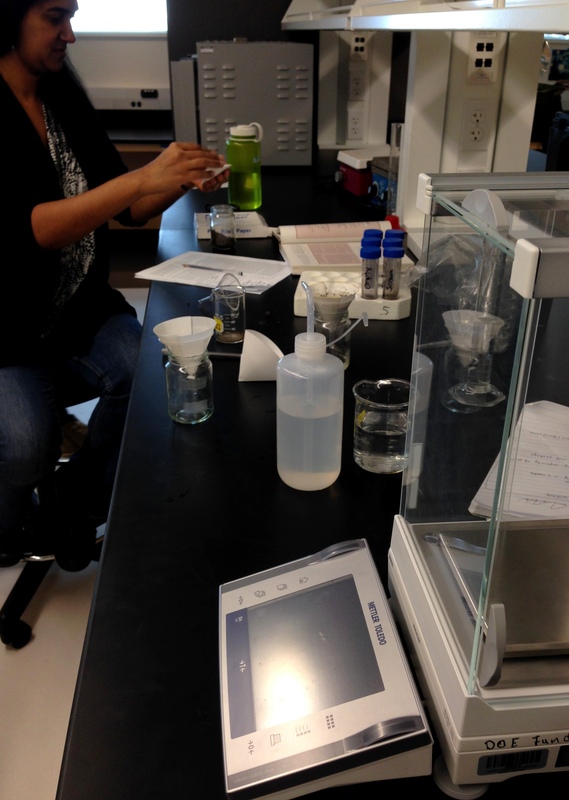 Monica and Rachel have fun setting up chemical tests in the lab that will tell us how much fertilizer is in the green roof soil. 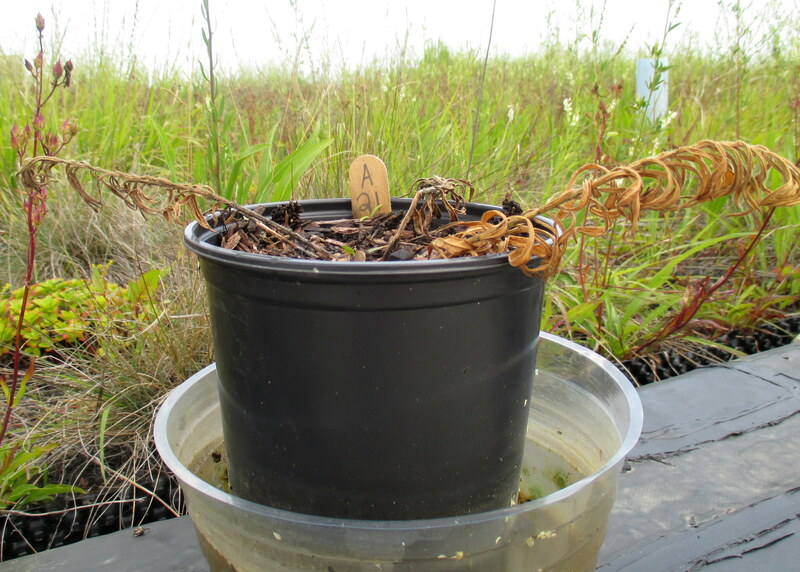 To help explain differences in plant survival and growth, my team and I also measured the “infiltration rate” of the green roof soils. Infiltration rate is a measurement of how fast water can soak into the soil. If the rate is very fast then the water might be moving through the soil too quickly for the plants to be able to use it. In areas that have a slower infiltration rate, the soil usually stays wet for a long time and the plants can absorb more of the water through their roots. While we were getting dirty in the soil collecting the infiltration rate data, my team and I also collected soil samples. We then dried these samples in an oven for a few days and used the dried soil to perform tests in the laboratory that helped us learn about the nutrients and the structure of the green roof soils. We will use this information to help explain why some of my prairie plants are growing well on certain roofs but not on others. I’m very lucky to be working with a great team of interns this summer! 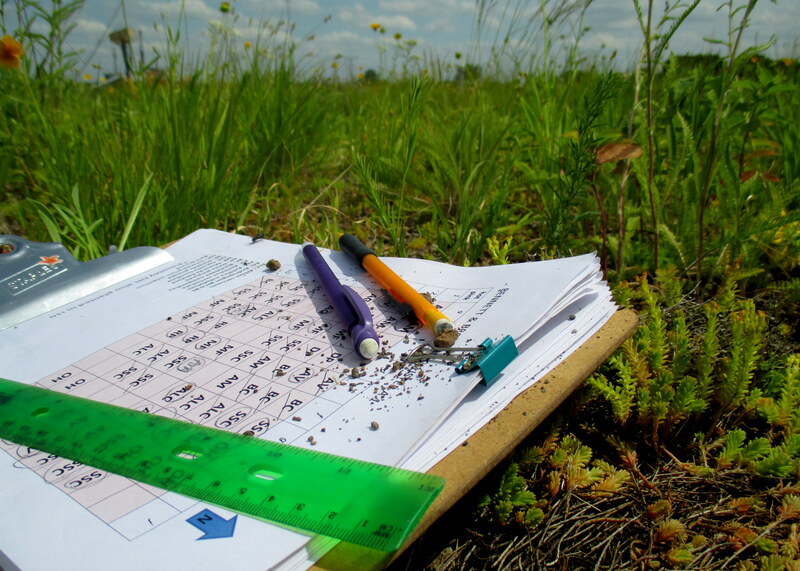 Together, we collect data from the plants, pollinators and soils on the green roofs. 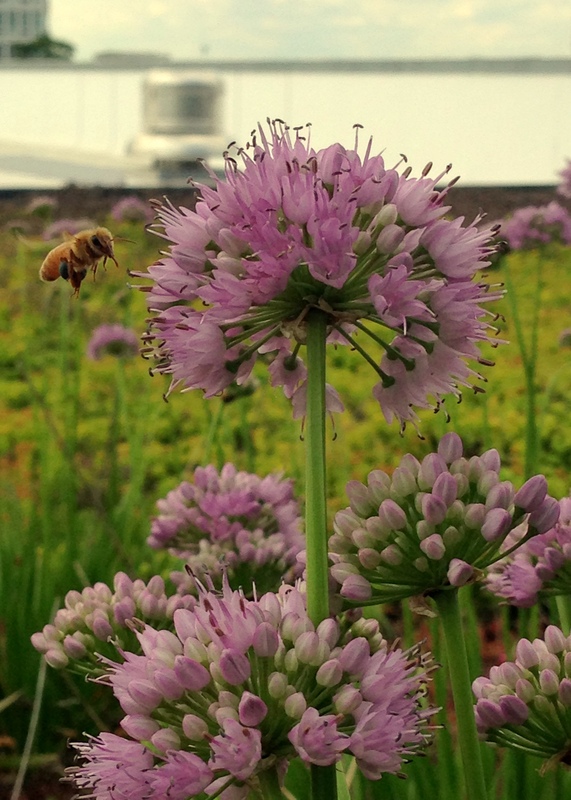 Part of my research requires me to count the number of pollinating bees on the green roofs. Here comes one now! In July, there was still a lot of rain like last month but there were a few days in there where I was able to collect data on which bees and other pollinators were on the green roofs. On some roofs, there were almost none, while on others there were so many that all the buzzing from the bees was quite noisy! I didn’t see too many of the bees actually visit my potted plants that I had set out on the roofs back in June, but some of my plants had fruits that were starting to form. These plants need to get pollen from other plants in order to make fruits so this is a sign that something is up on the roofs doing the pollinating. 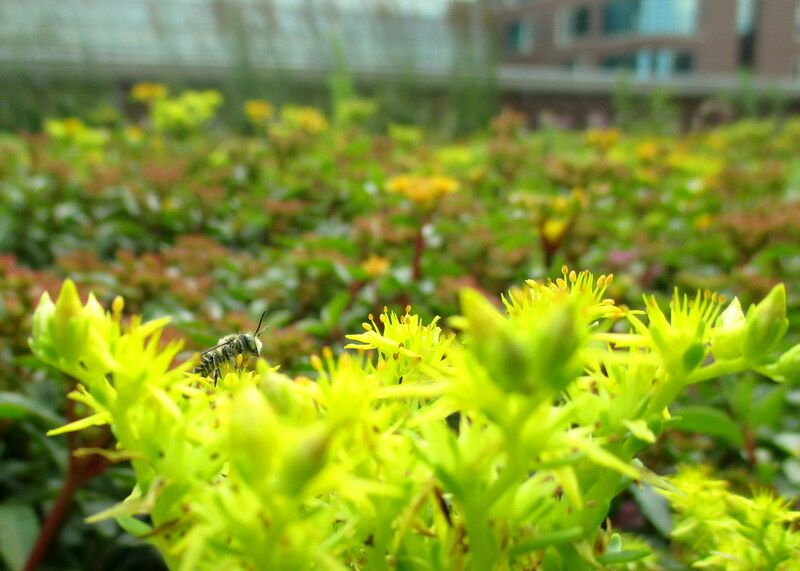 A small bees stops to take a break on one of the green roofs in Chicago. Not all of my experiments were successful this summer. This poor milkweed couldn’t handle the harsh environment of the green roof. The plants were pretty much finished flowering by the end of the month, so I packed them up and took them off the roofs. I should note that not all of the plants did so well on the roof – actually a lot of them didn’t make it at all. But that’s plant science for you! Next month, when the fruits are ripe and the seeds have developed, I will collect seeds from each of the plants and grow them into little seedlings in an incubator. The step after that will be to conduct a paternity test to find out if pollen is moving between green roofs… but that is work to be done indoors when the weather is not nearly so nice as it is now. As usual, there is much more to come! These plants are finished flowering so I removed them from the green roof. They have mesh bags around them so none of the developed fruits or seeds fall off and into another pot by accident. Field season is in full swing! This is the time of year when we plant scientists get to work outside a lot – a very exciting and fun time of the year for me! Some of my data collection tools are pretty basic, but very necessary to measure the growth and health of prairie plants on green roofs. 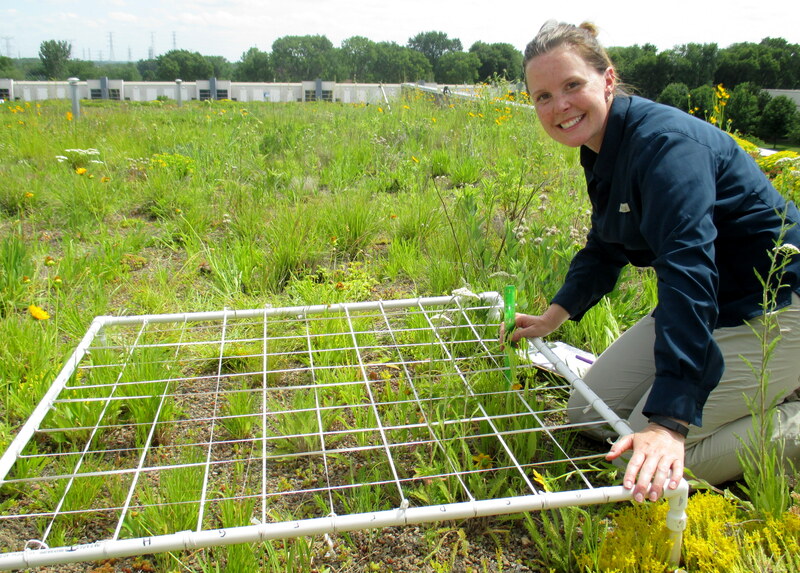 Each month, I use my grid to locate the plants to be measured on the green roofs. 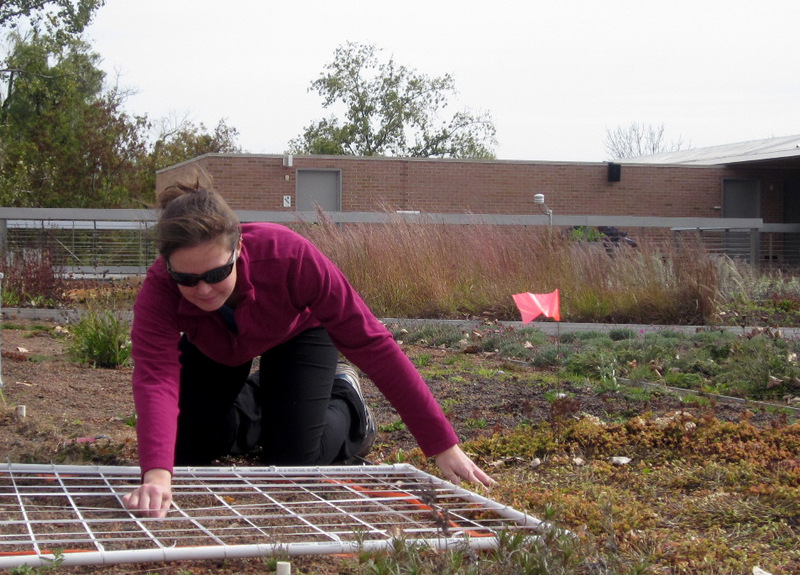 This past month, aside from some writing and editing tasks, I’ve been busy visiting all of my green roof sites to collect data. I’ve been measuring the survival and growth of my little seedlings, both in the experimental trays and in the continuous roofs. I still use my handmade grid to locate the plants each time I return to a site, as you can see in the picture. I’m happy to report that a lot of the species that I planted are doing quite well on the green roofs! We’ve had a lot of rain recently and it hasn’t been as hot as it normally is in Chicago by this time of year (although on one of the days that I was measuring the plants, it was over 100 degrees on the roof!). So while this is generally not great weather to go to the beach, the plants on the green roofs seem to love it. I’ll continue to monitor these plants each month in the future too: I’ll return in July, Aug, and September of this year and then again in 2015. Most of the plants in the experimental green roof trays are really doing well with all the rain that we’ve been getting in Chicago. 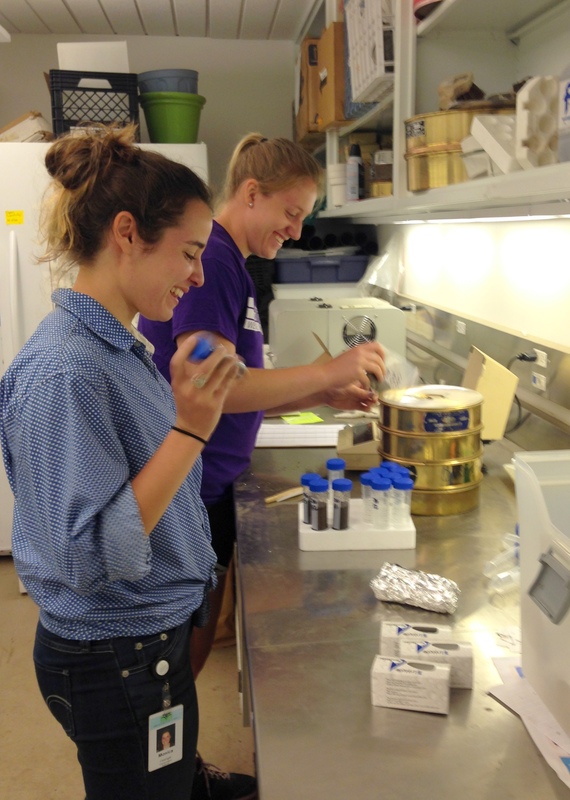 An exciting addition to this experiment is the help of my undergraduate intern, Monica from Amherst College in Massachusetts. 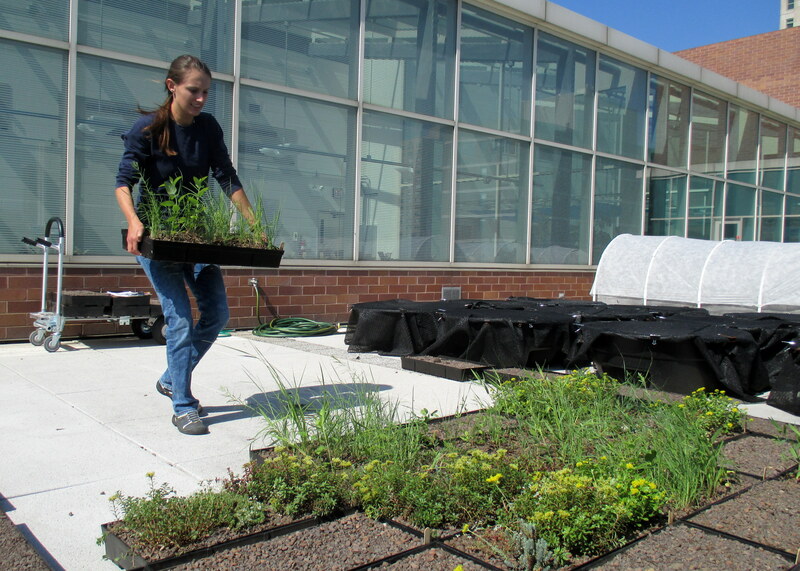 Monica will be conducting an experiment using the planted plots on three of the green roofs to determine how small difference at each site might be helping some of the plant species to survive. I’m excited to help her answer this question! I set up the potted plants on top of the green roofs on a rainy day in June. 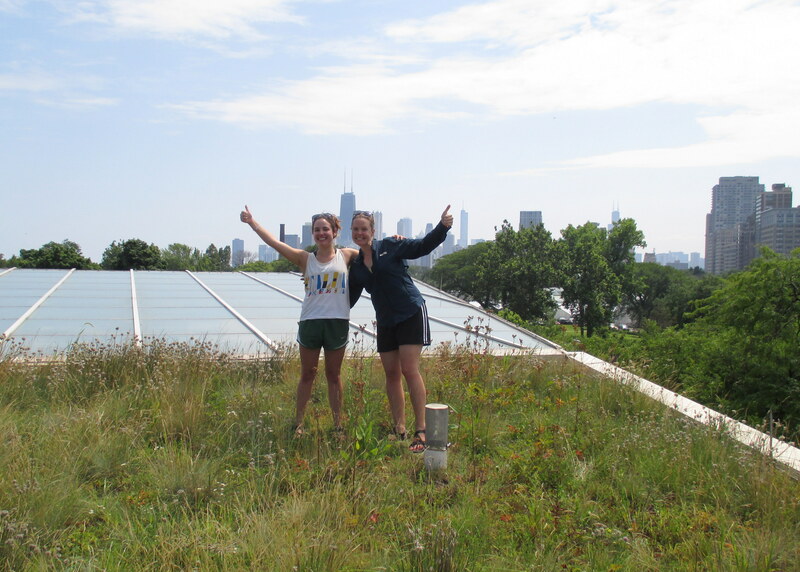 In June, I also put 150 potted plants out on 10 green roofs for a new experiment (with help from two wonderful interns at Loyola University). I will determine if bees, butterflies, moths, and other pollinators are moving pollen from these plants between the roofs. I also started measuring other aspects of the green roofs that might be attractive to pollinators, such as which other flowering plants are present. One measurement I’ve been trying to make is called “pollinator observations.” This involves watching my chosen plants for about 30 minutes and recording all the insects that land on the flowers. It is pretty easy to do and can provide helpful information about the types of insects that might be pollinating my plants. But, unfortunately, I’ve been having trouble doing this because I can only take these measurements on warm sunny days and my green roofs are right along the shore of Lake Michigan, which keeps getting very foggy. Apparently, the winter in Chicago was so freezing that the giant lake is still really cold and when the cold air above the lake mixes with the warmer air in the city – presto! – you have big clouds of fog. I didn’t think that this past winter’s weather would still be affecting the weather now, but there are so many ways in which different aspects of the environment are connected. I guess that’s one of the things that keeps science interesting for me! I’ve got my fingers crossed that it will start to become a bit sunnier and that all the plants I set out will begin to flower and attract pollinators. Things should start to pick up in July – I’ll let you know next month. My potted plants are visible among the rest of the green roof vegetation on this building (they’re the five little dark dots), as seen from another green roof. Will the pollinators also see flowers on both roofs and move pollen between them? I’m trying to find out. I use my 10 x 10 grid to plant the native prairie plants on the green roofs. Time to break out that nail brush! May has been a busy month with lots of planting and getting down and dirty with my research. It’s great to see some progress being made and some plants beginning to grow on the green roofs. I feel like all that dirt under my nails at the end of the day is a badge of honor or at least an indication that I’m doing some real plant science! The weather on the green roofs can be very variable. When I was plating plugs on this day, it was in the 40s. The following week, it was over 100 degrees on the roof! 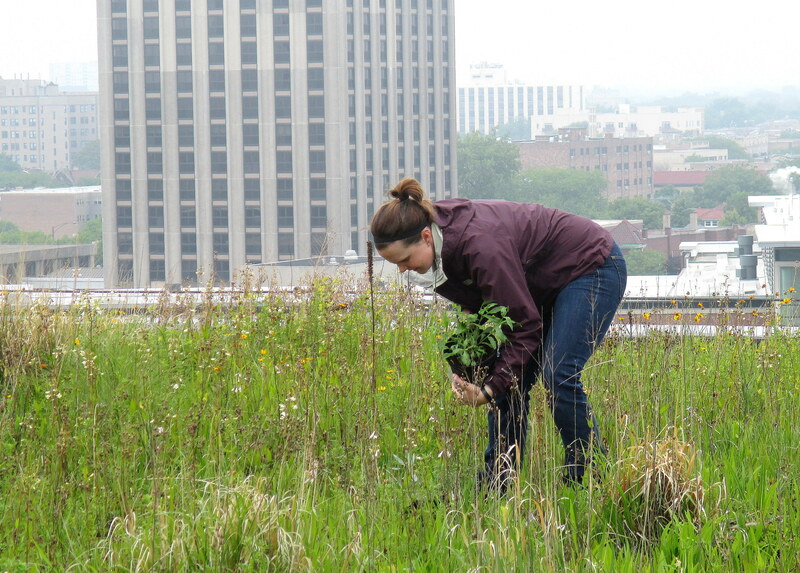 This past month, I visited the green roofs where I planted seeds in the fall of 2012. I collected data on which plant species were able to germinate (start growing from seeds), survive a historically cold and snowy Chicago winter, and begin to grow this spring. Some species were more successful than others but I was happy to see a lot of little prairie plants poking out from under the green roof soil. Even a couple of the native cacti that I planted had germinated, something that is very rare! The process of germination can be difficult, especially on the dry green roofs, so I am also testing the plants’ abilities to grow if they are started from small seedlings. These seedlings are sometimes called “plugs” because when you plant them, you open up a little hole and then “plug” in the seedling. It took a long time to plant over 1,000 plugs into specific locations on several green roofs but now they are all in and hopefully have begun to grow. In a couple weeks, I will go back to all the roofs and begin collecting data on the survival and health of the new plugs. 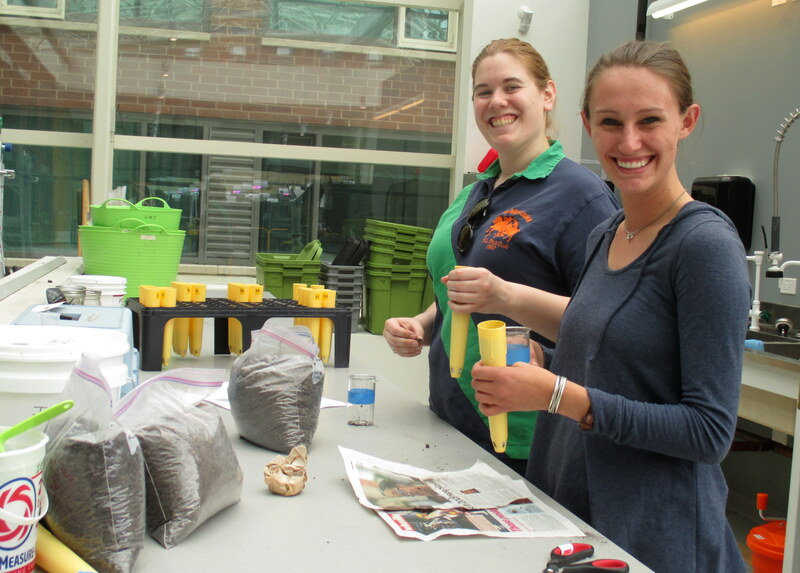 Interns Sarah and Susanna set up an experiment to measure the amount of fungi that are living in the green roof soils. 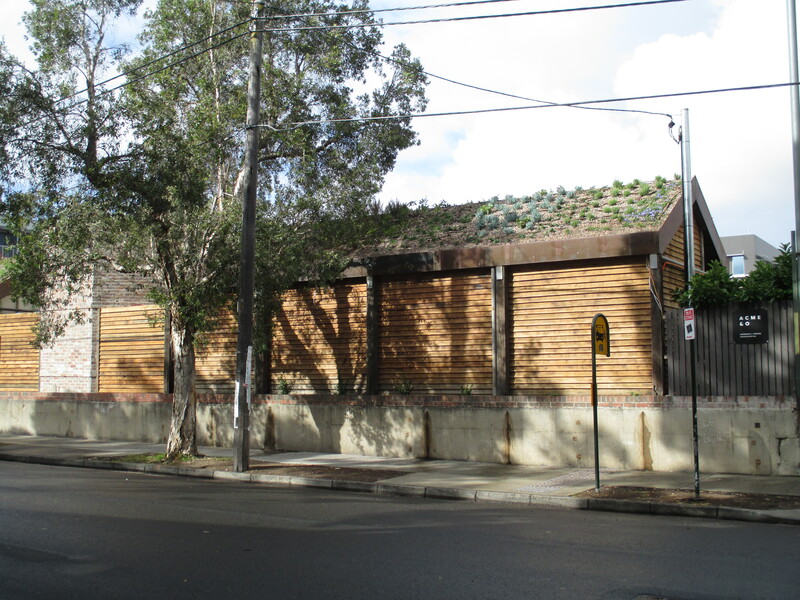 It took a while to move all these green roof trays across the street and up to the roof. I bet some passing cars were wondering what I was up to! All of the experimental green roof trays that I also planted with plugs are now out of the greenhouse and on the roofs. It took more time than I thought just to move the trays (120 of them) to where they belonged, but I am happy to say that they are now greening up the Chicago skyline. Luckily, I’m now working with two wonderfully talented and dedicated undergraduate interns at Loyola University whose work is really helping me out too! The environment on the rooftops is much harsher than in the greenhouse, so I’m a little worried about the plants’ abilities to survive. It has been getting pretty hot up on the roofs lately and it hasn’t been too rainy so I’m keeping my fingers crossed that there will still be plants from which to collect data throughout the summer. If not, well…. that’s science! It’s all part of the experimental process. Sometimes things go as predicted and sometimes they don’t. 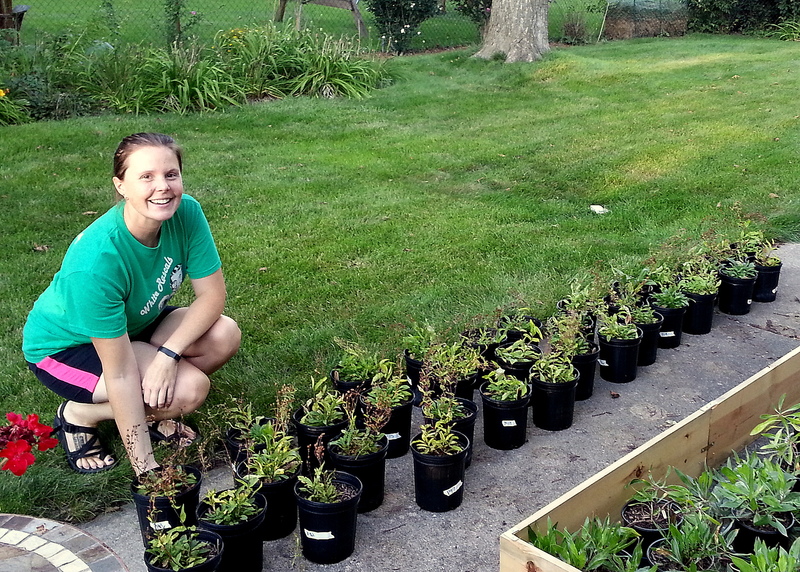 Intern Susanna helps me set up the green roof trays at Loyola University. Yes! The trays are out on the roof! Our research team will be collecting data here for the rest of the summer. I have the plants for my new experiment set up in the greenhouse. When they are flowering, I’ll move them outside to the green roofs. 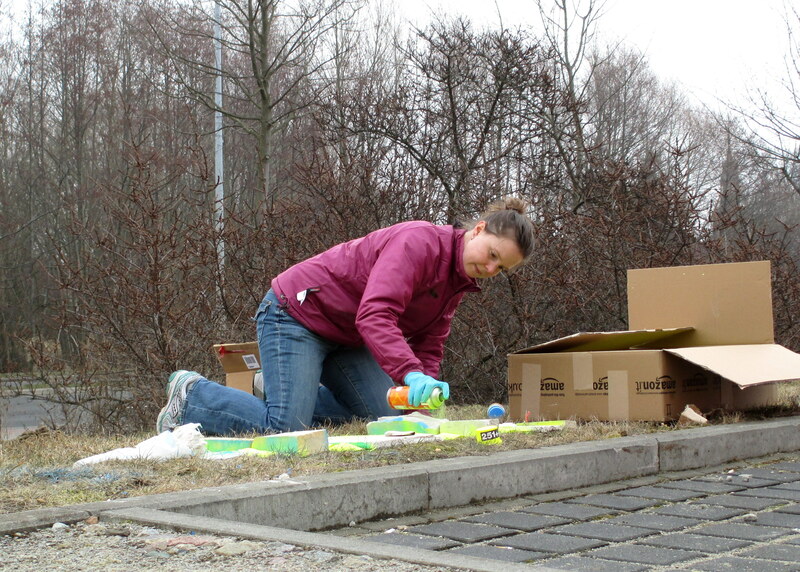 In May, I also started setting up a new experiment in which I’m hoping to measure how pollinators move pollen between green roofs. Right now I’m still in the early stages of this experiment and have just started growing the plants that I’ll be using for this research. I’ve chosen to use three prairie species. The species have very different types of flowers that attract different pollinators – one has small light pink flowers that attract small bees, another has very funky-looking orange flowers that attract bumblebees and butterflies, and another has very big bright yellow flowers that attract large moths. None of my plants have any flowers just yet so I have to wait and just take care of all the plants in the meantime. On top of teaching a class, those research tasks have been keeping me quite busy the past couple of weeks. To see a summary of my research so far, check out this new post featuring my work on the Chicago Botanic Garden’s blog. I’m pretty excited to start working with another undergraduate intern in a couple weeks and, together, see what this summer will uncover! 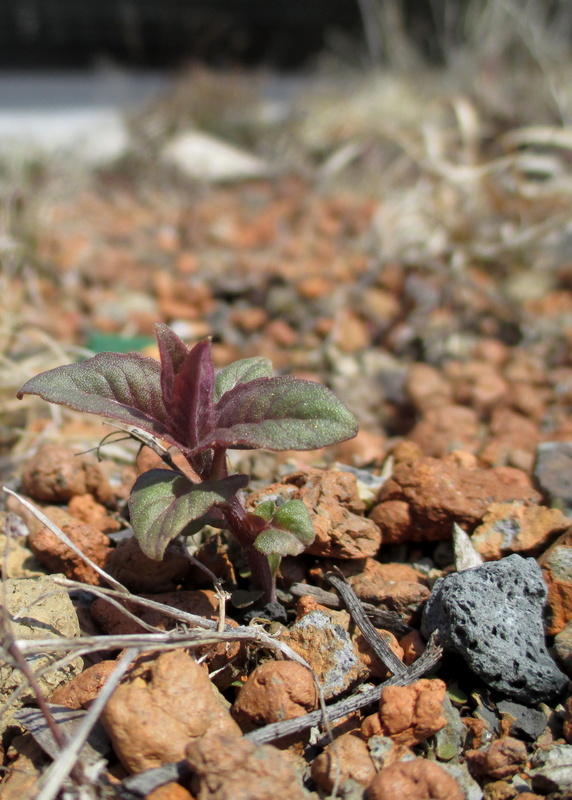 This little seedling is starting to grow on one of the green roofs. I planted this seed in 2012. It’s great to see that a lot of the seeds have survived 2 winters, germinated and grown into real plants on the roof! It’s finally spring, which means that it’s my favorite time of year – time to work with the plants! I really enjoy when my research shifts from writing and indoor activities to planting, data collection and other outdoor activities. That’s part of the fun of being a plant scientist! There are some more signs of life on the green roofs now. I haven’t collected any data yet, but I’ve been checking in on some of my prairie plants that I planted as seeds back in October of 2012 (check out my first blog post all the way at the bottom of this page). It’s great to see that some of them are growing and doing well, especially after one of the coldest Chicago winters in a really long time. I’m looking forward to tracking their progress throughout the summer. 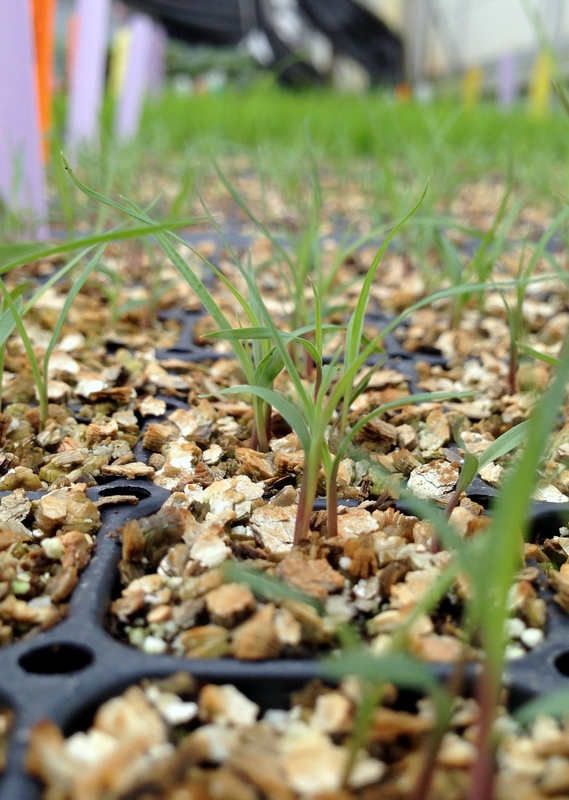 These little grasses started to grow in the greenhouse at the beginning of the month. I collected soil from a local prairie restoration to include in the experimental green roof trays. 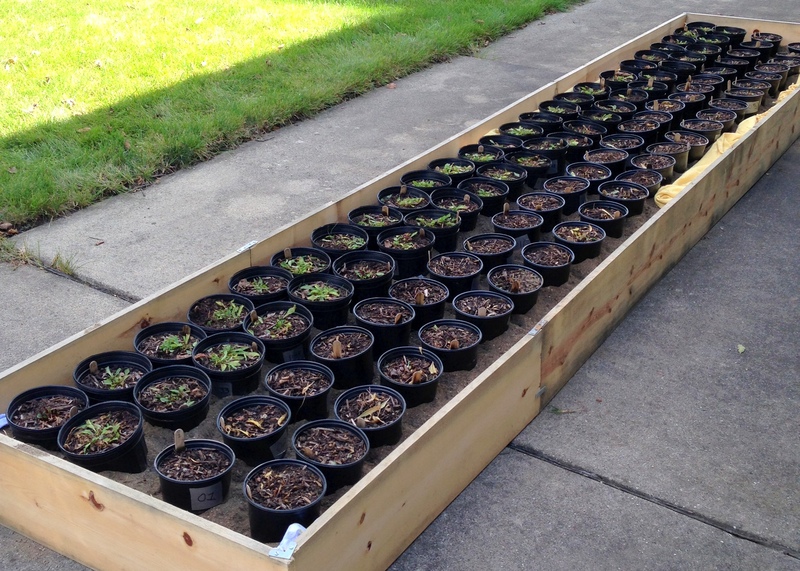 I will also be adding natural soil that I collected from a prairie to half of the experimental trays. I am predicting that living organisms which normally live in prairie soil and help plants grow there will also help the prairie plants that are on the green roof. If this is true, then I should see that the plants are healthier in the experimental trays with this extra prairie soil. We’ll see! Some of the experimental trays already had succulent plants when they arrived, but there were a lot more that needed to be planted. These are all in a greenhouse, waiting for the seedlings to be big enough for planting. It took a while to plant all of the Sedum and prairie plant seedlings but now they are ready to go. It’s still too cold in Chicago to put the experimental trays with the little seedlings outside but in a couple weeks it should be warmer. Once the trays are all on the rooftops, I’ll be able to start collecting data and then I’ll be able to start answering some more of my research questions. I used a grid to plant all the little seedlings into their randomly-assigned place in the experimental green roof trays. The setting sun melts a little more snow around the cacti growing on a chilly green roof in Chicago. Could it be? Is spring finally coming? It didn’t look like it too much in Chicago this past month but I guess there were a few signs. 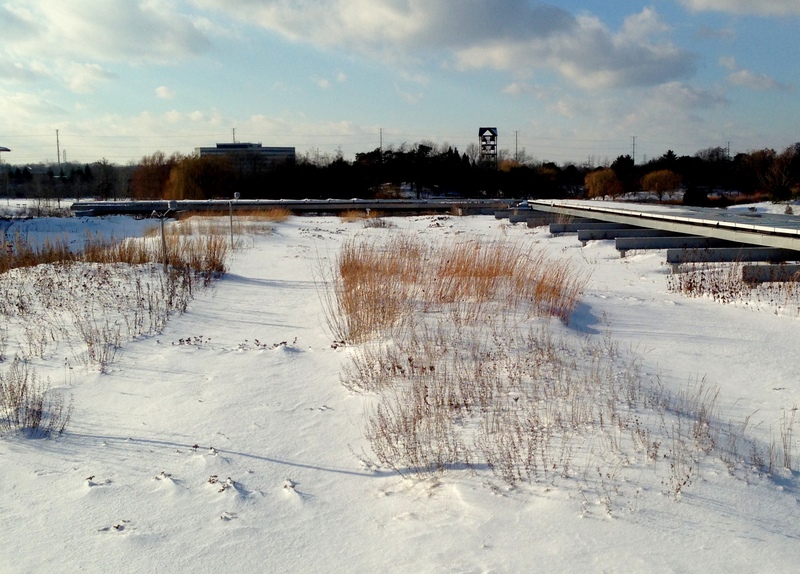 For the most part, my study sites, the green roofs, were covered with ice and snow. But by the end of the month, the snow began to melt and although it’s too early to see if the seeds I planted over a year ago have grown into little plants that are alive and growing, there are a couple of other plant species that are doing well. I think things will start to get much more exciting on the rooftops next month. So while waiting for things to warm up outdoors, I focused on indoor aspects of my research during March. This month I helped plan a speaking event, featuring Dr. V. Bala Chaudhary from The Institute of Environmental Sustainability at Loyola University. She studies fungi that live in soils. 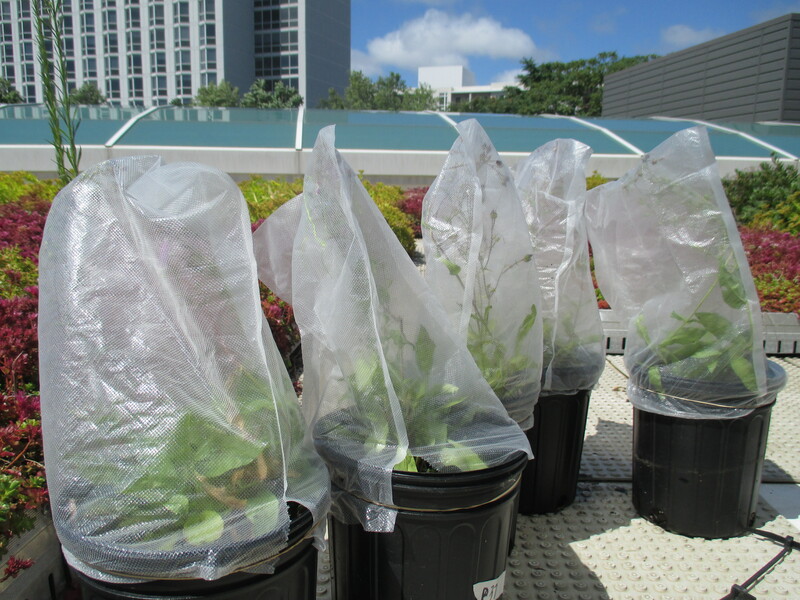 We will be working together this summer to learn about how these soil fungi help plants to grown on green roofs. The fungi and the plants have a mutually beneficial relationship which means that they help each other out. They fungi help the plants use nutrients from the soil and the plants give the fungi food that they make using energy from the sun. The fungi also help hold the smaller parts of the soil together. 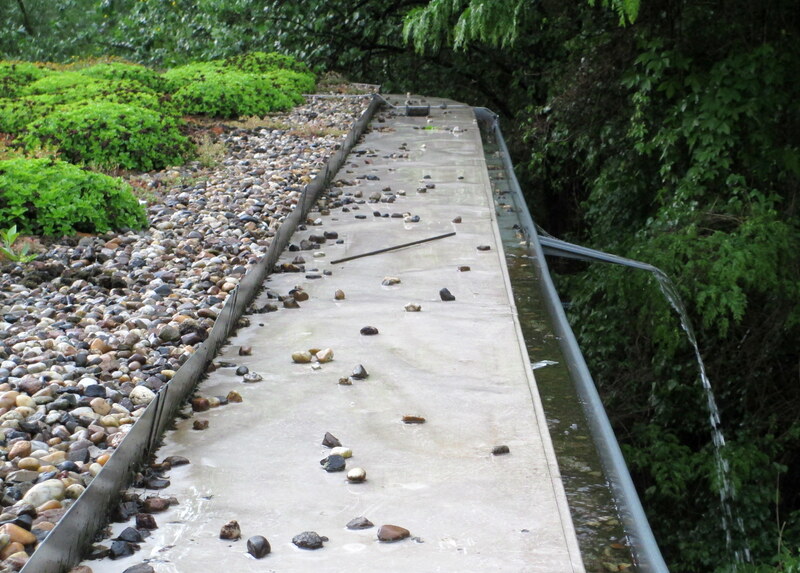 On a green roof, this is especially important so that the soil doesn’t blow away. There are not very many other researchers studying these relationships on green roofs so there is a lot to learn! 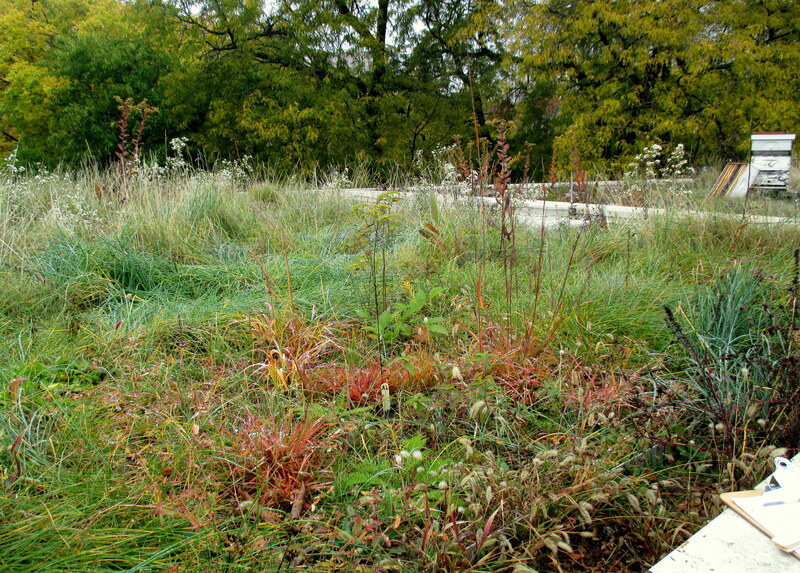 The soil, or growing substrate, can change on green roofs over time. You can see that soils from different green roofs look a little bit different, in terms of color and “clumpiness” or texture. I will be learning more about how fungi and plants can change the texture of the soil. In my previous germination experiment, I recorded how long it took seeds from green roofs to germinate compared to seeds from gardens on the ground. This part of my research is now published in a new journal. In March, I also continued working on some of my writing projects. I’m still writing a chapter of a book with another scientist that describes all the ways that bugs on green roofs contribute to healthy cities. Another article that I wrote was published this month in the newly established Journal of Living Architecture. It discusses how flowering plants on green roofs produce high-quality seeds that are able to grow into new plants. It is a little more scientific than my typical blog posts, but if you’re interested in checking it out, you can read it by clicking on the link here. In addition, I’ve been finishing some requirements of my graduate program and getting ready for this coming field season of data collection. I completed my qualifying examination, which is a major milestone for PhD students to advance to the next stage of research. I ordered supplies for future research, such as green roofs trays, and have been monitoring my seeds that are still in “cold stratification” in the refrigerator. I’m planning on planting them next month. I finished my teaching assistant duties for my statistical methods class and I’ve started working for a different instructor in a Conservation Biology class. This new class will focus on how people can help keep and increase the diversity or variety of living things, especially in and around cities. There are a lot of connections to my research regarding plant conservation on green roofs, so I am excited to help share my passion and knowledge with a new group of undergraduate students and learn some new things too! And last but not least, my most exciting news of the month is that I have been selected to be a Botany in Action Fellow again! Thank you Phipps and supporters!!! I am grateful and honored to be part of this fantastic program for another year and look forward to a lot of great outreach opportunities and new ways to share my science with people of all ages and backgrounds. This means I’ll be contributing another year’s worth of research updates, so there’s lot more to come from me. Thanks again! February always goes by so fast, doesn’t it? It’s hard to believe that it will be spring in a few weeks but it’s exciting to think that soon I’ll get to work outside again. Even though there is still plenty of ice and snow around Chicago and working with plants outside isn’t yet possible, there is still plenty to be done indoors. 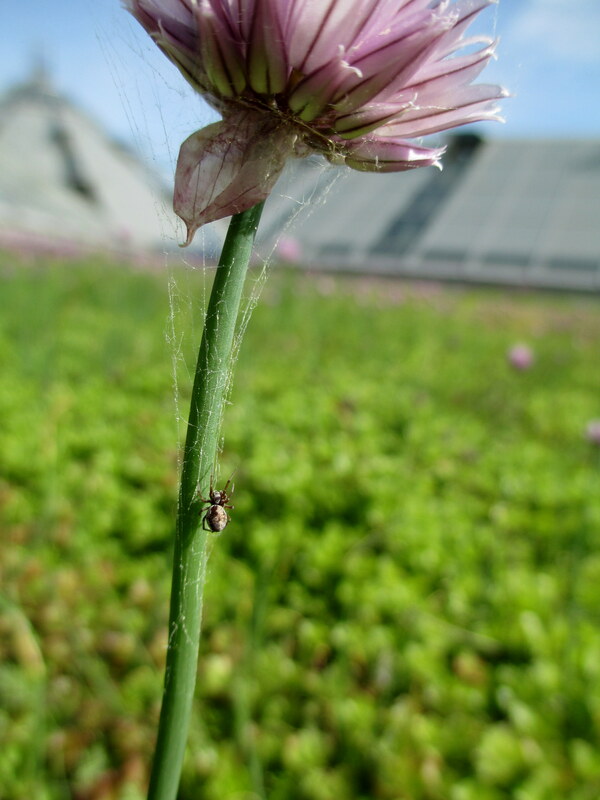 In a textbook chapter that I’m working on, I will write about the important jobs that insects do on green roofs. 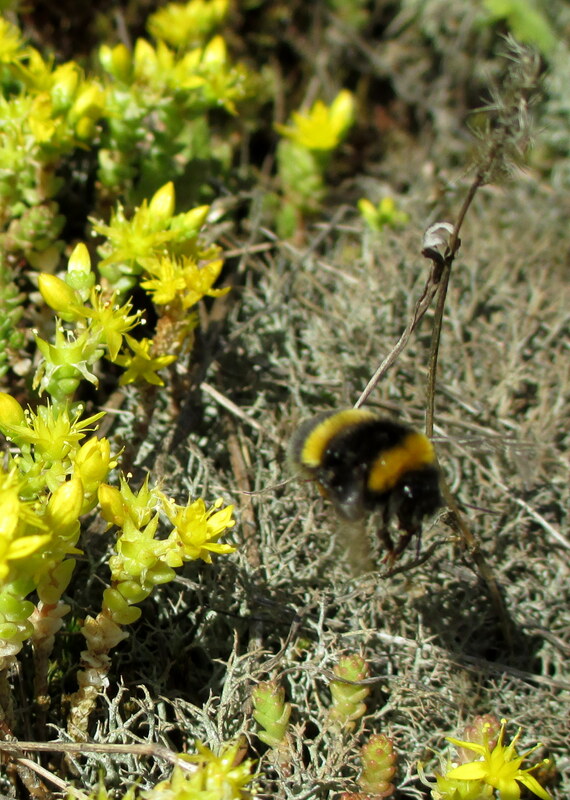 Here is an example – a bumble bee pollinates this plant on a green roof in Berlin, Germany. This past month, I continued a lot of the writing projects that I’ve started. Next month, I need to present a really big proposal detailing all of the research projects that I’m currently working on. So I’ve started coming up with new ideas, reading more information about other scientists’ work , and writing the proposal. Even though writing isn’t always my favorite thing to do, it’s a really helpful way to get my thoughts organized and it’s a necessary part of sharing my work with others. I also started writing a chapter of a textbook that should be published next year. This chapter will talk about how bugs like bees, spiders, and ants have important jobs on green roofs. It’s fun to help people learn about the value of insects on green roofs and in cities but I had no idea that to publish a book in 2015, you have to start writing about a year in advance! It sounds like I have a lot of time but when there’s so much to write about you have to start early. I ordered wildflower and wild grass seeds from several companies. 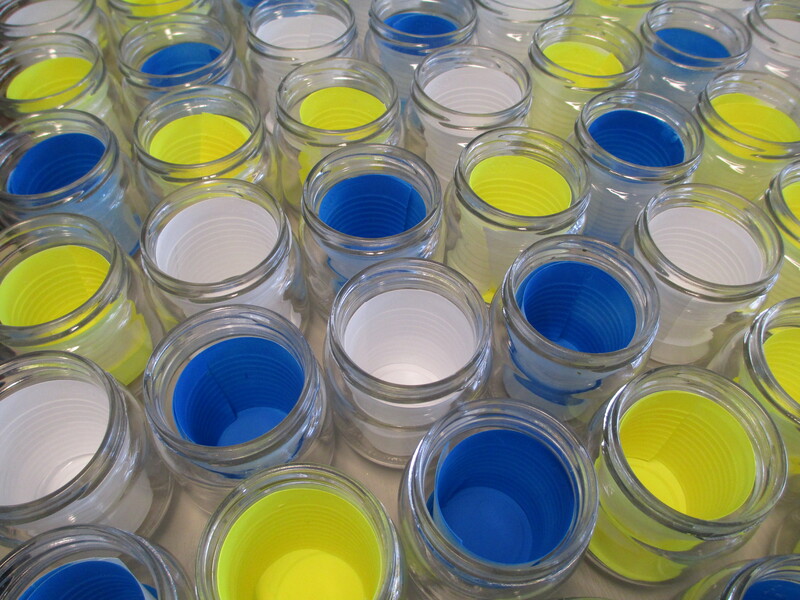 When they arrived I needed to sort them and determine how many of each type I would need for my new experiment. In February, I also started preparing some native plant seeds for an experiment that will begin on four green roofs in Chicago once the weather is nicer. I’m going to plant these native wildflower seed on the green roofs in a particular pattern and answer a couple different questions. One of the questions involves seeing if the living organisms in the roof top soil (things like bacteria and fungi that live in dirt) are able to help the plants grow. Another involves comparing the growth of plants that were just planted as seeds on the green roof with some that were planted as grown-up plants. It might sound easy just to put the seeds in the soil and watch them grow, but for a lot of the species I’m using in my experiment, I need to trick them into “thinking” that it’s already spring. To do this, I mix them with some wet soil and put them in a refrigerator that is set to a normal Chicago springtime temperature. Some of the seeds also need to experience a little roughing up like they would in a natural field. 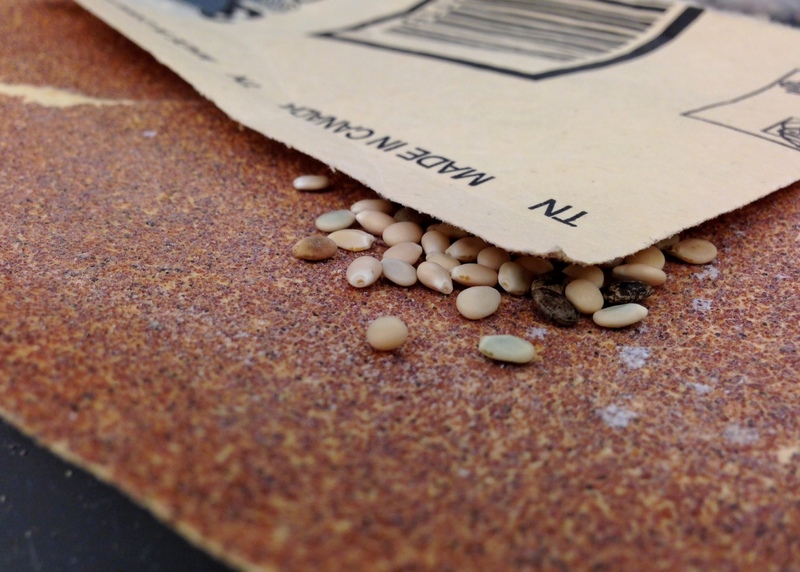 To do this, I rub the seeds gently between a couple sheets of sand paper. This makes very small opening in the outside of the seed so water can get to the important tissues inside the seed. In a few weeks, I’ll put all the seeds into a warmer greenhouse, so even if it’s still really cold outside, the chemical processes in the plant will be running as if it’s spring and will cause the seeds to grow into little seedlings. To prepare some of the wildflower seeds, I gently rub them between two pieces of sand paper. This helps the seeds absorb water so they can grow into little plants later. Starting the seed germination process made me look forward to spring! This month I even started to look forward to summer too as I reviewed over 100 applications for a summer internship program that I will be a part of. I am excited to be a mentor through the competitive Chicago Botanic Garden’s Research Experience for Undergraduates (REU) summer program once again this year. College students from all over the country who may not have opportunities to do plant ecology research at their schools come to Chicago and work with scientists for three months to experience first-hand what our work is all about. It’s challenging but fun to be a mentor and help students who are not as experienced learn about botany and being a researcher. I’m sure there will be many more pictures and stories to share about my mentoring experience as the summer progresses, so stay tuned. January has been the start of a new year and a chance for me to begin new aspects of my research. In the class I’m teaching, we use strips of colored paper on a tabletop to represent real plants in a garden. As a plant scientist, you have to improvise in January! To help prepare me for a career as both a researcher and a teacher, this month I started a teaching assistant job at my university. I’m helping undergraduate and graduate students learn how to use statistics (fancy math) to explain the results of their experiments and observations. When you think of plant scientists, you might not expect that we spend a lot of time on computers and might be surprised at just how often we use computers and math to answer our questions – learning these techniques is actually quite important for plant scientists! Teaching is one of my favorite jobs so helping in this class is a lot of fun for me. I always learn new things myself and when I have to grade assignments, it really helps me make sure I completely understand the topics too. In addition to being a teaching assistant, I am also now taking on the role of a student once again. I am taking a class at another university in Chicago about ecosystems. “Ecosystems” describe how all the living things in a certain area interact with each other and with the environment. For a plant scientist who works on lot of green roof (like me!) ecosystem science is important because it can help me figure out how all the plants and animals on green roof are affected by things like light, water, wind, and nutrients in the soil. This new class just started in January and I’m excited to learn a lot more about green roof ecosystems over the next few months. An example of one of the spiders I collected from German green roofs last summer. Hopefully all of them (over 500) will be identified by next month. Not everything is new – I’m still working on some research projects that I started in 2013 and 2012. 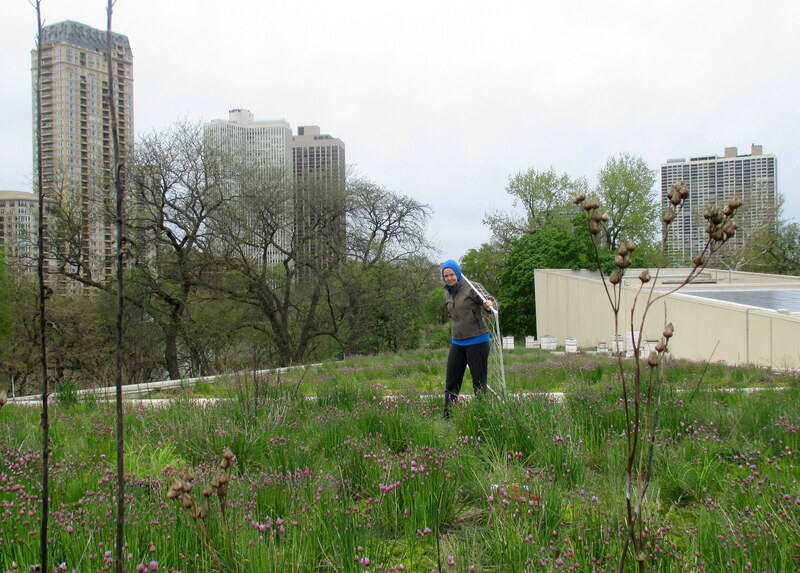 I’m using the data from an experiment that I set up on some green roofs in Chicago (see my post from October 2012) to design a new experiment that I’ll start this coming summer. I will be learning about how prairie wildflowers attract insects and trap rain water on green roofs. Even though it’s still only January and it’s much too cold and snowy for plants to survive outside, I need to start growing some of the seeds inside a greenhouse where it’s nice and bright a warm. Hopefully I will have some neat pictures of these seedlings to share with you next month. 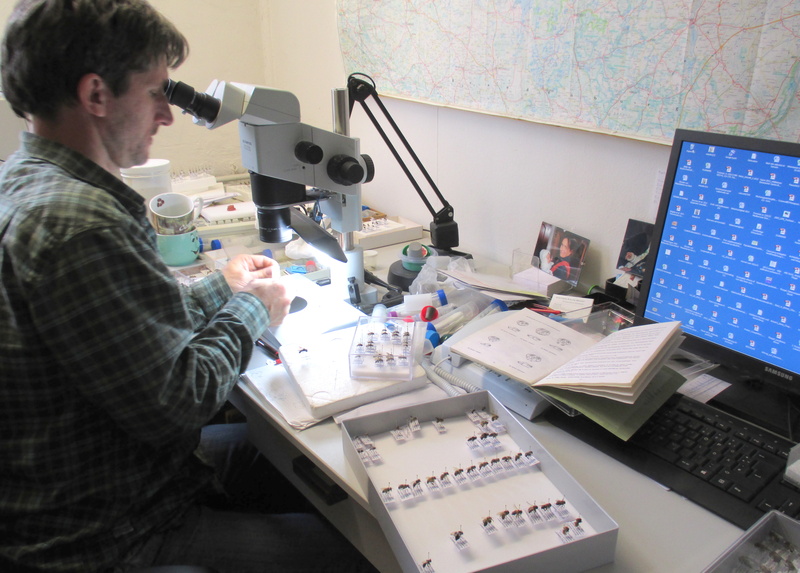 I am also working with a couple other scientists to finishing identifying all the insects that I collected from the green roofs in Germany last summer. We have now finished all the bees, beetles, wasps and ants and are almost finished with the spiders. Once we know how many different types of little critters came from each roof we can start using that “fancy math” (statistics) to help us explain the qualities of a green roof that are best homes for plants and insects. In a presentation I gave at my university, I explained how I used a piece of equipment to measure the texture of the dirt on green roofs while I was in Germany. As I look ahead at all of my research for 2014, I realize I have a lot to do! To help me with some organization, it was nice to be able to receive feedback from other researchers and students at my university. A few weeks ago, I gave a presentation covering the research that I’ve completed so far and my plans for the future. Graduate students, research associates and professors came to hear about my progress and offer suggestions for improving my upcoming plans. I think 2014 is going to be an interesting year! December has been quite cold in Chicago, which means it’s been a good time to get some indoor work finished. This past month I did a lot of writing! Sorry, not too many good pictures to add this month unless you like to see me typing. Doing science can’t always be glamorous! My experimental prairie wildflowers on this green roof are protected by a blanket of snow. Which plants will survive the winter? I am excited to find out in the spring! 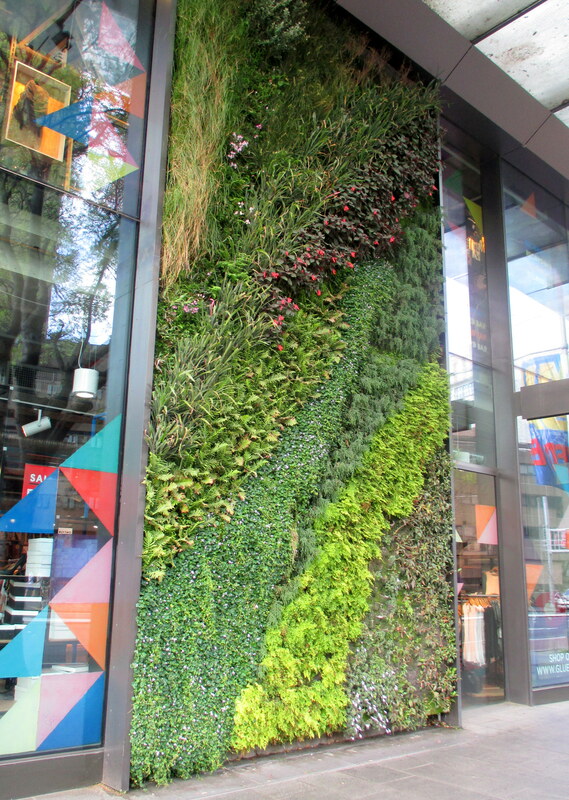 The main writing that I worked on in December is a chapter of a book about green roofs and walls. I was surprised to see just how much reading I needed to do before I had enough information to write about. My chapter is about how green roofs can be homes for many different types of interesting plants and animals. 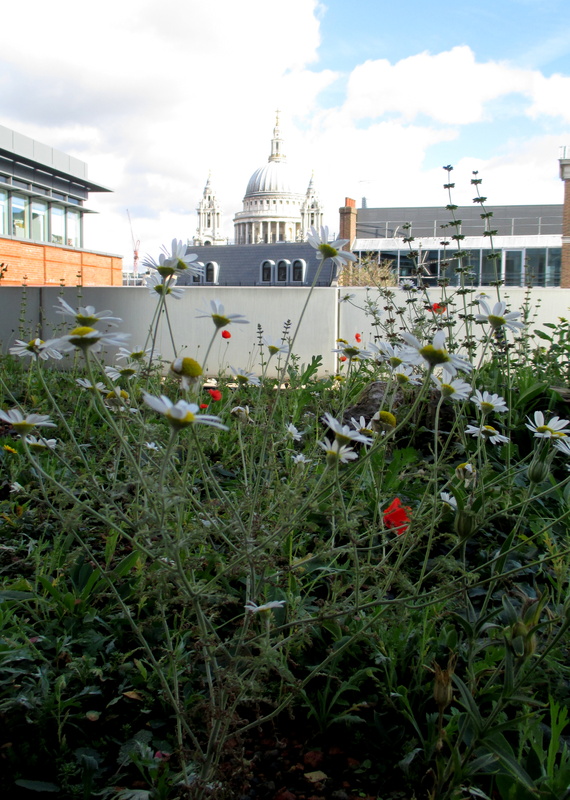 The more green roofs a city has, the more opportunities there are for providing homes for all kinds of living things like wildflowers, birds, bees and butterflies. I hope that everyone who reads my chapter will understand how important it is to use our resources (like rooftop space) wisely to help all living things in cities. Although I sent the writing to the editor this month, the book will not be printed for a little while. If I can post a copy of my chapter to this blog in the future, I certainly will! Finishing this project helped me get excited about another book chapter I’m writing about the different types of bugs that are found on green roofs. 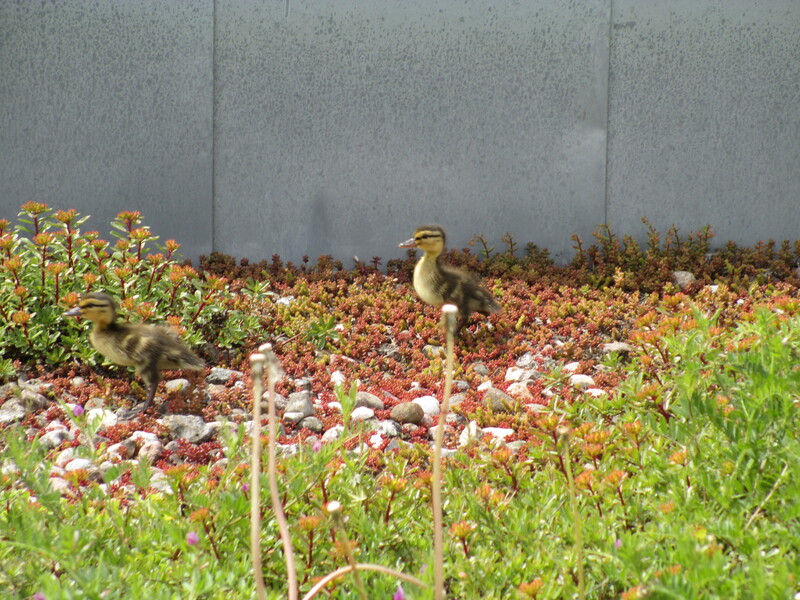 Did you know there are thousands of different critters that live on green roofs? 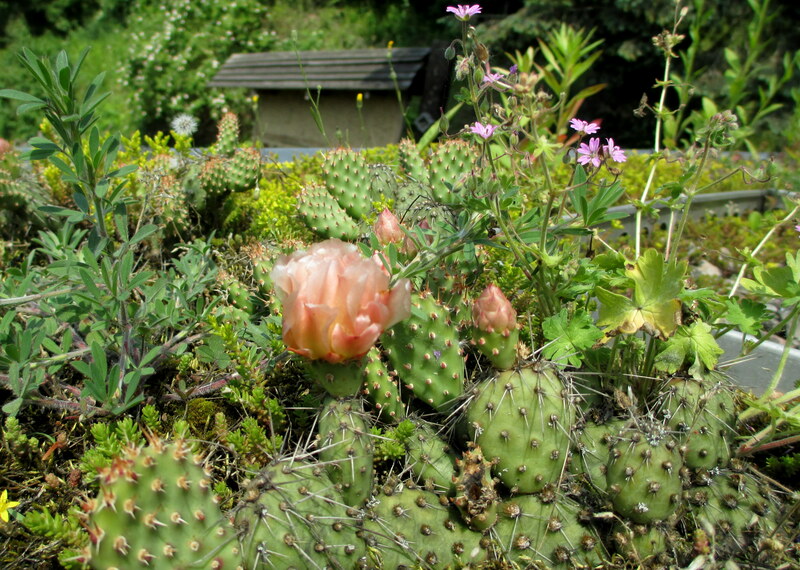 Depending on what types of plants live there, green roofs can literally be hopping with activity! This new chapter will still take many months to write, but my research in Germany over the past year has helped give me lots to write about! In December, I also started planning for the new quarter that starts in January. Next month I will be taking a class to learn more about how plants interact with the non-living parts of their environment. The class is called “Ecosystems” which is a word that ecologists use to describe all the living and non-livings parts of a certain place, like a garden, forest or green roof. I have also been learning how to use a new computer program so that I can teach a class about using this program to analyze or make sense of scientific data. The class starts in January and I am excited to be learning more about the specialized math and data analysis along with my students! It should really help me understand the patterns of plants and insects that I observed when I was on the green roofs in Germany this past year as well as the patterns that I’ll see on many other green roofs in the future. Other than that, I have also been designing a new research project to learn about different genetic traits that plants on green roofs have and writing grant applications so that I can get all the equipment I need to carry out the necessary experiments. It is exciting to get some of this behind-the-scenes work completed before the start of the new year. This month my research has lead me back to the good old USA and to my home city of Chicago. After working in Germany for 10 months it sure is nice to be back home but there certainly is a lot of work that needs to be done. I was very happy to find that (after some drama) my green roof insects that I shipped back to America finally made it! I carefully unpacked all the specimens (the collected spiders and ants) and am currently working with some specialized insect experts to figure out which species of spiders and ants I collected from the German green roofs. Along with the identifications of the bees and beetles and the rest of my soil and plant data, I will have collected a lot of information about the organisms that are using the green roofs as well as some of the processes that are taking place in these unique gardens. My hope is that this information will not only be important to the people of Germany but also be useful to help people all over the world design green roofs that support a lot of living organisms. 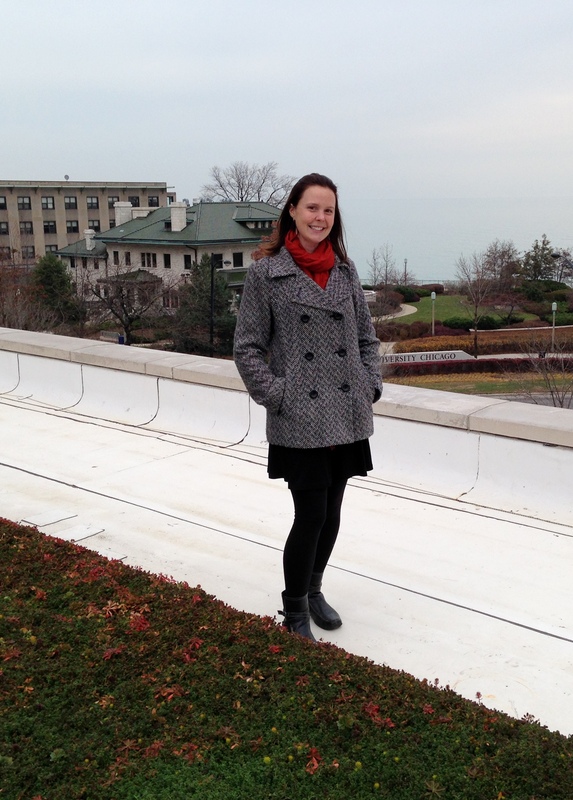 This month I checked out a new green roof research site in Chicago. Now that the weather is cold and the plants and animals are not as active I will focus on analyzing my data, obtaining researching funding, writing about my work, and planning future research projects. In November I started doing all of these things, which means I spend a lot of time in my office working on my computer. The writing can be especially tedious because sometimes it is difficult to explain what your experimental results mean – you have to be very specific and make sure not to write things that are unclear or incorrect. But I am happy to say that most of my writing projects are moving along. This past month I finished revising one article for a scientific journal and submitted a draft of another one. The first one is about different species of bees that are found on green roofs in Chicago and the second one is about modeling how attractive flowering plants can be to pollinators. I am also currently writing a chapter of a book about how green roofs can support the diversity of living things in cities. In between writing and reading, I was also able to visit a building in Chicago that might be one of my research sites next spring. It already has a green roof on one half and I am hoping to install an experimental green roof on the other half. 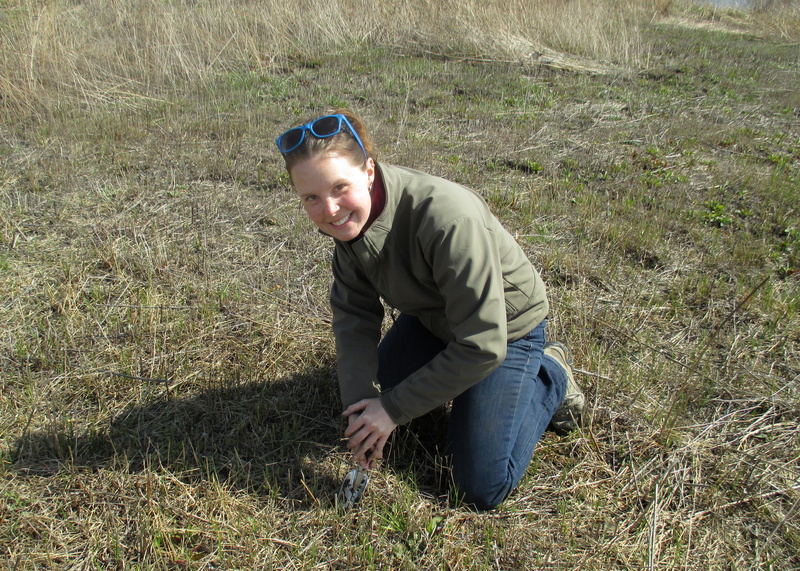 With a soil ecologist as a partner, we will find out if designing green roofs with prairie plants helps them to work like real prairies would on the ground. I’m sure I’ll have many more updates about this project as it develops over the next year, so stay tuned! Hard to believe, but this will be my last update from Germany. My 10-month research fellowship has already come to an end. Boy, the time goes by fast! 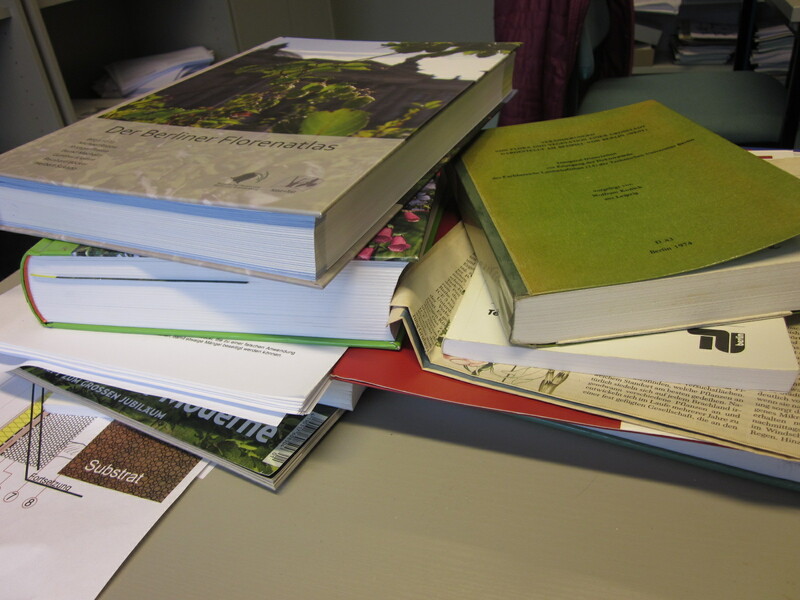 October was very busy as I was finishing the data collection portion of my research project as well as learning as much as possible about plant diversity on green roofs in Europe. 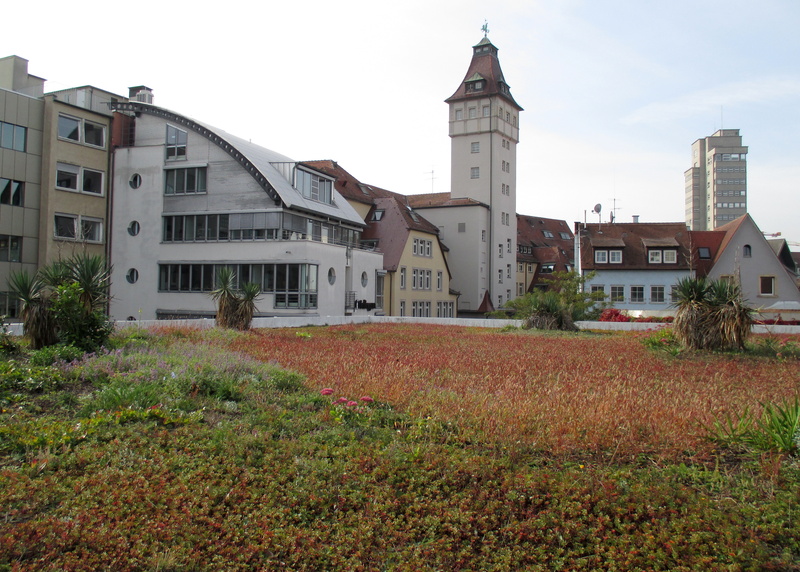 A green roof in Stuttgart, Germany uses different depths of soil-like “growing media” to create different habitats for a variety of plant species. 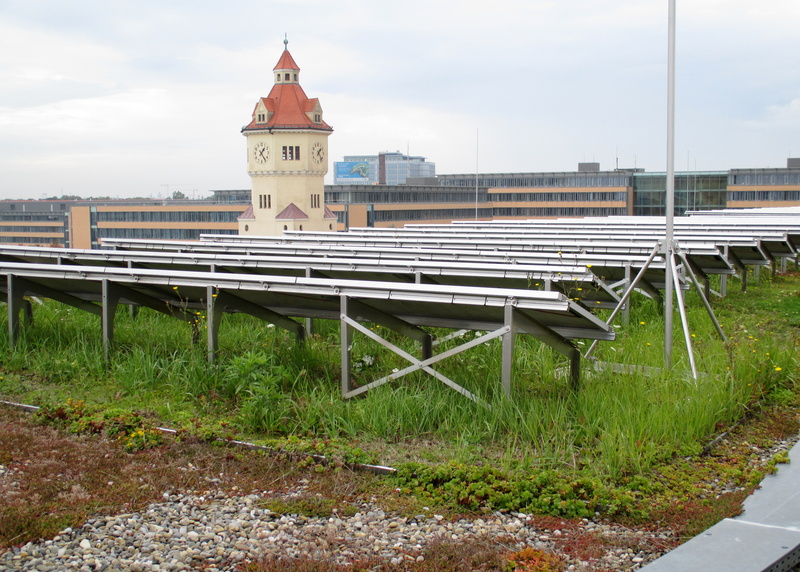 A green roof in Munich also has solar panels which creates places for both sun-loving and shade-loving plants to grow on the same roof. 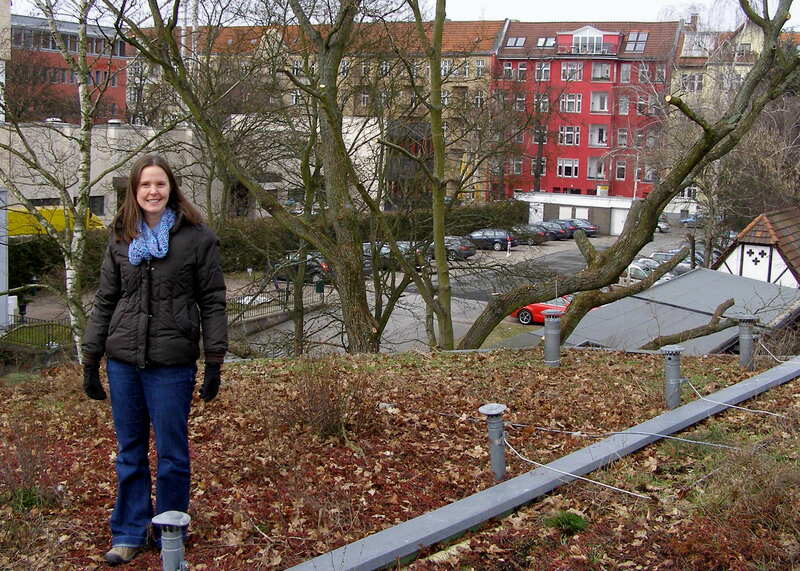 In a short period of time I was able to visit a variety of green roofs in Stuttgart, Munich, Vienna and London. These cities all have different laws that encourage or require people to build green roofs and it was really interesting for me to learn more about these special habitats, especially those that are built in specific ways to support a large variety of plant and insect species. I hope that I will be able to teach people in the U.S. about how to encourage more support for a wide variety of plants on green roofs when I get back to Chicago next month. A green roof in London uses a creative pattern of different soil-like growing media to create habitat for a wide variety of plant species. Just some of the paperwork needed to ship insects from Germany to America – what a hassle! 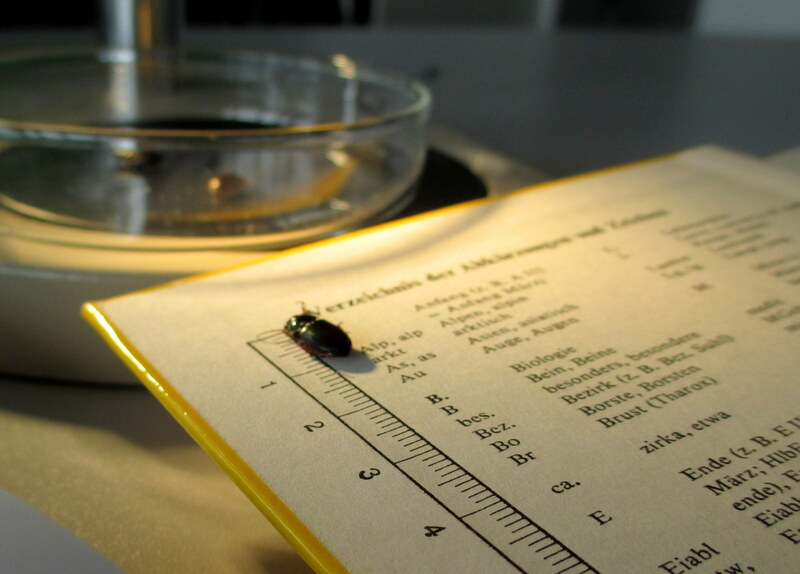 When not traveling to see the amazing green roofs of Europe I was busy in the laboratory, making the final preparations for all of my collected insects. The beetles were packed up and I traveled to Berlin to bring them to an expert who was able to identify which species each of them is. The wasps were dried, packed up and sent to a different wasp expert in Germany. The bees were already dried and displayed but needed to be arranged in a certain way with special labels indicating where they had been caught and what species each one was. The bees will stay in Germany but the spiders and ants had to be packed up in a very specific way to be shipped to different identification experts in the U.S. Aside from being really expensive, it turns out that importing bugs into America is actually quite a hassle, even if they are just harmless little dead ants! And the government shutdown during October didn’t help matters as it was impossible to obtain the necessary forms and information about U.S. Customs inspection procedures. But I think I finally figured everything out! Please keep your fingers crossed for me that these very important research specimens make it back to me in Chicago! 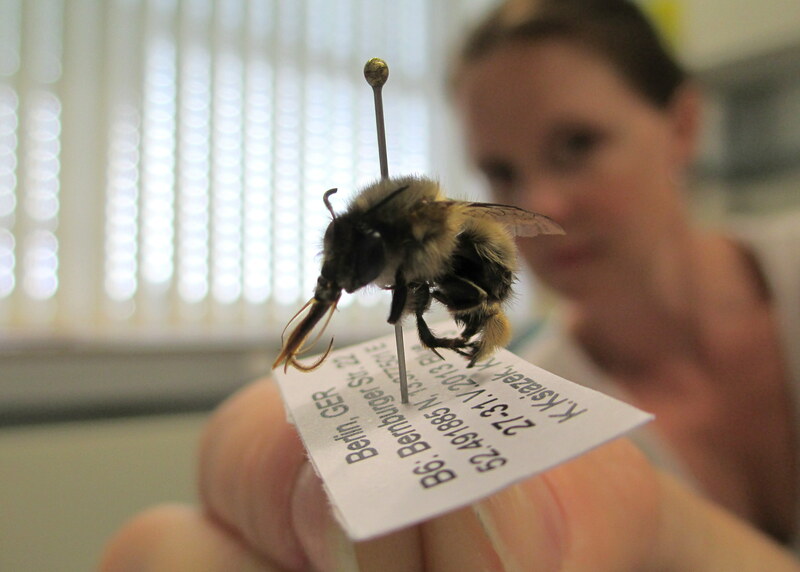 Each bee in my collection was labeled with important information like the location of collection and species name. I can tell that fall is here! The days are starting to get shorter, the nights are much colder and more of my work as a plant scientist is moving indoors. 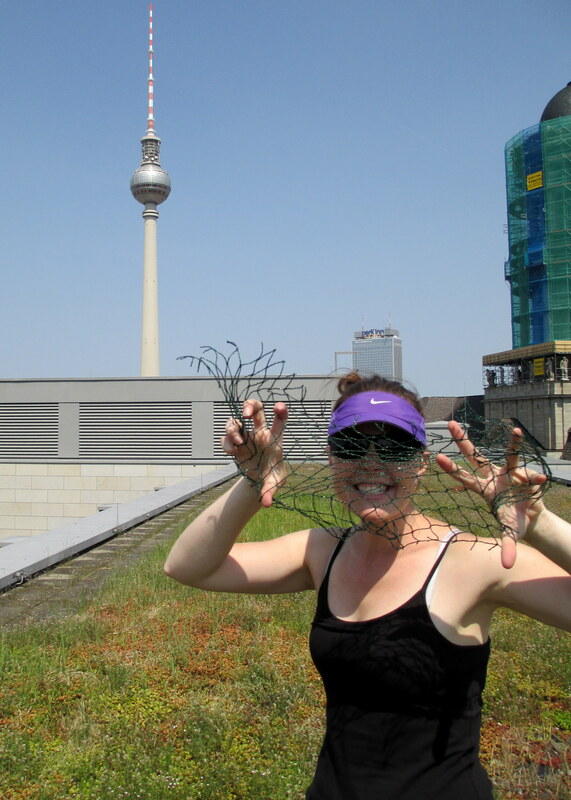 Here, I’m collecting insects from the traps on my last visit to the green roofs in Berlin. 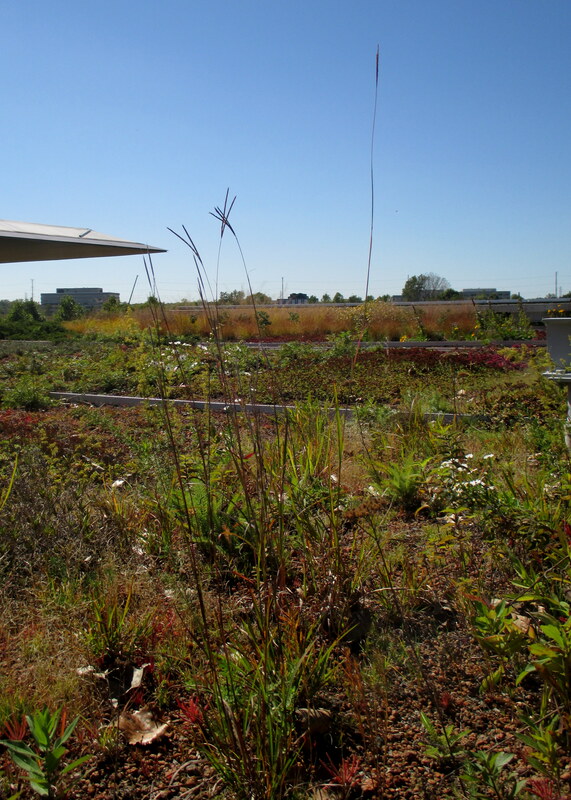 In early September, I made my last trips to the green roofs to collect one last set of bugs and some other data, like how high off the ground each of the roofs are. After going to the same roofs so many times since April, I finally felt like I was getting the hang of it. 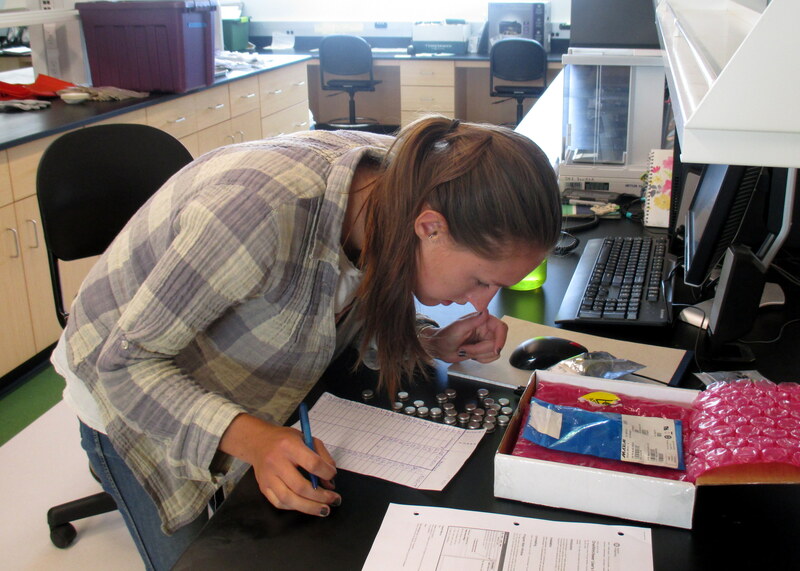 But it’s very nice that the sample collection part of this current project is over and now I can focus more on lab work, such as identifying the insects, and computer work, like analyzing the data. With my project advisor at the congress. You can tell that this is after the presentation is finished because I don’t look nervous anymore! This month I also traveled to France to give a presentation about some of my research at the World Green Infrastructure Network’s annual congress. 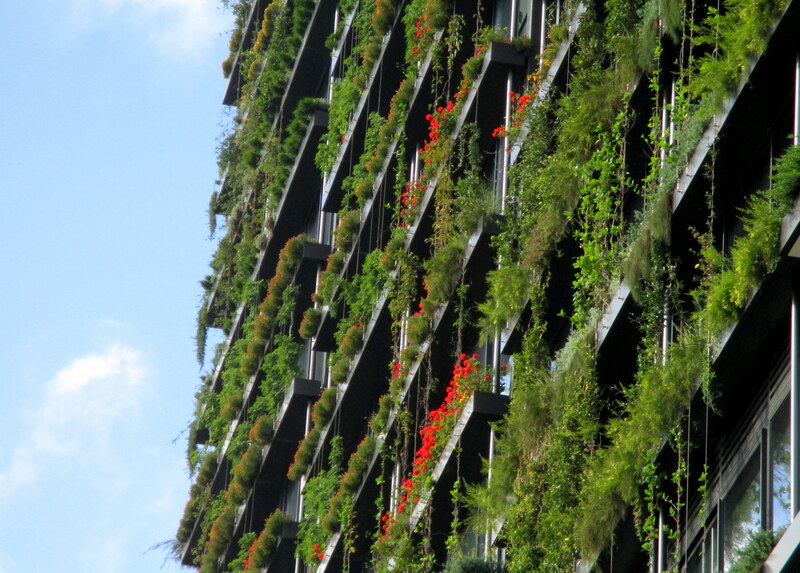 This “congress” is a big conference, where about 500 people including architects, city planners and scientists share the latest news about buildings that are designed to incorporate plants, like the green roofs where I work. My presentation was about plant diversity on green roofs and how, even though plants can be stressed during droughts or really cold winter, there are still some species that are really good at surviving on the roofs. The presentation went well and it was great to hear other scientists talk about their findings too. But my favorite part of the conference was going on a couple green roof tours, where I got to learn about some unique roofs and actually seem them in person too. 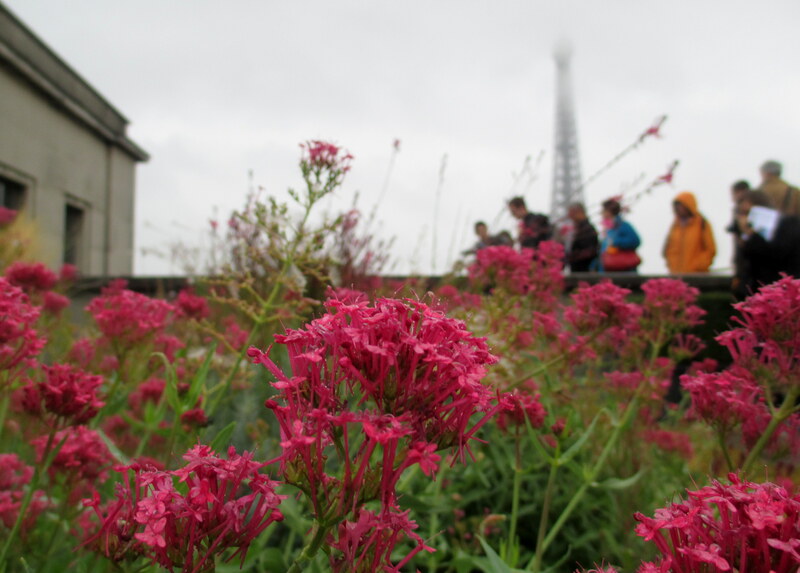 In 2 days, we went to about a dozen green roofs between the Atlantic Ocean and Paris. Even though it was a bit cold and rainy, there were still some great views! There were some great views in Paris! 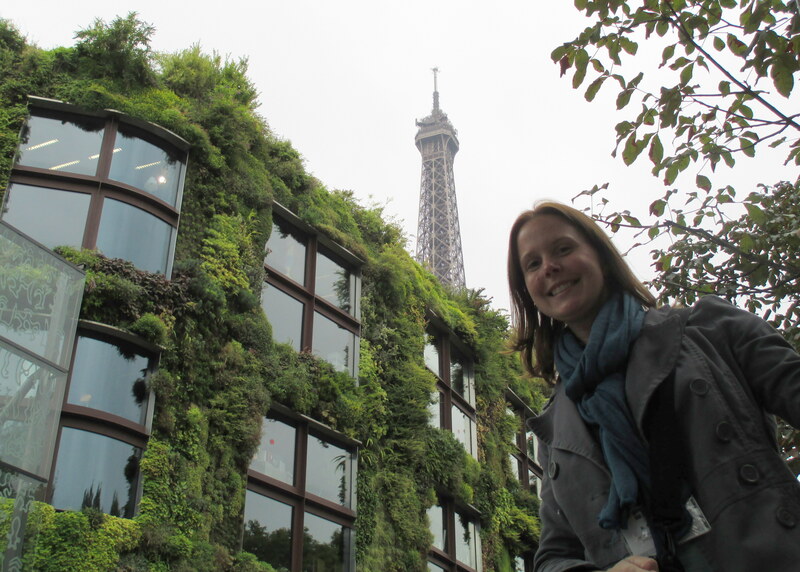 Here is a building with a green facade really close to the Eiffel Tower. 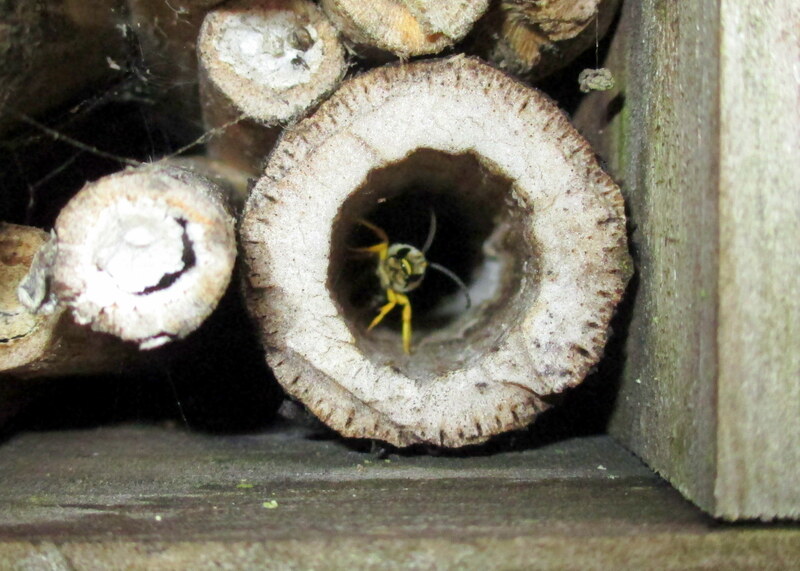 A little friend is making use of this “bee house” on a green roof in France. More great views from the green rooftops in Paris. 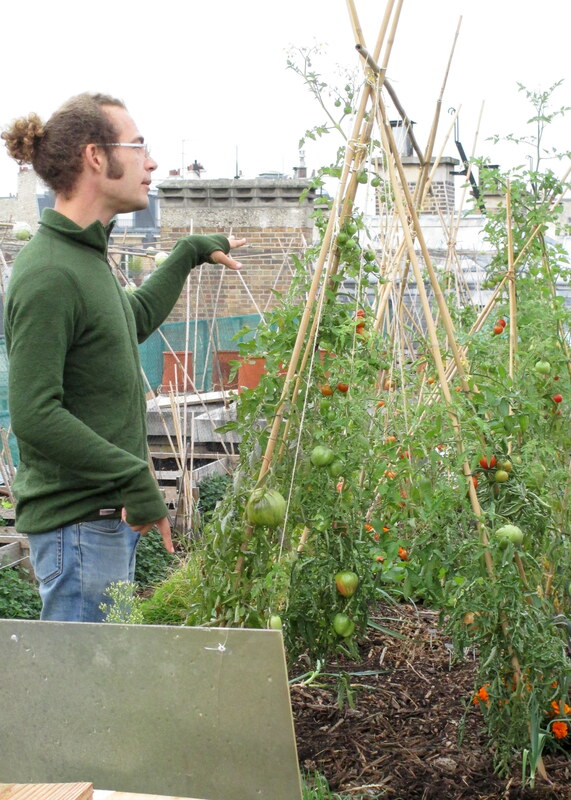 A man explains how they grow delicious tomatoes on green roofs in France. A local German bee expert identifies some of the bees that I collected from the green roofs this past summer. 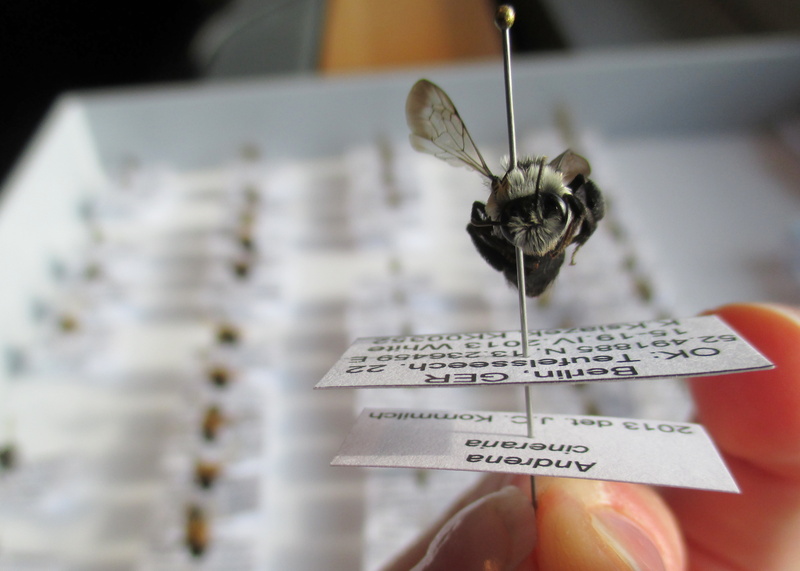 More of my indoor work also included identifying all the bees that I collected from the green roofs. There are over 300 different known species of bees in the region of Germany where I’m working and trying to figure out which ones are in my collection is quite a task! 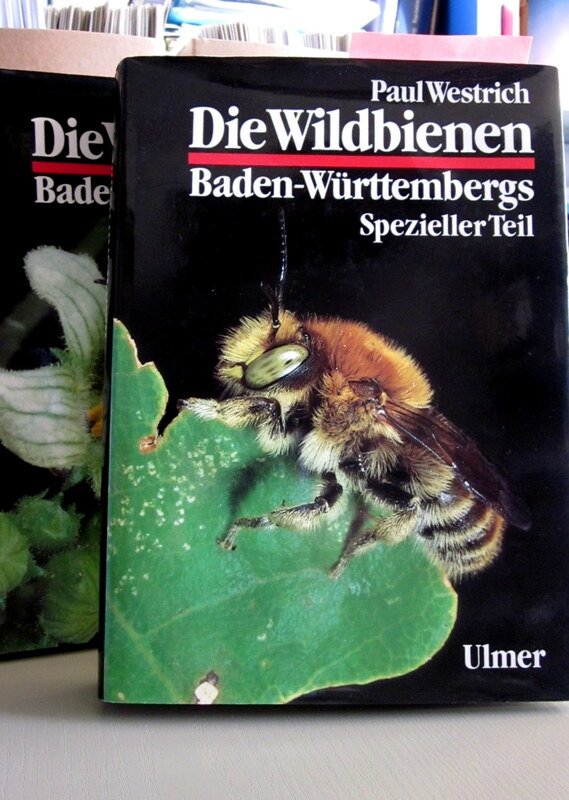 It would actually be a nearly impossible task for me, but luckily, I got help from a local expert who is really familiar with German wild bees. 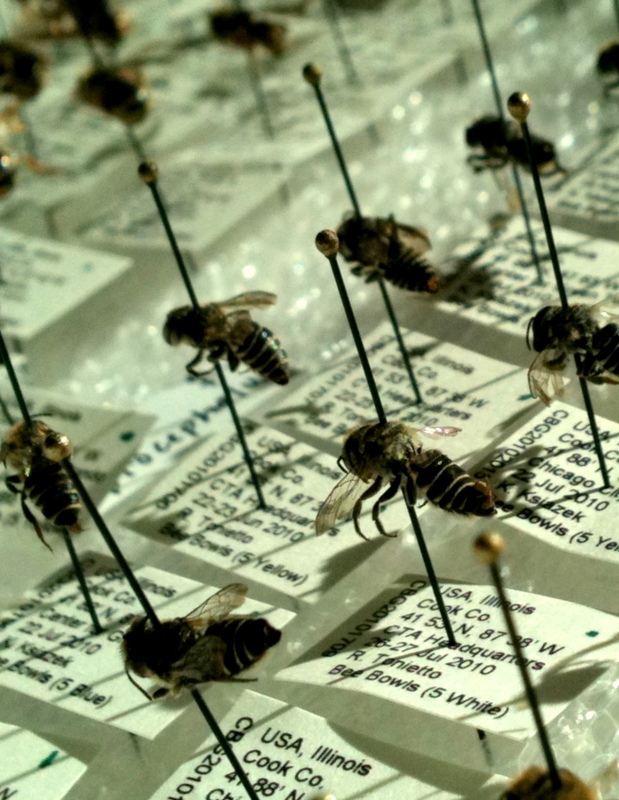 It was an interesting experience to learn a lot more about bees and we even found out that a few of them in my collection haven’t been found in the region before – that’s pretty cool that some species are moving to the area and are using green roofs! I am really happy to have these new data and excited to learn more about how the bees on green roofs help the plants and how the plants help the bees too. I’ll keep you updated as I learn more! This is just a tiny sample of the collection of bees that the local expert uses to compare news bee to when making his final determinations. He has thousands of bees in his tiny office! 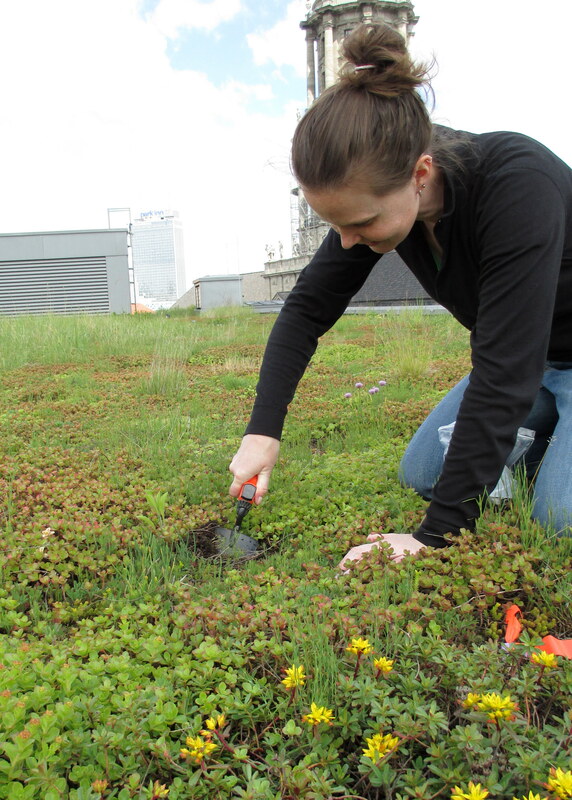 Collecting insects again from the green roofs in Berlin, Germany. August was busy, but a good month for research. 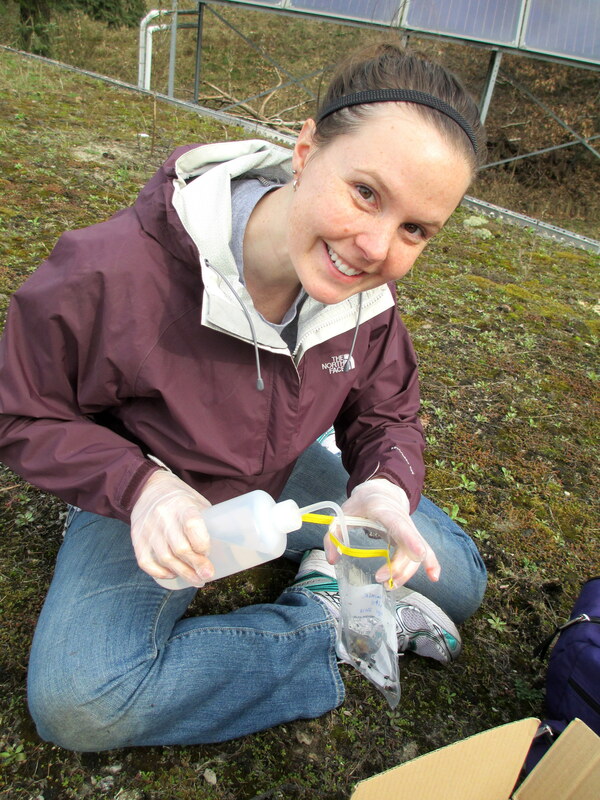 First, I collected insects again at all of my research sites. I have almost 8000 critters in my collection so far! 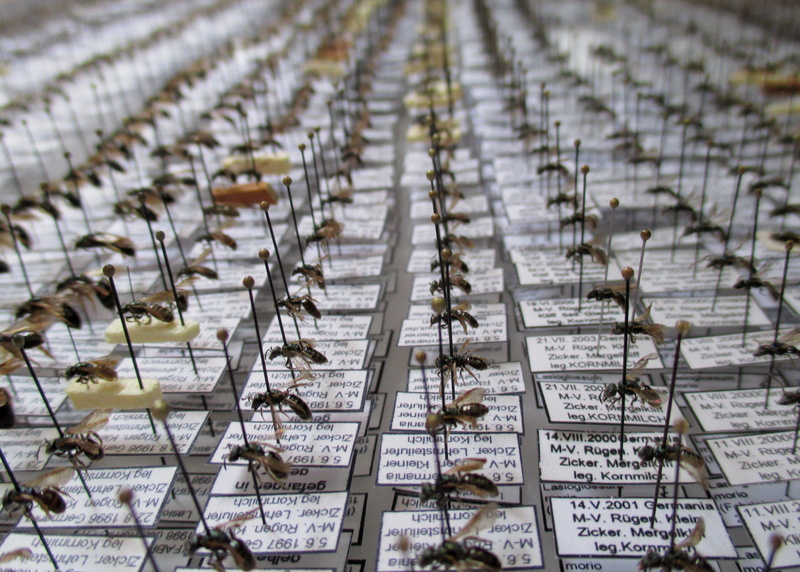 I spent a lot of time sorting, counting, and preparing all these little guys for identification later. I will collect insects one last time in September and then, since most of the plants will have stopped blooming by this time, I will stop. I need to bring some of the bugs back to America when I return in the fall so I will need to figure out how to do this properly and make sure that I have the correct customs forms completed so I can bring these German bugs to America. It’s kind of like they need their own passport too! I’m finding a lot of insects on the green roofs. 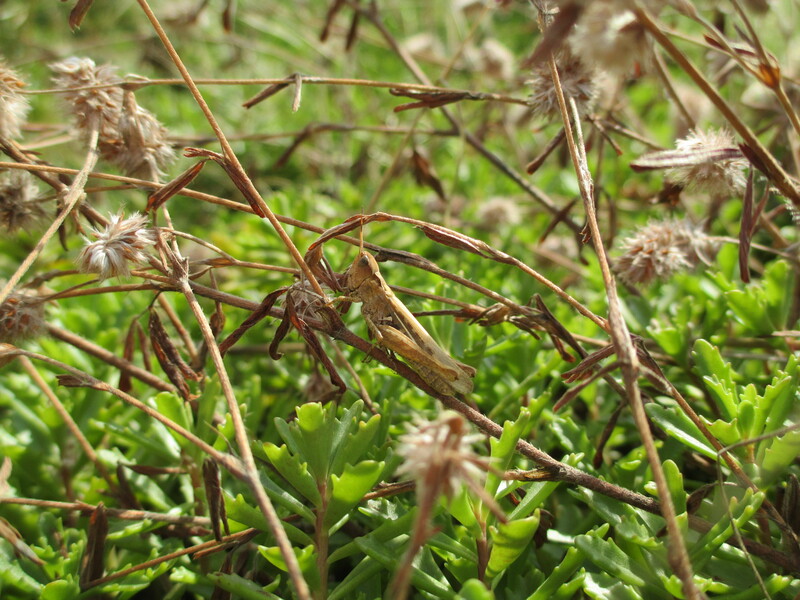 Can you find the green roof grasshopper in this picture? An example of a green roof neighborhood image. I use these pictures to measure the amount of “green space” around my roofs where bees might be living. One factor that might be important when I am trying to figure out why certain plants or insects are living on green roofs is the surrounding environment. For example, I think that if there are a lot of places for bees to make nests around a building, I might also find that there are a lot of bees visiting the green roof. Especially small bees –they have little wings and can’t fly too far so they generally stay in their own neighborhood. One way to measure this is to look at how much space around the green roof has lawns, gardens, or other “green” spaces with plants. This month, one of my colleagues helped me use satellite images of my green roof neighborhoods to measure the amount of green space in the surrounding environment. I don’t know if my predictions are correct yet, but I’m excited to find out. In a few weeks I will be giving a presentation about how weather, like the rain water you see flowing off the roof in this picture, can influence which plants live on green roofs. This time of year usually marks the beginning of conference season for us plant biologists – the time when we travel a lot and share our discoveries with other scientists. This year is no different. I made a presentation about my green roof research for the annual conference of the Ecological Society of America. Of course, because I am in Germany and the conference was in Minnesota I was not able to give the presentation myself, but my advisor gave the presentation for me and said it went very well. Now I am getting ready for another presentation that I will be giving at the annual congress of the World Green Infrastructure Network. I will be talking about how changes in weather can affect the types of plants that grow on green roofs. There is a lot of work to do for presentations, including background research, analyzing data, making interesting figures and graphs, designing PowerPoint slides, writing a script so I know what to say and, of course, practicing! I am a little nervous because I will be speaking in front of a lot of people, many of whom have been doing green roof research for much longer than I have, but I am also really excited! You’ll have to check out my blog next month to see how everything went. Things are really heating up here in Germany! Both the weather and the research! After finishing collecting my plant data, in July I turned my attention to some of the other aspects of data collection on the green roofs. 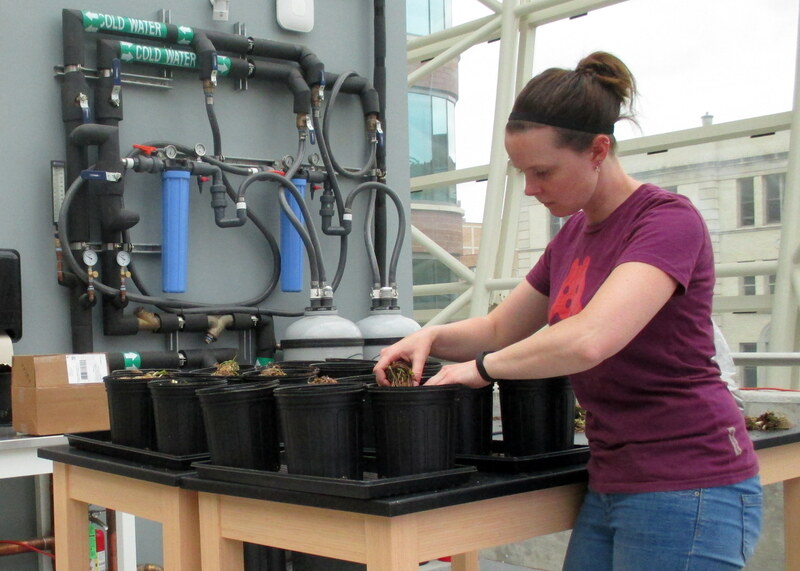 This month, I have been performing more laboratory tests on the special dirt that is used on green roof, called “growing media.” Growing media is a lot like dirt because it has nutrients for plants (and it’s dirty, trust me!) but it has a lot more rocks than most dirt you would find in a garden and it has to be really lightweight so that its weight doesn’t damage the structure of the building that it’s sitting on top of. This past month I tested the amount of acid in the growing media and also how much water the growing media could hold. 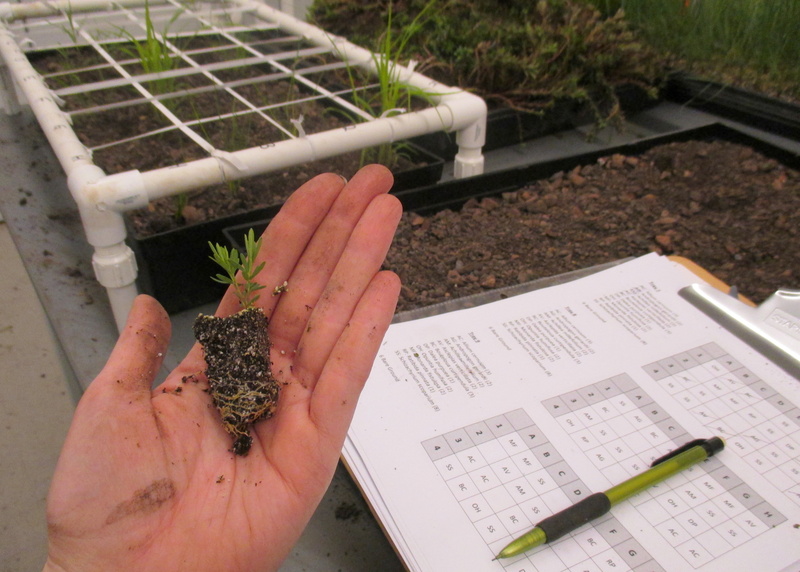 These measurements will help me learn which types of green roofs are better environments for a variety of plants to live. Caught in the act! This big crow has been tampering with my rooftop research. All the growing media tests have been going well except I had some unwanted visitors at one of my research sites that dug up my equipment and tampered with my insect traps. Crows! They must have thought that my equipment and traps were toys and that I had set up a wonderful playground for them, because they dug them up and tossed them all over the roof. I even caught one crow nosing around on the roof while I was working on the building next door. But, as a scientist, things happen that I don’t expect and I have to figure out how to solve problems like this. The next time I went back to these roofs, I installed bird-proof netting that allows insects to see and enter the traps but keeps the birds out. The netting seems to be working so far but I’m still keeping my fingers crossed. I sure hope this bird netting keeps the crows away from my insect traps and other equipment! Another big job this month has been continuing to sort through all the bugs I’m collecting and start making a dried collection of all the bees that I’ve found. It’s a big job! I’ve cleaned, counted, sorted and stored over 6,000 bugs so far. And with another 2 months of collecting, this job’s definitely not over yet. The reason that I need to make a dried collection of the bees is that I need to determine which type or species they all are and it’s much easier to do if the bees are dried and they are placed on little pins so you don’t have to keep touching them and accidentally knock off a wing or a head or something important. I’ve learned that in the region where I’m working there are over 300 different types of bees. Figuring out which species each of my bees are is going to be a challenge but luckily a local bee expert will be helping me. I’ve started drying, pinning, and labeling my collected bees. There are some really interesting bees on the green roofs in Germany. I hope that by next month’s research update I’ll have all the growing media tests done, more insects collected and hundreds of bees dried and on their little pins, ready for the next step of the naming process. 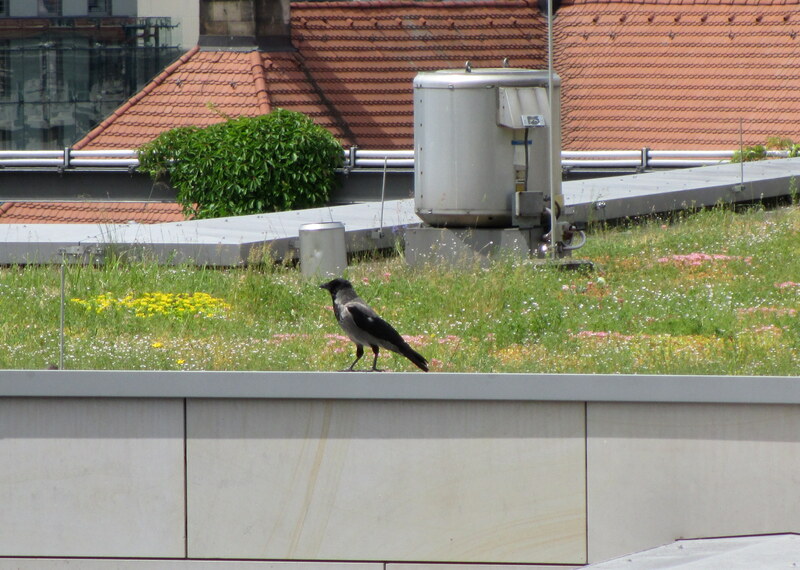 I am taking a close look at the plants on this green roof in Berlin to make my plant survey list. June has been the month of plant surveys for my research. 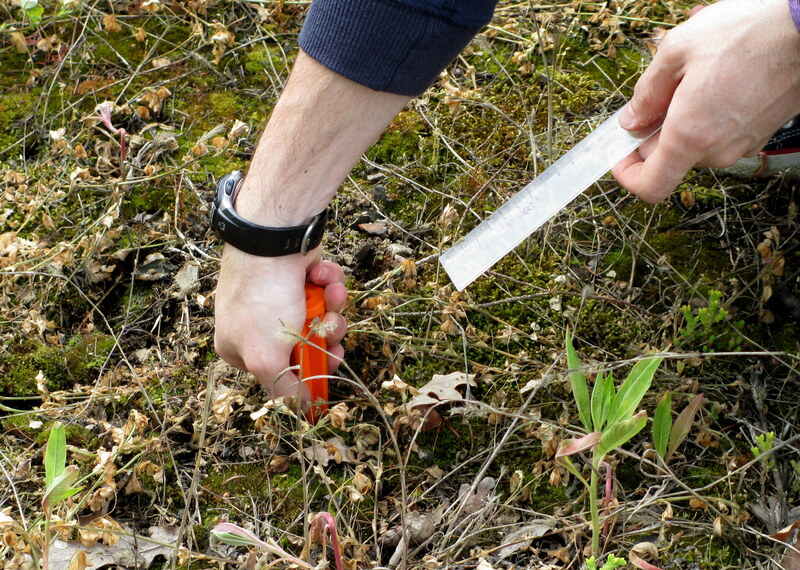 Plant surveys are lists of all the different types of plants (the plant species) growing in a particular area. For my research, these areas are green roofs. 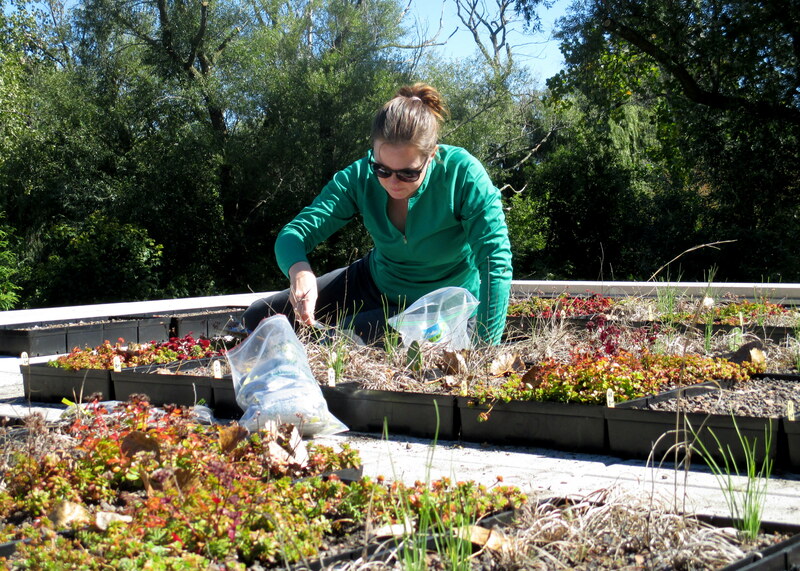 This summer I have 13 green roofs where I am collecting data. In June I went to each roof and made of list of all the plant species growing there. It might sound easy just to make a list but if you see a plant and don’t know which species it is, you need to use a key in book to help you figure it out. This can be fun (like being a detective!) but it can also be frustrating (for me, especially because the plant keys I need to use are written in German and I need someone to help me translate them). When I have a complete list of plants growing on a green roof then I can start to learn more about how the different plants live together and how they help insects live on city rooftops too. I fill a cylinder with soil from a green roof then fill it with water and record the amount of time it takes the water level to decrease by 1 centimeter (a little less than an inch). 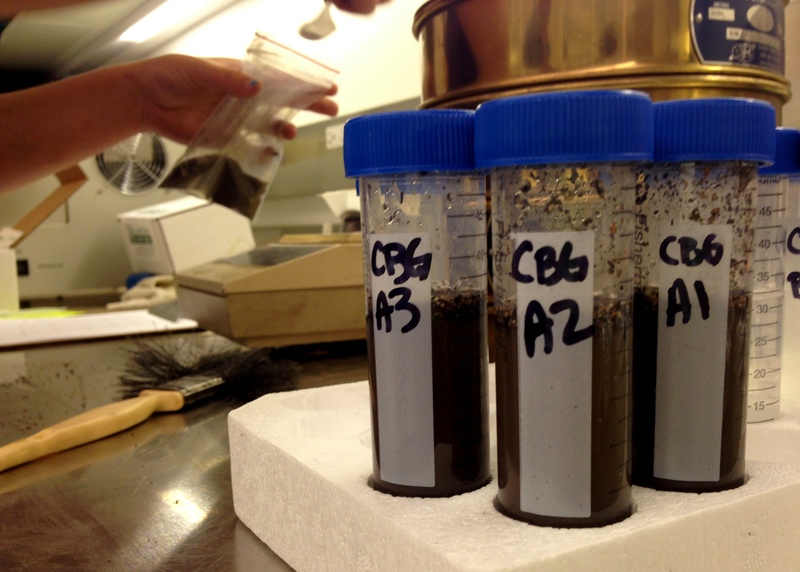 This month I also started performing some laboratory tests on my soil samples from the roofs. The first thing I’ve tested is called the “infiltration rate” which means how fast water is absorbed into the soil. 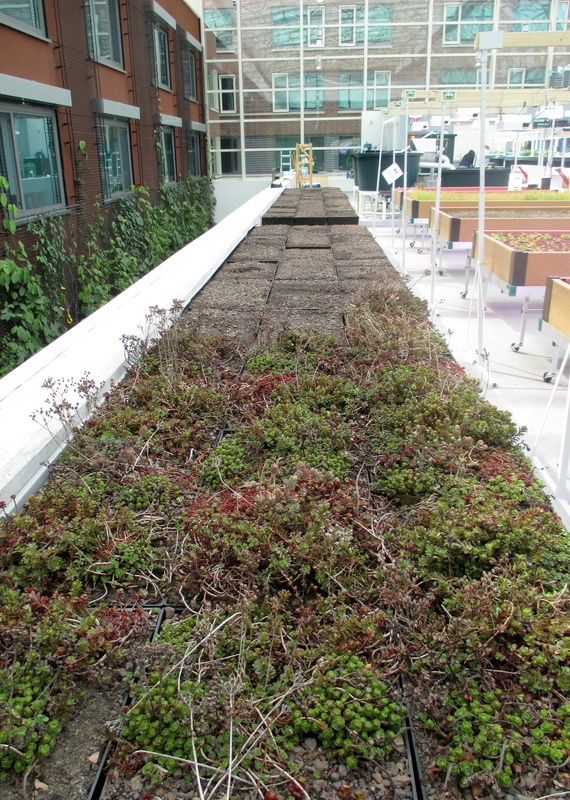 Some plants need quick-draining soil to live and other plants need more slowly-draining soil to live so the infiltration rate of the green roof soils helps determine which plants can survive on a roof. 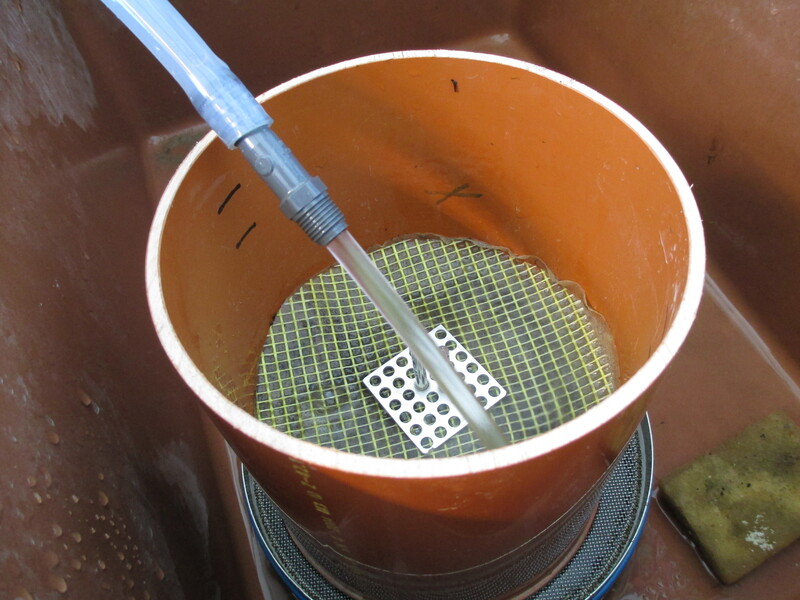 To measure this I fill a large cylinder with a specific amount of soil, fill it up with water, and use a special instrument with metal tips to determine how quickly the water level drops by 1 centimeter. After I do this for all the roofs I compare the times for each location. The roof soils with the longest times have the slowest infiltration rate and the roof soils with the shortest times have the fastest infiltration rates. In the future I will use this information to help predict which soil types will be the best for green roof plants. 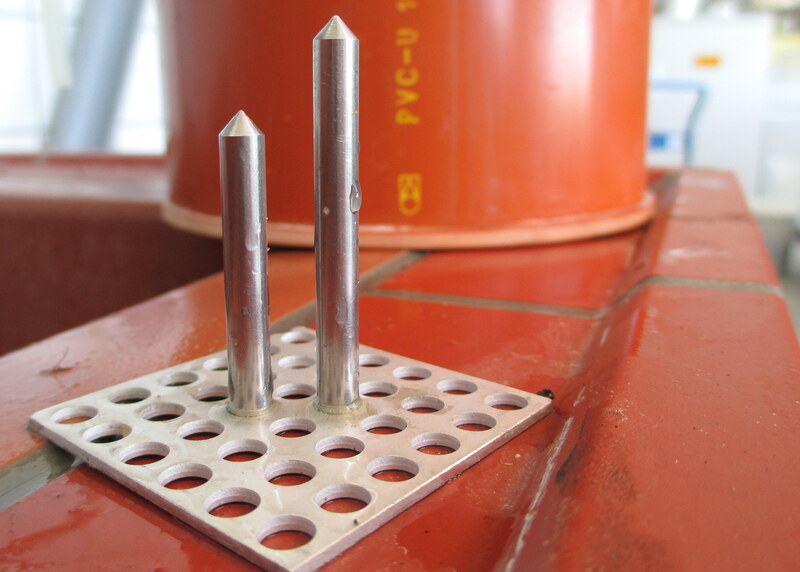 The pointed tips on this piece of equipment are 1 centimeter apart. 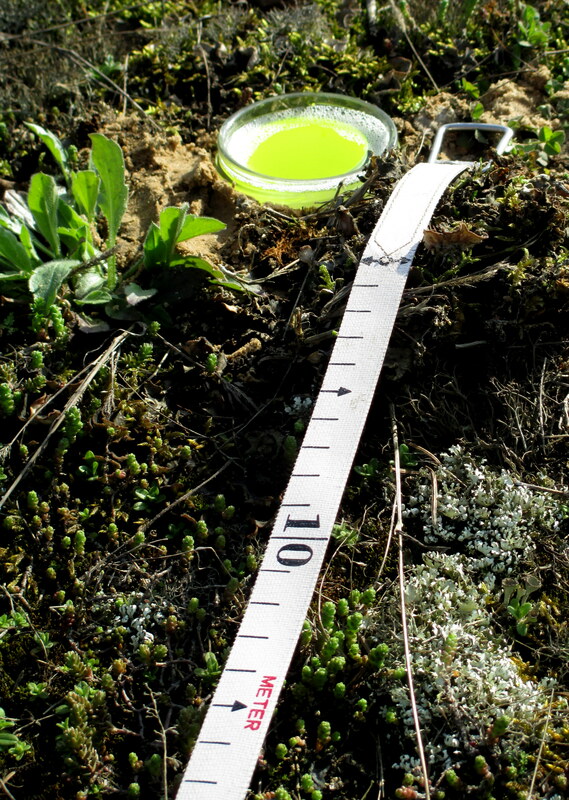 I use this to measure how quickly water is absorbed into the green roof soils. 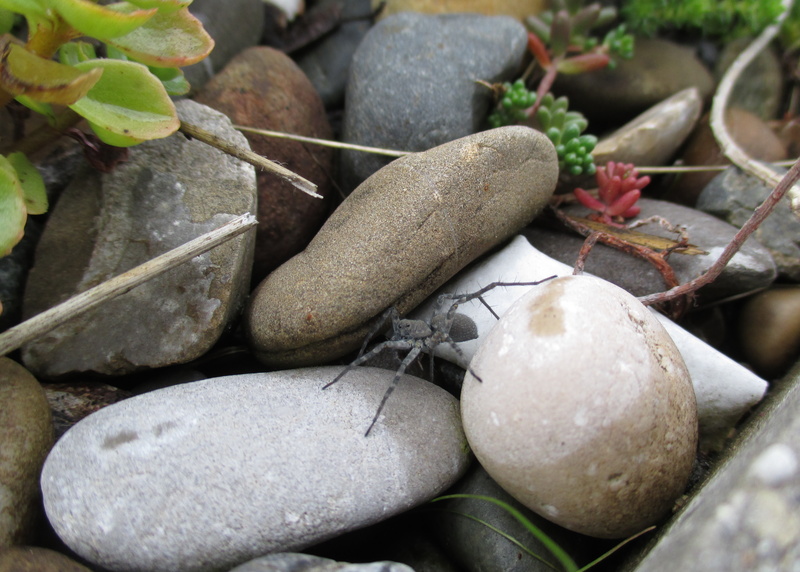 As I was working on the green roofs in June I saw a lot of interesting plants and animals. 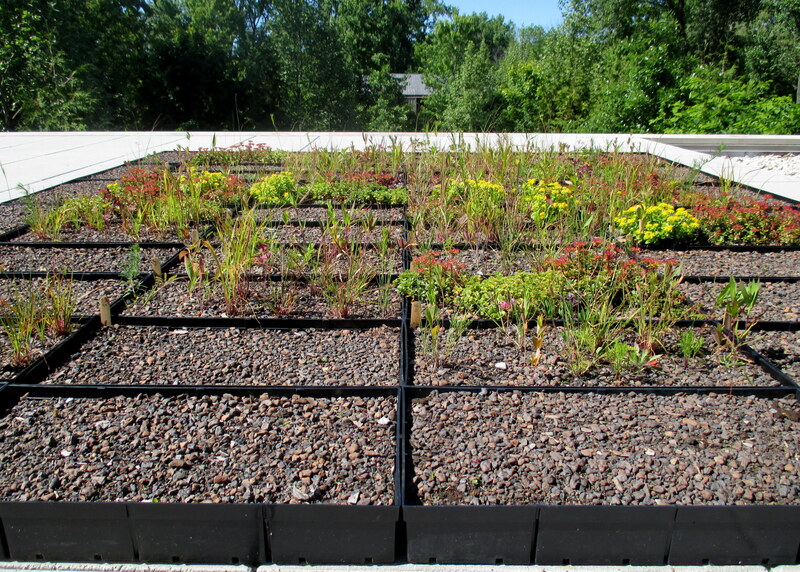 Here are just a few pictures of some of the green roof diversity that I have seen. A lot of different plant species grow on this green roof in Neubrandenburg. May was a good month for doing research. As a plant biologist, I always love when all the plants spring to life in May! I am carefully sorting and counting all the insects that I collect from the green roofs. This past month I added a couple new research sites to my project so now I visit 13 green roofs a few times per month. Like last month, I set up insect traps to collect all the little critters that are crawling and flying around on my research rooftops. Unfortunately, May was pretty cold and rainy which means that most insects were not quite as active. I didn’t collect as many bugs as I was hoping but at least I have some! 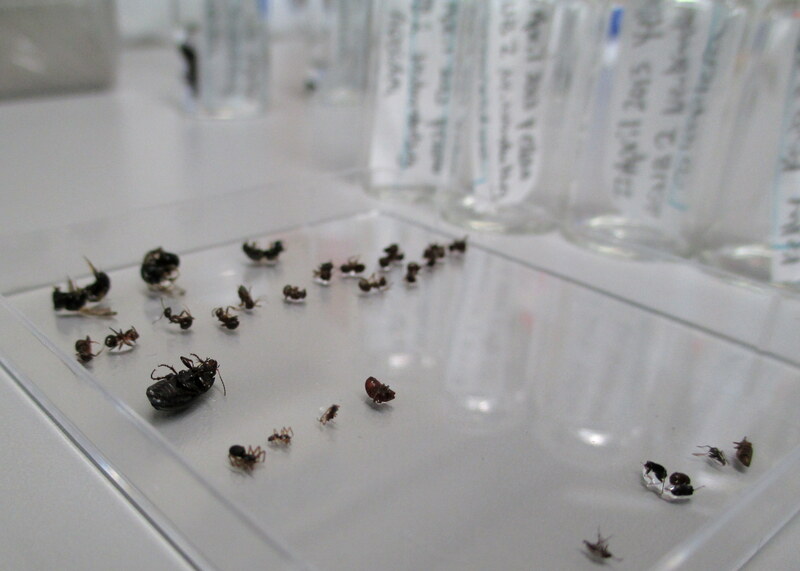 I have started carefully sorting all my collected bugs into different categories like ants, bees and beetles. I will have to spend a LOT more time with these little guys if I want to determine their scientific Latin names, but at least I have started the process. In April alone, I collected almost 1,200 bugs! How many will I collect by the end of the summer? I’m not sure but I am looking forward to seeing if there are any interesting connections between the insects and plants on these green roofs in Germany. A colleague and I measure the depth of the soil on each green roof. 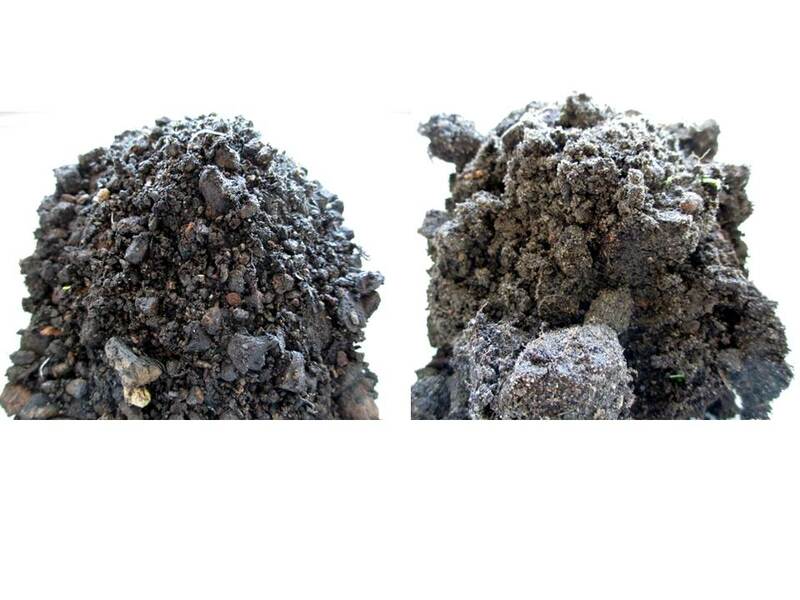 I’ve collected small samples of the soil on the green roofs. I have also begun collecting other data from the green roofs. As with any garden, the properties of the soil are very important for plant growth and survival. Good, healthy soil means good healthy plants! So I collected a small sample of soil from each of the roofs that I brought back to my laboratory. I hope to test different properties like how many nutrients are available to the plants, how compact the soil is, and how much water it can hold. Although the soil lab at my university is under construction right now, I’ve got my fingers crossed that I’ll still be able to figure out a way to do all these tests. I hope that when I know which types of soil help the plants and bugs the most, then these types of soils can be used on more green roofs in the future. I carefully record all my observations in a notebook so I don’t forget any of the details later. Starting next week I will begin measuring the plants and trying to identify all the different plant species that are growing on my green roofs. I think it will be hard work but it is fun to be a plant detective and figure out what all of the plants are called! And on the days when I’m not working on the rooftops, I will be working on getting some presentations started. I found out that I will be presenting my research at the World Green Infrastructure Congress in Nantes, France this coming September and my advisor will be presenting some of my research for me at the Ecological Society of America’s annual meeting in Minneapolis in August. So I had better go get to work! Spring has finally arrived in Germany and with that comes the beginning of “field work” season. This year that doesn’t mean that I’m literally working in a field but that I’m working outside to collect data rather than doing work at a computer or inside a laboratory. Re-painting my insect traps with heavy-duty car paint. Still not a perfect solution but it worked much better than the last time. April was very busy with last-minute planning for my field work, especially because I am only able to travel to my “field sites” (my green roofs) on specific days. 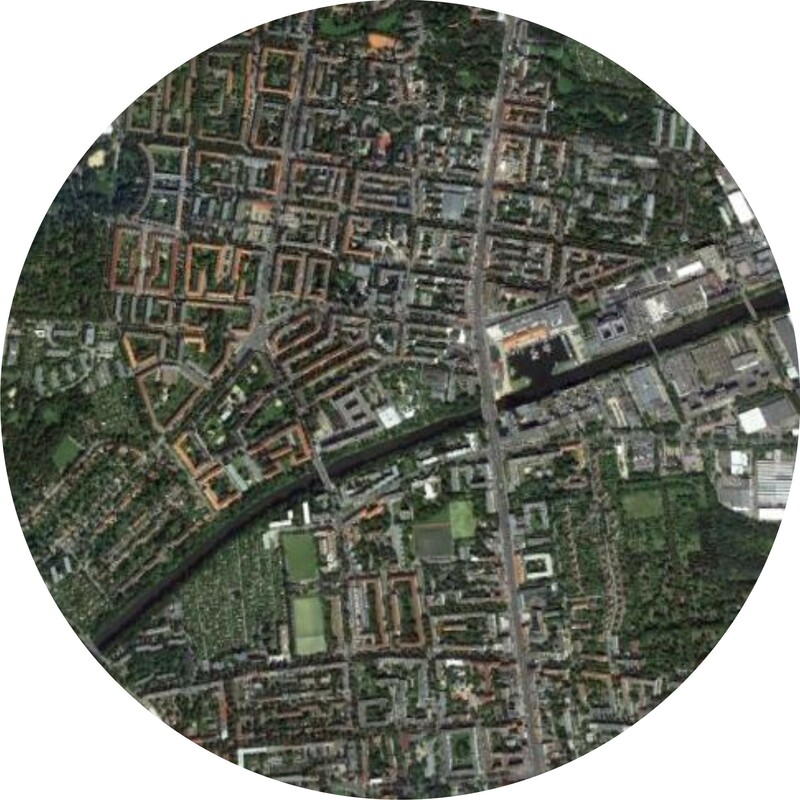 When I go to the green roofs in Berlin, I need to drive for about 3 hours just to get there so I have to be very organized and make sure that I can stop at all of the roofs during the same trip. Also, I need to try to keep everything that I do the same on each roof so that I am able to make good comparisons at the end of my experiment. When I set up my insect traps on the green roofs I made sure that they were all spaced out exactly the same. For example, when I set out insect traps they all need to be in place for the same number of days and in the same type of weather. If I put some traps on a couple roofs on sunny days and put some on other roofs on cloudy days, I might collect different types or numbers of insects. This wouldn’t help me explain how plants and insects are related because the weather could be a factor affecting my data too. Does this look like a field of flowers to you? Maybe not. But bees see things differently than people and will think that these traps are actually flowers. 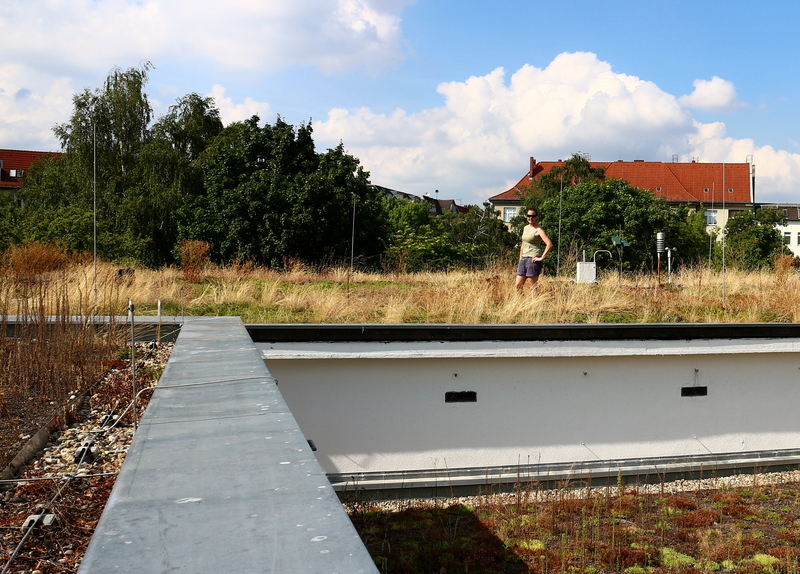 All the inset traps are buried on the green roofs in Berlin and Neubrandenburg now. With good planning, I was able to finish making all my insect traps and set them up on all of the green roofs in Berlin and Neubrandenburg that I will be working on this spring and summer. The traps were filled with a preservative liquid so the trapped bugs wouldn’t begin to rot and were left open for four days. Then I came back to collect all the insects. I am happy to report that the traps worked! (I let out a big sigh of relief!) All the bugs are now being kept in special bags filled with alcohol which helps to preserve them. Next month, I will begin to sort the bugs into different categories like spiders, bees, ants and beetles, and then start to determine what each bug’s scientific Latin name is. Because I am a botanist and not an insect expert I think this is going to be hard but also really fun! The traps worked! I collect all the insects from the traps and store them in special plastic bags filled with alcohol for now. I attended a seminar where I started to learn how to identify insects like this beetle. 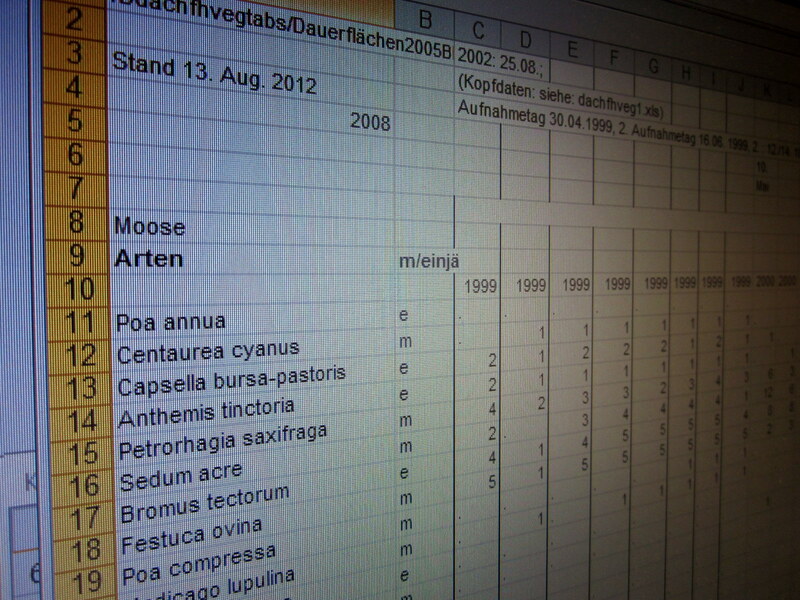 Determining all the names of the insects that I collect from the green roofs is going to be a very hard job! Next month I will collect insects again with the same traps and will start to collect data about the different soils on the green roofs too. Sometimes I think it is funny that I have to learn so much about soil and bugs when I really want to answer questions about plants. 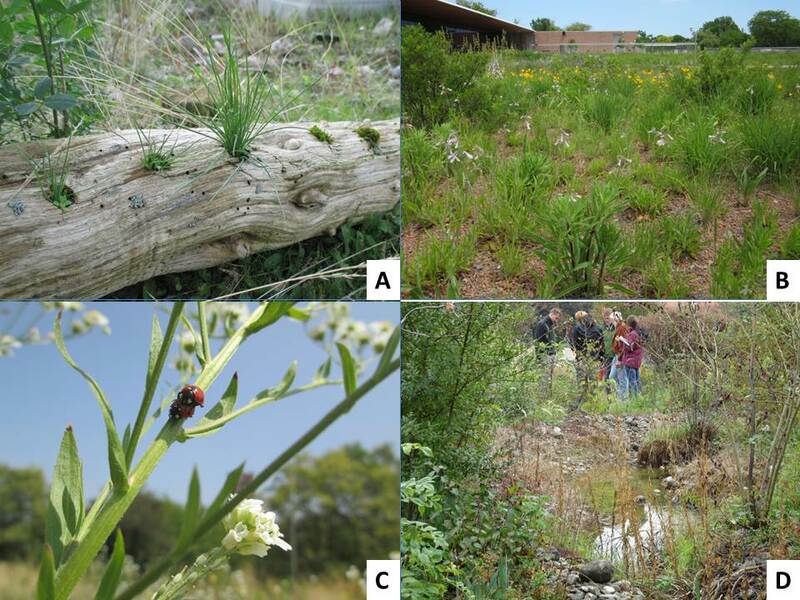 But everything is so connected in the environment and when I know more about the relationship between plants-bugs, plants-soil, and plants-plants, then I will be able to really understand how and why plants can live successfully on green roofs in our cities. This month, work for my research shifted to preparations for my field work and data collection. The first steps to field work involve determining what data you will collect and where you will collect it. 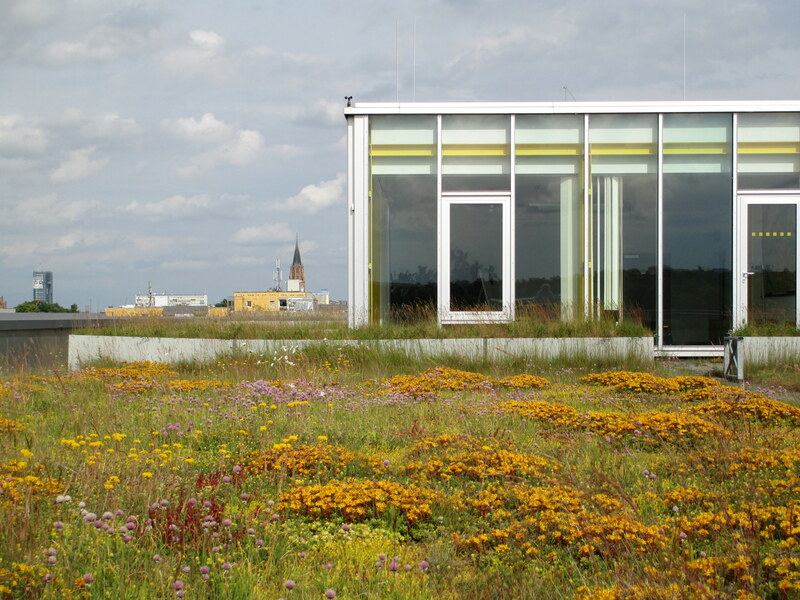 I already know that I would like to collect data about the plants and insects living on green roofs in and around Berlin. Trying to find good places to conduct this research is much more complicated. 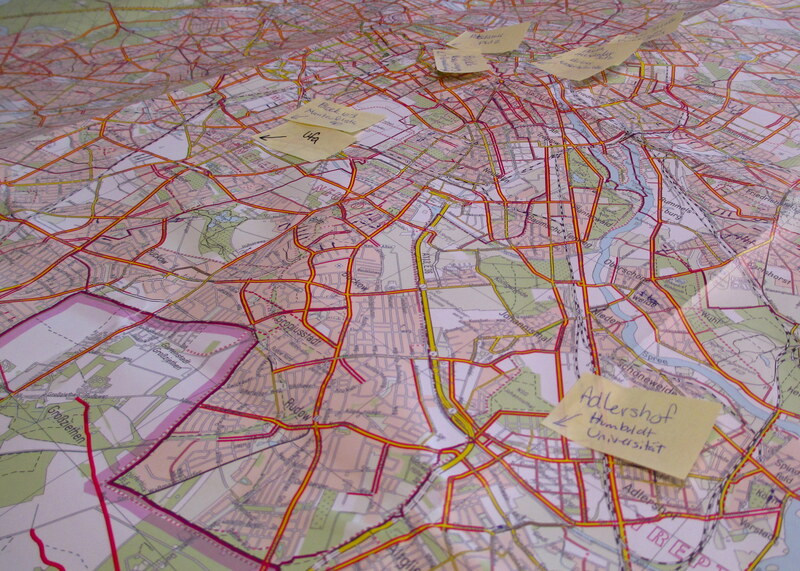 I use this map of Berlin to determine where I need to look for more research sites. I am hoping to get permission to work on green roofs all over the city. 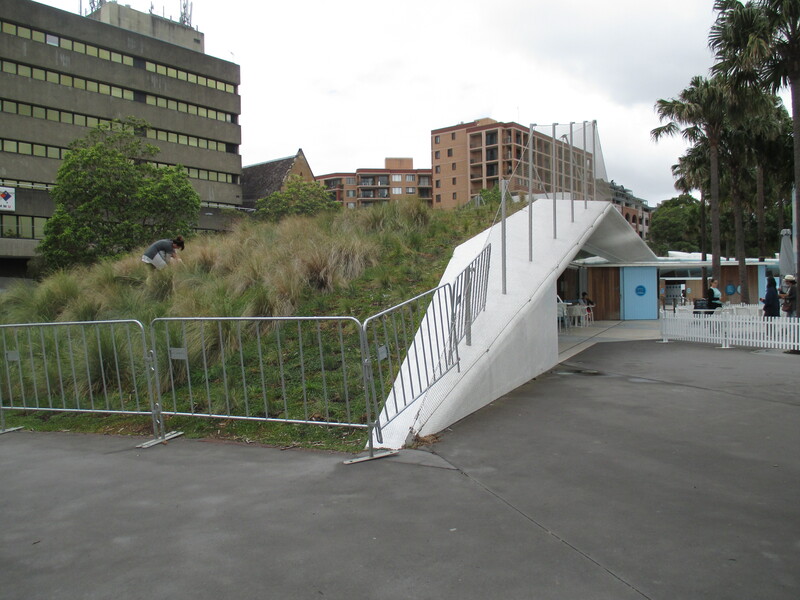 Getting permission to collect data on people’s green roofs can actually be quite a challenge. Just like in America, I am finding that some people in Berlin would rather not have anyone up on their roof. Building owners have many concerns including my safety, the security of their building, or the availability of a staff member to unlock doors and provide ladders for to access the roof. Of course trying to explain that my project will help improve the biodiversity of cities around the world is also much more difficult when building managers speak only German and I don’t know the language very well. But I had a couple good meetings in March and I am slowly making progress, adding little post-its to my map of research sites one by one and looking forward to getting up on the roofs soon. A fellow researcher helped me paint my insect traps only to have the paint dry up and blow away moments later. I will need to find another method to collect bees from green roofs this summer! I have also been gathering and buying supplies that I will need to bring with me when I start to collect data next month. I will need insect traps, tools to measure the plants, and tools to measure different properties of the “growing media” which is just a name for the special type of lightweight dirt that is used on green roofs. I am finding that this is also more of a difficult process than I expected because some of the supplies that I use for my plant science research in America are not available in Germany and it’s too expensive to have supplies shipped overseas. Additionally, some of the techniques that I counted on in America aren’t working. For example, in the past I have always used these “bee bowls” to collect bees which are little plastic cups spray-painted with fluorescent paint. When I tried to spray-paint plastic bowls here in Germany, the paint peeled right off – it literally dried and then blew away in the wind! Obviously, this is not going to work. But being a scientist who works with unpredictable plants means that I always have to be ready to adapt to new plans and possibly develop new methods of doing things. I haven’t thought of the perfect method for painting my traps yet, but I will be sure to let you know next month what I came up with! This is one of my potential research sites in Berlin. It’s almost April but all the green roofs are still covered in snow! The best news of March: I am very excited to be supported by the Phipps Botany in Action program again in 2013! I look forward to continuing my blog posts to update you with my research progress. Thank you Phipps!!! 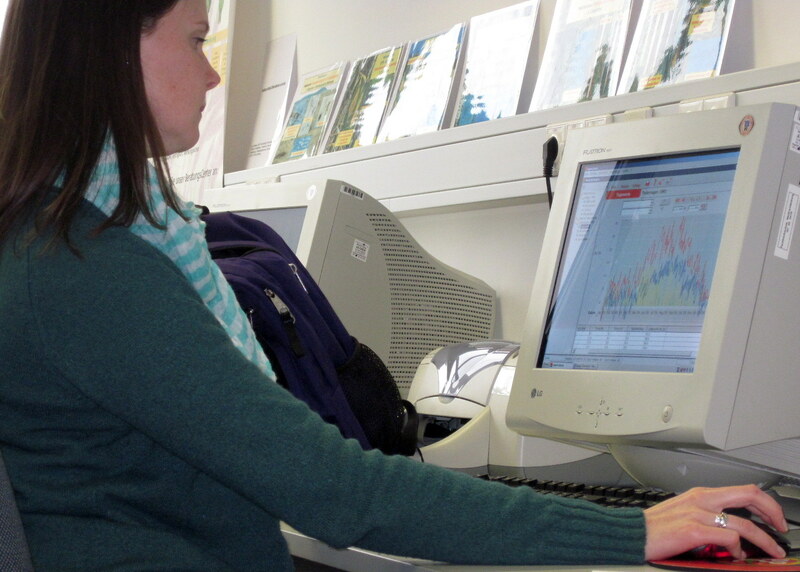 There is a special computer lab at my university where I can access different types of daily weather data. February was very cold, cloudy, and snowy. But there is always work to be done as a plant scientist, even if the plants aren’t actively growing. I found that I used Skype a lot to video-chat with scientists back home in America about many topics including conference presentations, funding for research, green roof education materials, and reports that need to be written. This past month I also spent a lot of time continuing to work on a project with my advisor in Germany. We are trying to find out if plants with particular qualities are able to survive on green roofs during different shifts in the weather. For example, which plants will die when the winter is very cold? Which plants will survive with very little water during a drought? If we discover that the tough survivor plants all share some qualities (like producing a lot of seeds or flowering very early in the spring) then we can let people know that these types of plants would be good ones to use on green roofs in the future. I am excited to learn the answers to these questions and more but it does mean that I have to spend a lot of time at the computer sorting through data. I will continue to work on this project for at least a few more months. In February, I also continued to work on planning a different project that I will be working on the rest of my time here in Germany. 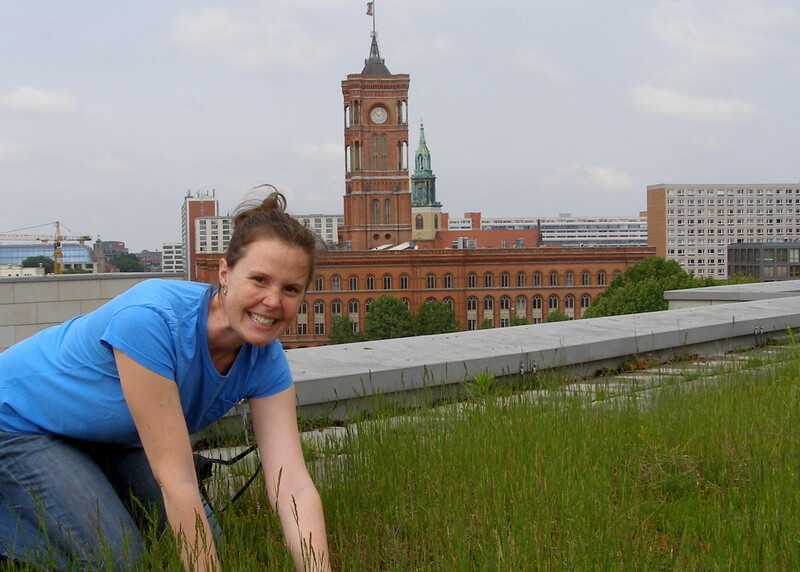 I will be collecting plant and insect data from about 20 green roofs in and around Berlin. I have been spending time becoming familiar with the types of insects that I might find so when I collect them I will be able to identify which species they are. I have also been working with my project advisor to determine which sites will be best for my research. There are so many green roofs in the area to choose from and it would be impossible to study them all! 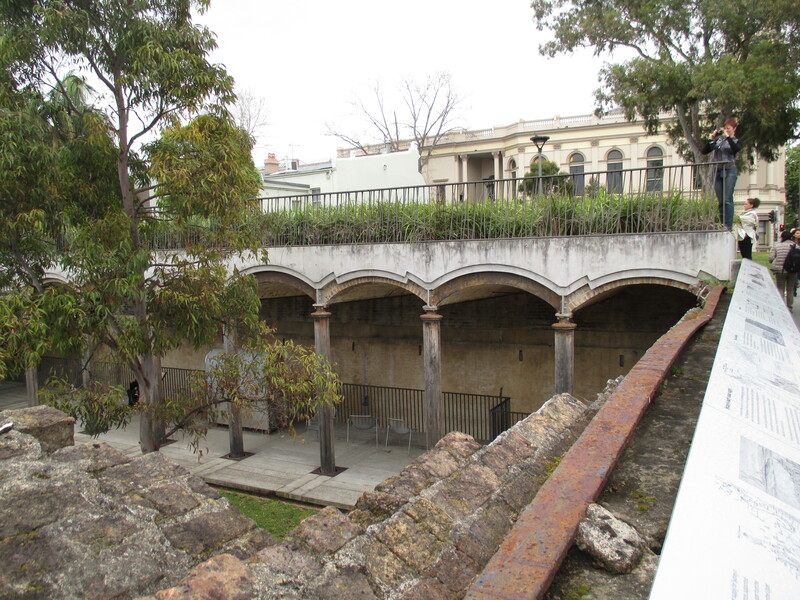 This building was built as a water-pumping station in the 1870s. Today, it has a very diverse green roof! We were able to go to Berlin for a couple days to talk to some people who work with green roofs there and to look at some of the potential sites. It was such a treat for me to be able to stand on the roofs and touch the plants in locations that I had read about when I was still in America. 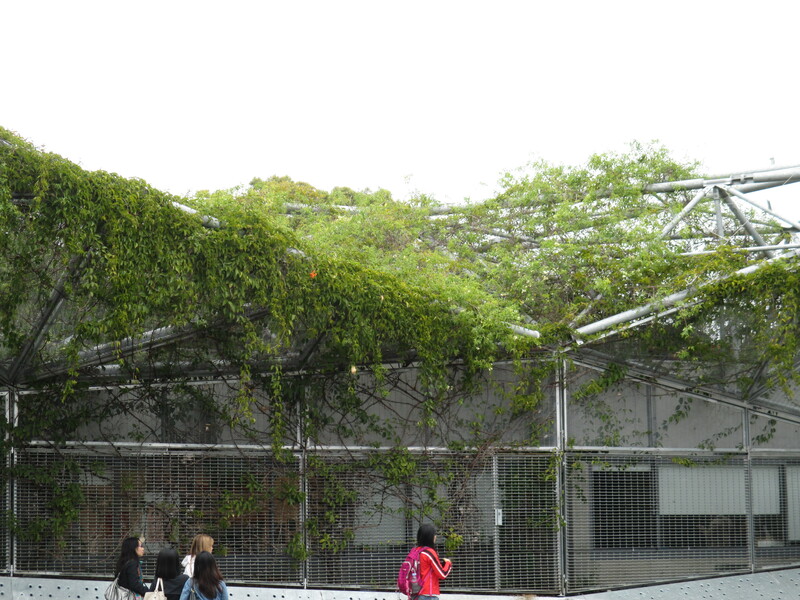 One of the green roofs we saw was built in the 1970s when a group of artistic people thought it would be neat to put plants on their building. It is now a great research site, complete with solar panels. Another roof we saw was built unintentionally about 130 years ago when some people put a layer of sand on their roof to help cool the building. Over the years, plants started to grow and today there are many plant species there, including some very rare ones! I am very excited to start collecting plant and insect data at these locations but will also need to find others to add to my project. I am looking forward to collecting data once the weather gets nicer! 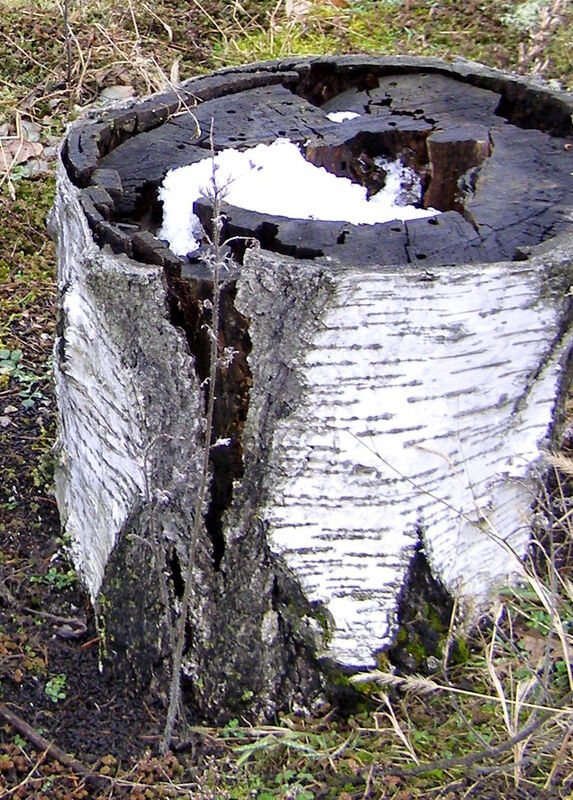 This wooden tree stump was put on a green roof 3 years ago. You can tell by the little holes on the top that beetles have been living here. I was very excited to be standing on one of the green roofs built in Berlin in the 1970s that I had previously read about. 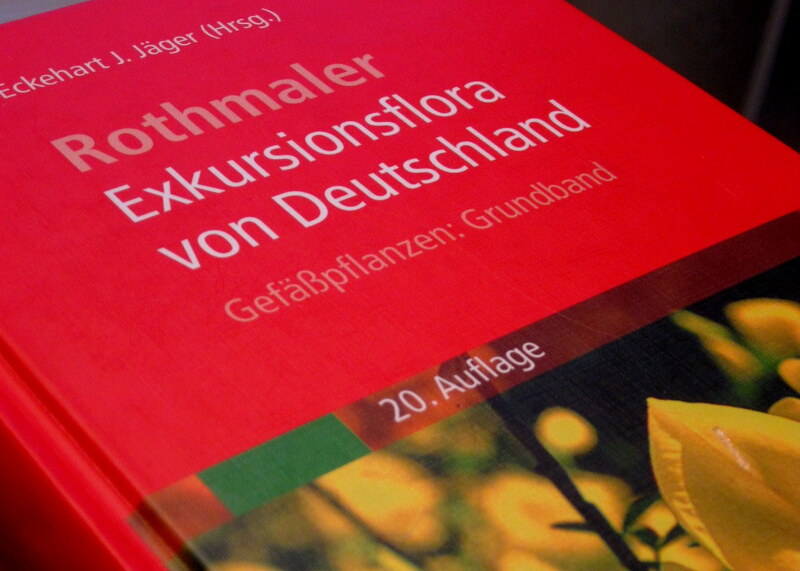 This is a guide to the native plants of Germany. It will be very helpful when I need to identify all the plants I find on green roofs this summer. 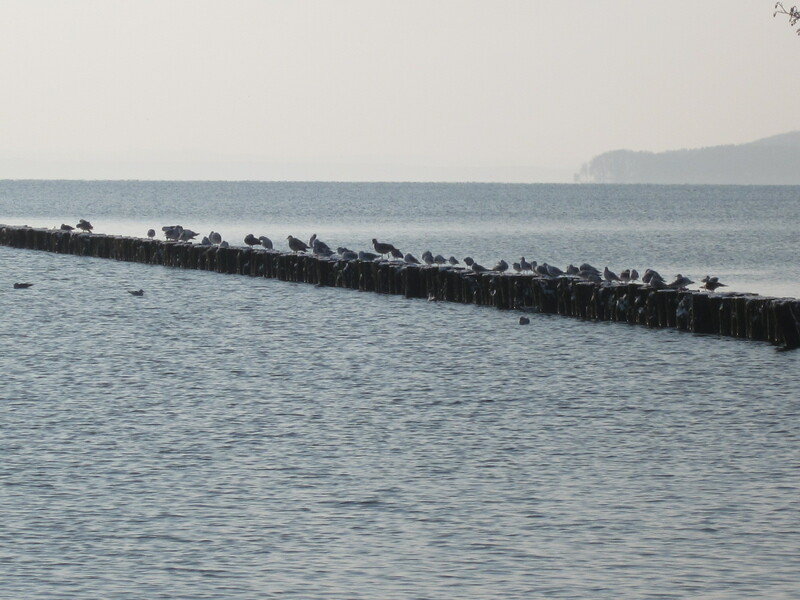 I am excited to be writing my first research update from Germany! I have been here almost 4 weeks now, and have been getting used to the new location and culture. I was here less than a day and already got a short tour of the offices, labs and green roofs on the college campus where I will be working until November. This is just a small sample of books I need to use for my research. They are all written in German! I think one of the most challenging things so far has been the difference in languages. I took some German classes when I was still in America but I am finding that it is much more difficult to communicate with people than I thought. It is also very difficult to read some of the books, websites and scientific papers that I need to complete my research. I am very thankful for the Google Translate website! I am now taking a German class for 3 hours every day and I think that will really help too. 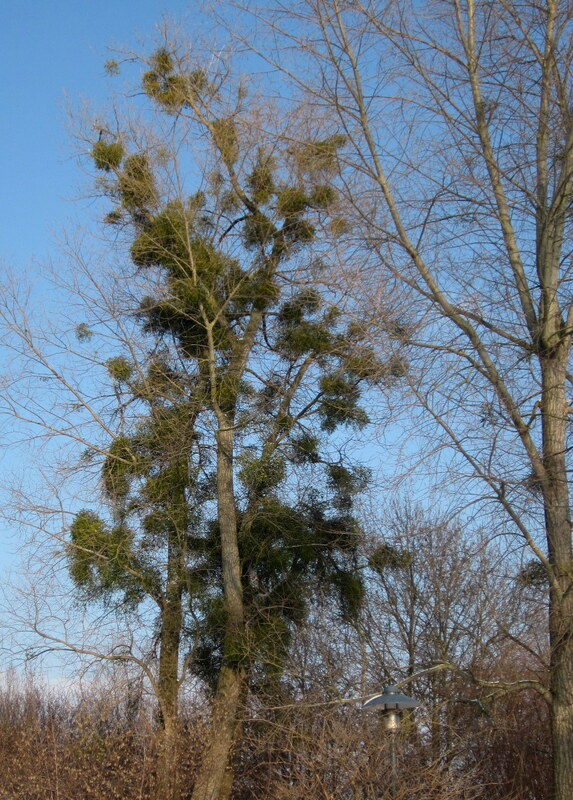 Without the leaves on the trees, you can see just how much mistletoe grows here! The German university where I am now working is right next to a lake. How will all these birds affect the plants and insects that I find on the green roofs? What kinds of insects will I find here? Some of the green roofs where I will be collecting data this summer are very close to a large lake where there are a lot of birds. I know that sometimes plant seeds come onto green roofs through bird droppings – birds eat the seeds but they don’t get digested. I wonder how this will affect the types of plants that I find on green roofs that are close to the birds and to the lake. My project advisor has been recording plant data on green roofs for decades. It is exciting but a little overwhelming to look through all of it. Even though it will still be a few months before the flowers are blooming, the bees are buzzing and I can start collecting data, I still have projects to work on right now. I have been doing a lot of reading to find out what other researchers have discovered about green roofs in this area. 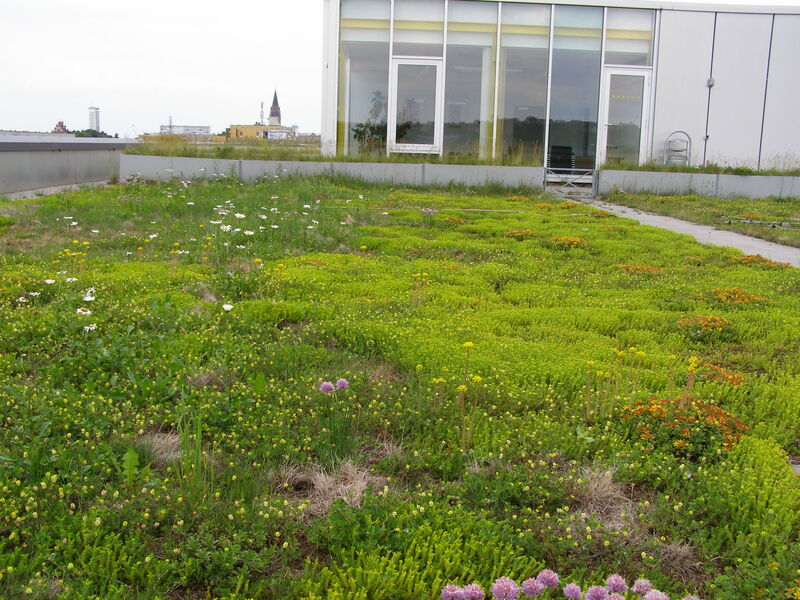 My project advisor here in Germany has been visiting some green roofs and keeping a record of the plants that grow on the roofs for the past 20 years. This is a long time to collect data and it is exciting to start looking through some of his records! I have also been sending emails and making phone calls to ensure that I have permission to go to some green roots that are on private homes in Berlin. 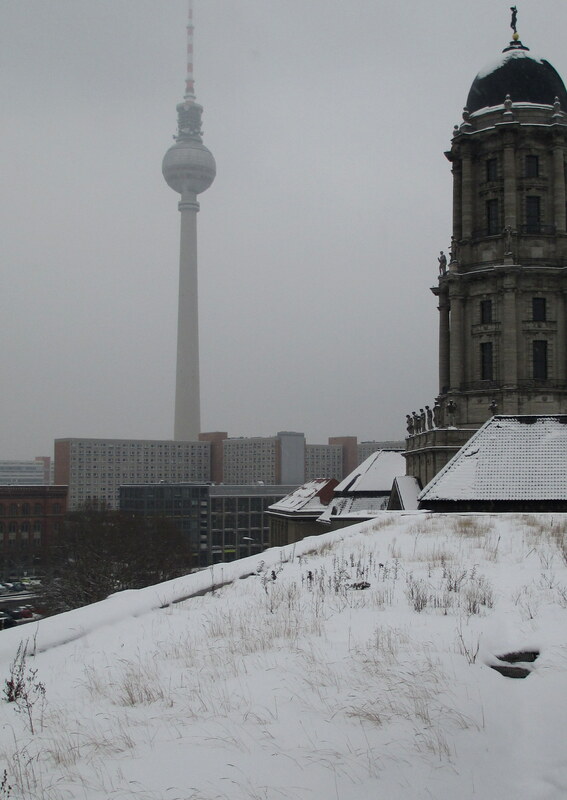 Next month I will be going to Berlin to look at a green roof that I am hoping to include in my research – it is over 100 years old! 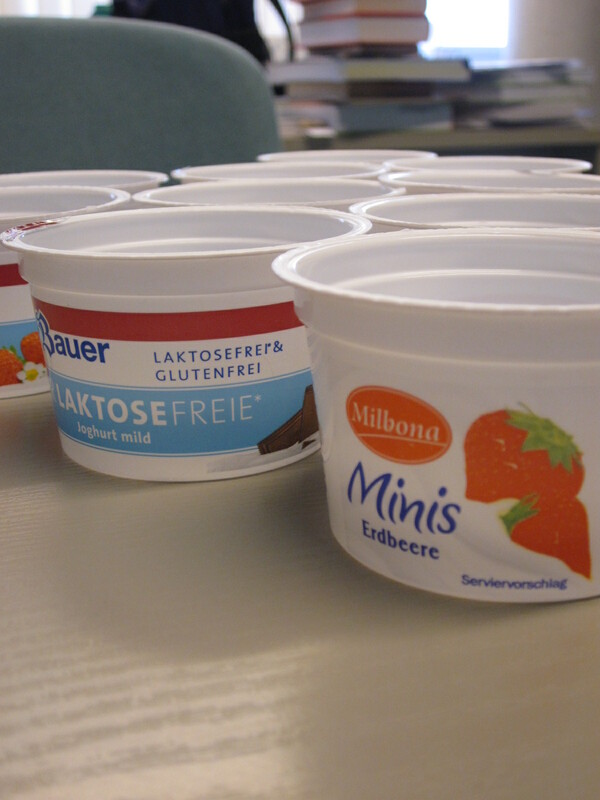 You might call them yogurt containers, but I call them bug traps! And I am also beginning to collect research supplies. In America I made these little containers to collect bees. We call them “bee bowls” and they are basically little plastic dishes filled with water and painted with iridescent colors to attract bees. I will need to make similar bee bowls here, but the dishes they use are actually yogurt containers. It’s not the most scientific thing I do, but eating yogurt is a necessary step to collect research supplies and I’ll need a lot by May so I am starting early! Last post of 2012! Happy Holidays to everyone! This month was busy with a lot of wrapping – not only wrapping Christmas presents but also wrapping up a lot of work before I head to Germany for my research fellowship. I finished taking a statistics class where I learned how to use different types of mathematical tests to find out if differences that I observe in my research are likely just caused by chance or if there are really other processes at work. I used some of these statistical tests to find out if the types of bees I was finding on green roofs had anything to do with the type of roof. My colleague and I found out that the size of a green roof, the height of the roof, and the time since it was planted aren’t good measures to predict what type of bee community will be on a green roof. 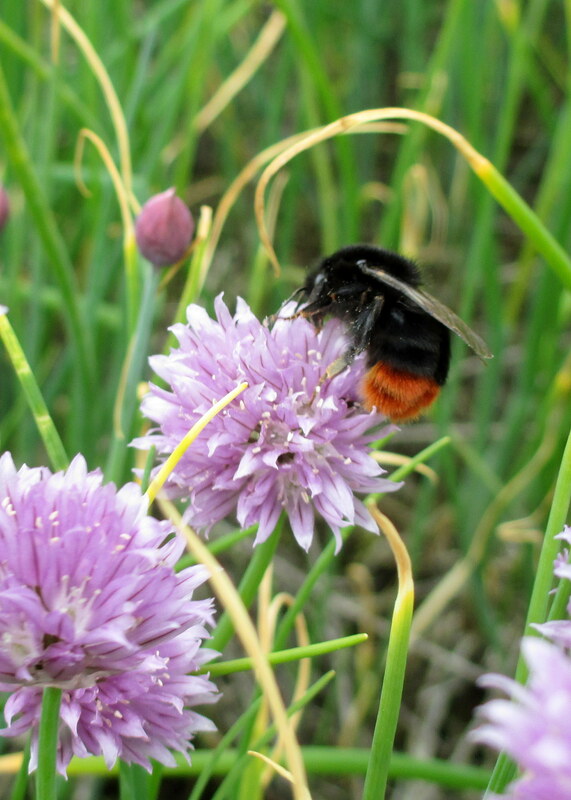 BUT the variety of plants (especially flowers that provide nectar and pollen – food for bees!) is a good predictor of bee communities. 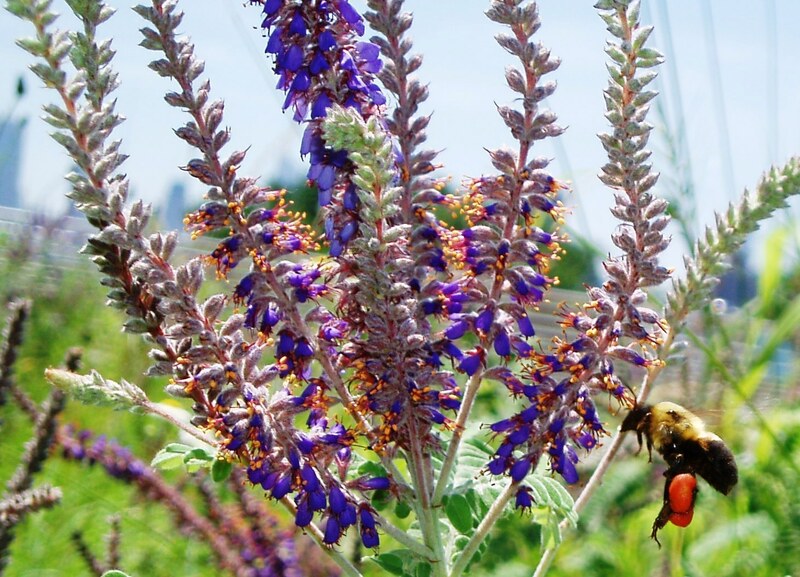 This bumble bee is enjoying the pollen and nectar in the leadplant flowers on a green roof in Chicago. We found that green roofs with a wide variety of flowers had many more bees and many more types of bees too. This is similar to what you would expect to find on the ground but no one has ever tested this on green roofs before. We are still working on writing the manuscript and getting it published in a scientific journal, but that is our most exciting finding. This month was also very busy with writing grants. I will need money to carry out all my research in Germany as well as start a couple other projects when I come back to Chicago in the fall. Scientists all over the world have to compete with each other to obtain money for research and graduate students are no exception. 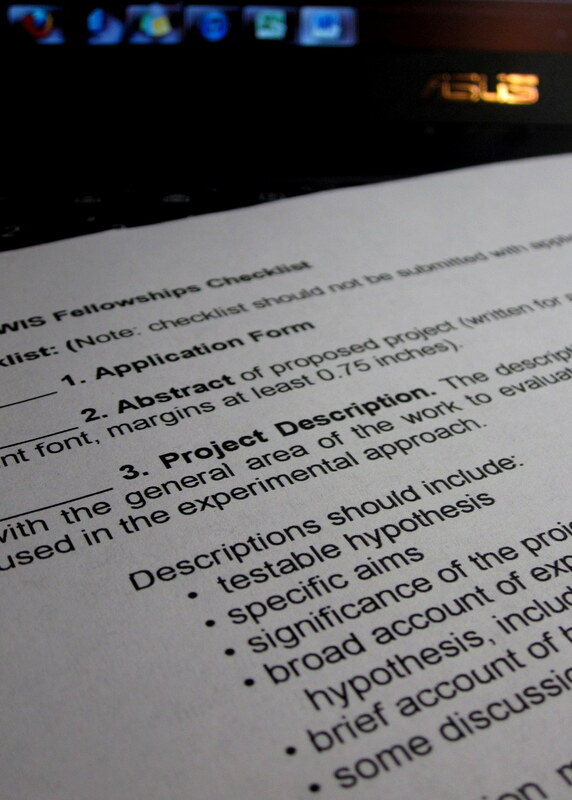 Grant applications can require a lot of specific information. Grant writing can be a very tedious process because there are a lot of requirements from each organization that must be met in order to have your grant proposal considered. But I also like the grant writing process because it forces me to sit down and really think about the design of my experiments and data collection. When I have to provide an itemized budget, I think, “Do I REALLY need that or could I use something else?” When I have to write a statement about why my research is important I always get more excited about what I do. 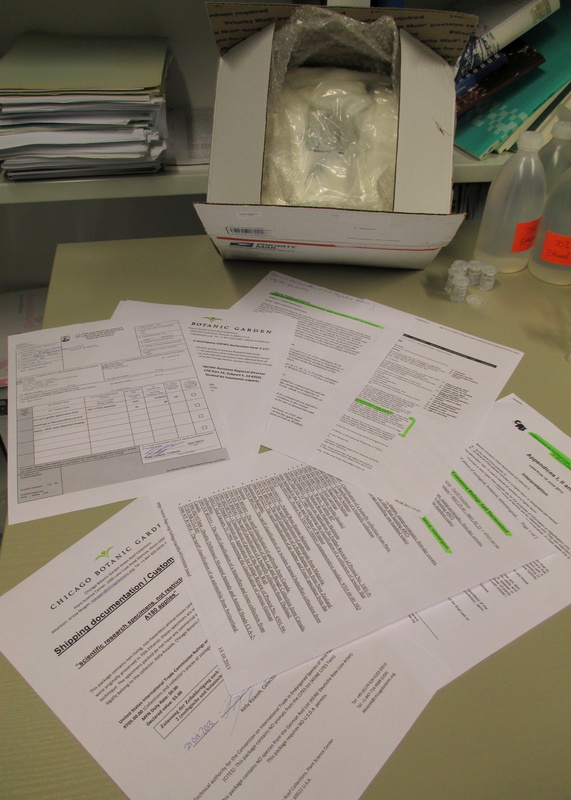 Most of my grants for 2013 funding have been submitted – now I just cross my fingers! 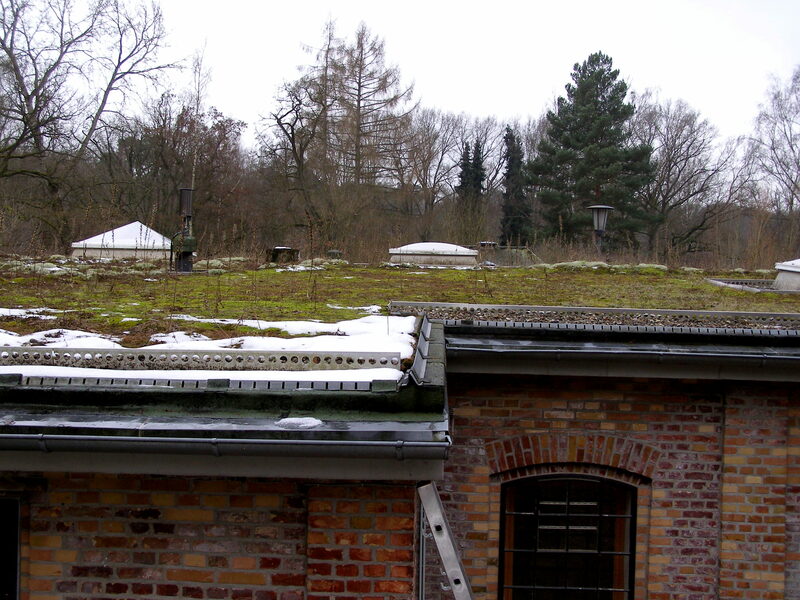 One of the green roofs in Germany where I will be working in 2013. And finally, this month I have been preparing to go to Germany for my research fellowship. I leave in 5 days – I can’t believe it! There has been a lot to do just so I can go there and live as a visiting graduate student for a while. I have needed to organize a research project that I set up in Chicago so that my advisor will be able to collect data for me while I am gone. I had to figure out how to get from the Berlin airport to the town where I will be staying because their railway in undergoing construction. I had to find a place to live. I had to get an international driver’s permit so that I can rent a car when I need to visit my different green roof research sites. This list could go on, but you get the idea! Although it has been a bit stressful to get everything organized I am also very excited to be able to learn about how green roofs change over time. 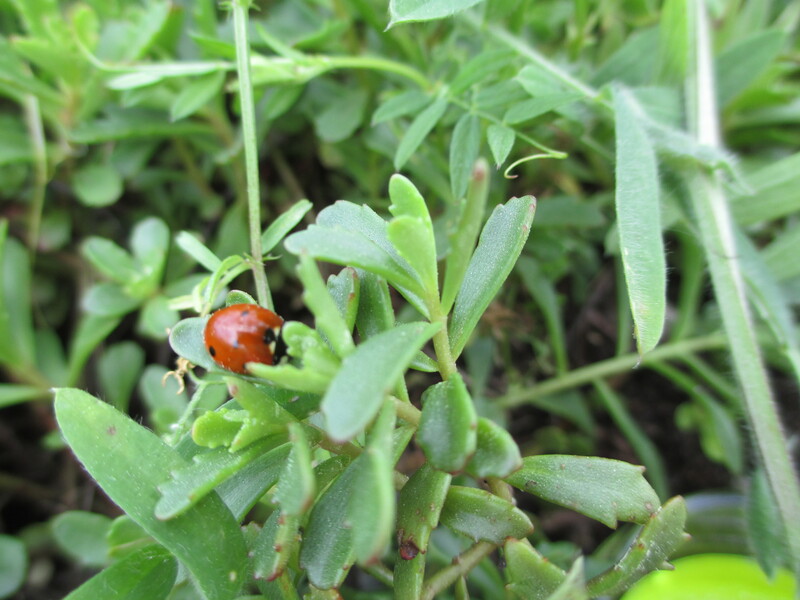 For my project, I will be determining the characteristics of plants that help them survive on green roofs for many years and finding out how these types of plants might be able to help insects like bees, beetles, and ants by providing them with food and nesting places. I can’t wait to bring you more updates on this project when I am in Germany. 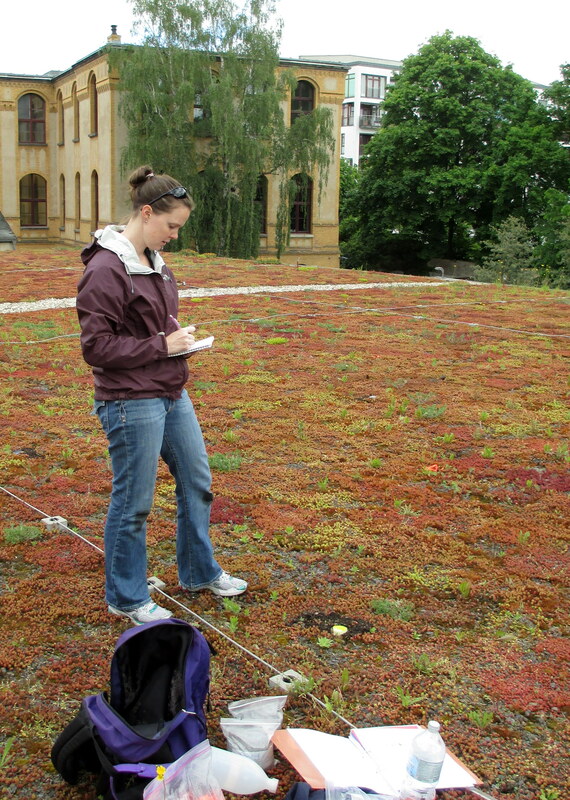 For my fellowship in Germany I will be determining how green roof soils, plants, and insects change over time by studying roofs of varying ages. The weather became colder, the days grew shorter, and I started more of my indoor work in November. This past month I had the chance to attend several seminars and presentations at Northwestern University and the Lincoln Park Zoo. I was also a guest lecturer at a class at the Illinois Institute of Technology. 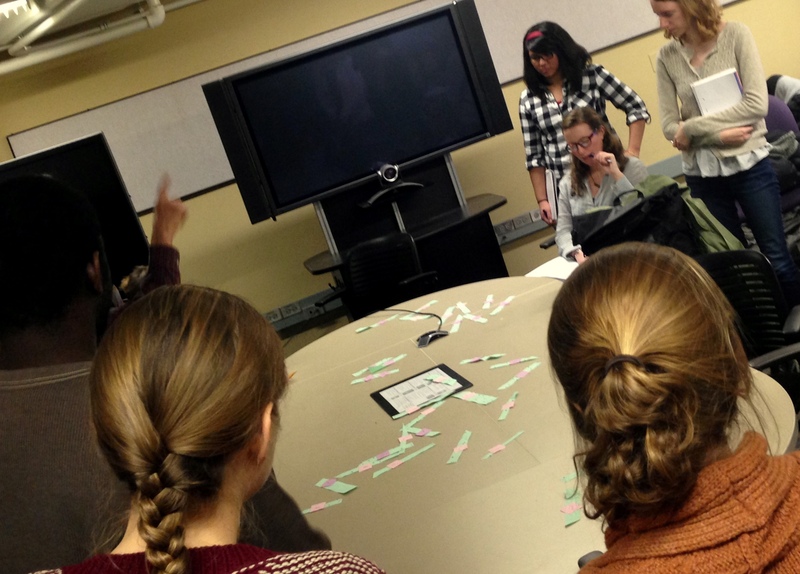 The students in this class were all studying landscape architecture: the design of outdoor spaces like parks and gardens. Because the green roofs that I study are a type of outdoor space that is designed by landscape architects, the students were very interested in how different types of plants survive in these environments. 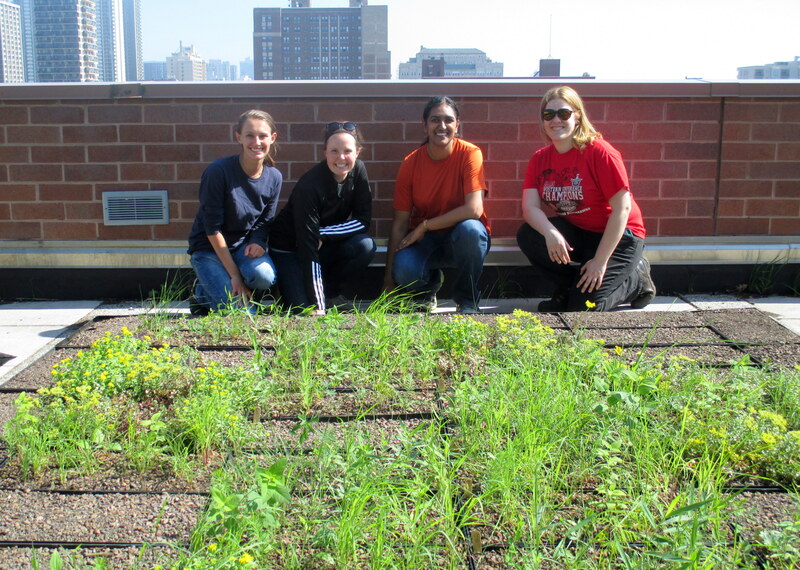 I brought some of my research tools so the students could see the things that I use when studying green roofs and we got to take a little tour of one of the roofs where I planted seeds last month. It was fun to talk about my research and I loved answering all the students’ eager questions. In November, I also attended the Chicago Wilderness 2012 Congress. Chicago Wilderness is a partnership between many organizations throughout Wisconsin, Illinois and Indiana that try to protect nature around the Chicago area and educate people about this important topic. At this day-long meeting hundreds of people listened to presentations, had discussions about how to improve regional environmental conservation efforts, and met other professionals from the area. I loved getting to hear all about the exciting things that are being done to protect nature and got to talk to people who preserve wildlife like dragonflies, bees, and spiders. It is exciting to know that just because people live in a big city they still care about plants, animals, clean water and healthy land for future generations. These are some of the bees that I’ve collected on green roofs in Chicago. This past month, I was also busy writing a manuscript with another researcher that we hope to have published in a scientific journal soon. 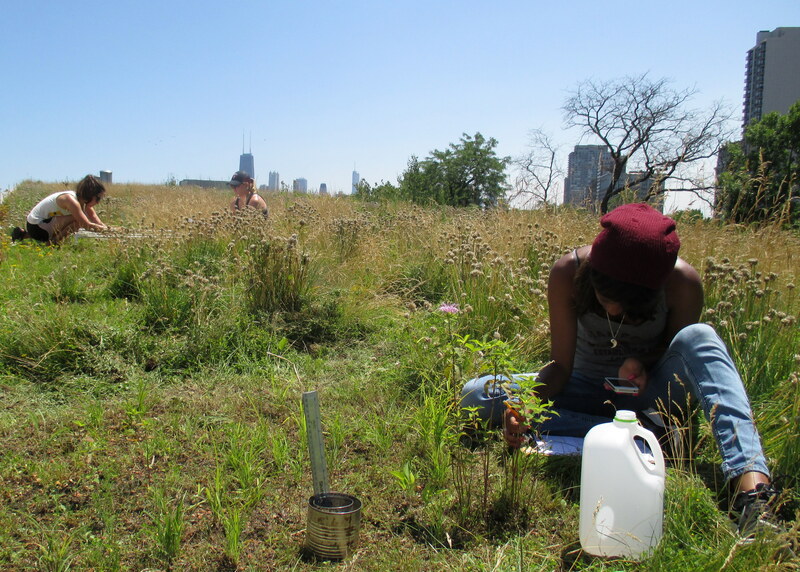 We are writing about the bees that we have collected on green roofs in Chicago over 3 summers. After we collected the bees we spent many months identifying which species each of them was and now we are using different mathematical tests to determine if there are any relationships between the types of bees and the types of green roofs where they were found. Do smaller bees live on smaller roofs? 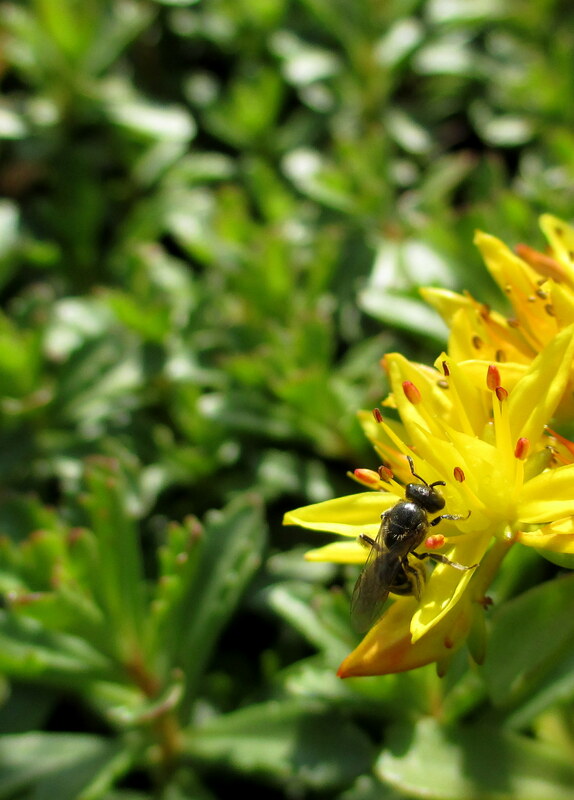 Will green roofs with more plant species also have more bee species? 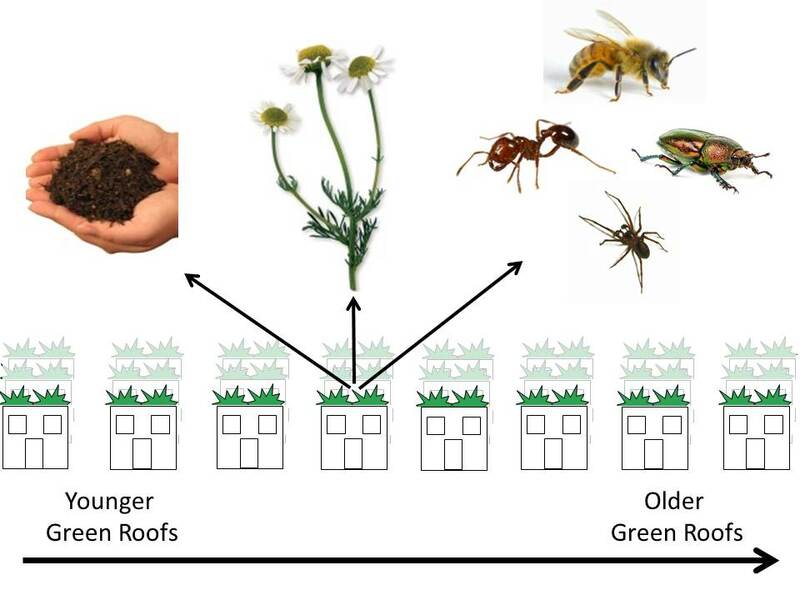 Will older green roofs have a greater number of bee species? Right now the answer to these questions is… I don’t know! My colleague and I are in the process of answering these questions and many more – I will update you when I know the answers. I am eager to find out! And finally, I started making some preparations for a very exciting stage in my research. In about a month I am leaving for a research fellowship in Germany! For 10 months I will be working with a green roof scientist to learn more about how the types of plants and animals that you find on green roofs can change as time goes by. I will live in a dorm room on a university campus and I will take an intensive language class so that I can get better at speaking with the German people about my research. I am excited to bring you more updates about this project in the future! Welcome to the first entry of my research blog! Each month, I hope to share the progress of my work with you. If you ever have questions about what I’m doing, send me a message at kellyksiazek2011@u.northwestern.edu – I love to get emails! October was a pretty busy month but here are some of the highlights. The first week I spent in Columbus, Ohio at an international conference called “EcoSummit” where over 1500 people from around the world met to talk about the global state of ecology research and policies. I attended many lectures where scientists talked about their research. I was really looking forward to meeting scientists that I’ve heard about from reading their books or other publications –it was like meeting celebrities! I went on a field trip where I learned about some of the sustainable businesses in Columbus and saw a really thought-provoking art exhibit where artist Aurora Robson created beautiful sculptures out of discarded plastic that would otherwise end up in landfills. But the best part of the conference was attending a special session about green roof ecology where I talked about my research and got to learn about a lot of similar experiments happening in the U.S. Canada and Australia. I was a little nervous about speaking in front of group of scientists who have more experience with research than I do but I was prepared and it turned out really well! 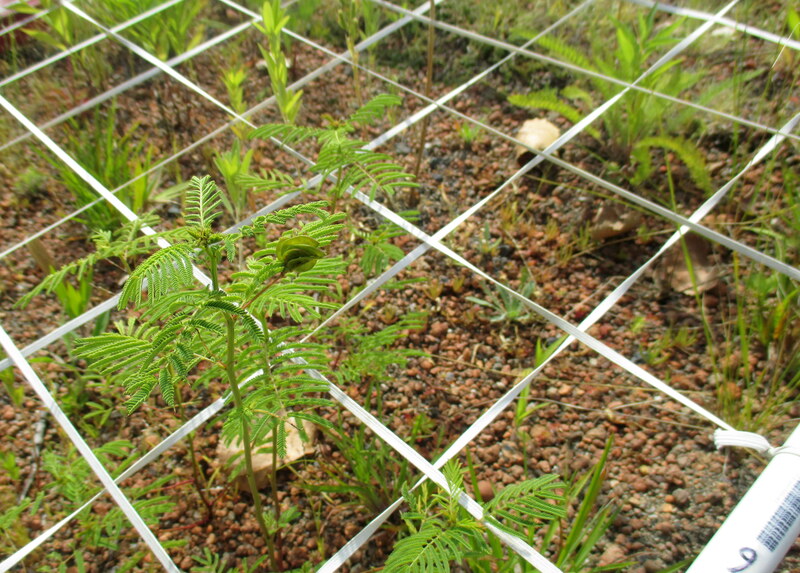 I used a 100-square grid to plant native prairie seeds on green roofs in a very precise pattern. When I returned from Columbus, I got right to work on setting up a new experiment that I am conducting on green roofs in Chicago. 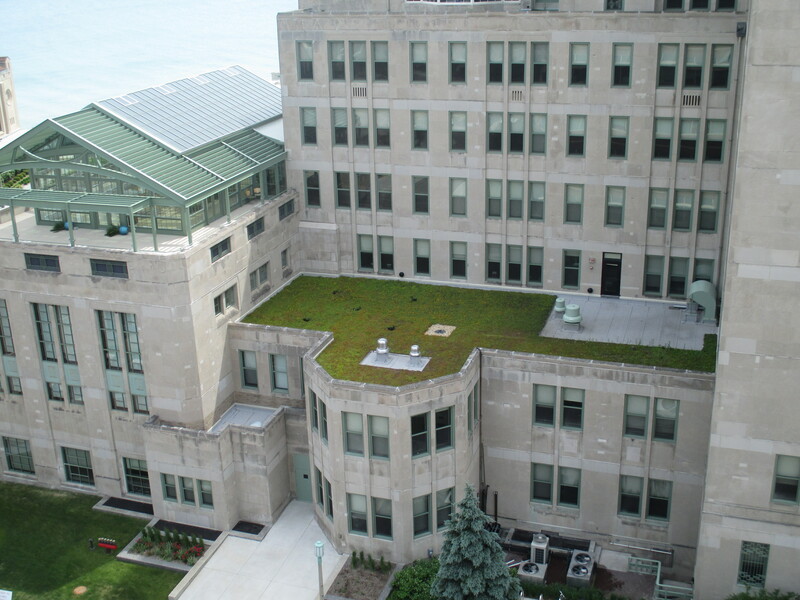 Green roofs can be really hot, windy, and dry places with very little soil compared to the ground. This turns out to be a very rough place for plants to live! This past summer, I went to similarly harsh places on the ground around Chicago to learn which local plants were able to survive. For my new experiment, I am planting seeds from these species on green roofs in hopes that those plants will be hardy enough to survive. These native (they occurring naturally in the area) species of wildflowers and grasses also have the benefit of providing resources like food and nesting material to local birds and insects. As a scientist, I am trying to stay very organized about how I select species and how many I plant so I made a large grid that I can place over my plots to keep track of where I am planting each seed. Planting almost 10,000 seeds this way was tedious work but it will be much easier to keep track of the plants once they start growing in the spring (at least I really HOPE they start growing!). After I was finished planting all my little seeds, I attended another conference, hosted by Green Roofs for Healthy Cities. This conference was in Chicago and I was part of the organizing group. 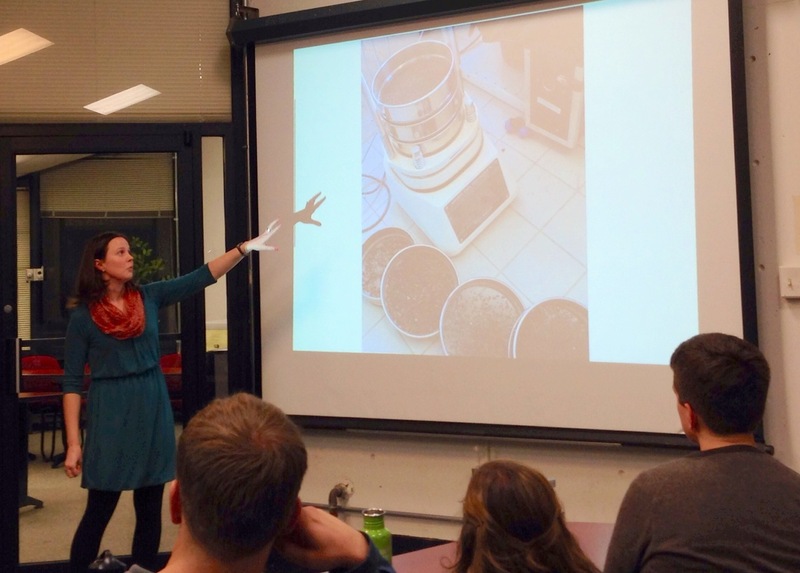 I helped to create a networking and demonstration event for students to talk about their green roof research. I was a presenter at this event too and it was fun to use some of the skills I learned at the BIA Fellows weekend to participate in informal conversations about my research tools and discoveries that I’ve made so far. Like most other conferences, there were also plenty of lectures to attend and I got to meet a few more of those science celebrities I was talking about before! Now that the weather is getting colder and I don’t have any exciting conferences to attend, I will be spending a lot more time working at the Chicago Botanic Garden and attending classes. But you’ll have to wait to hear more about that in next month’s update.